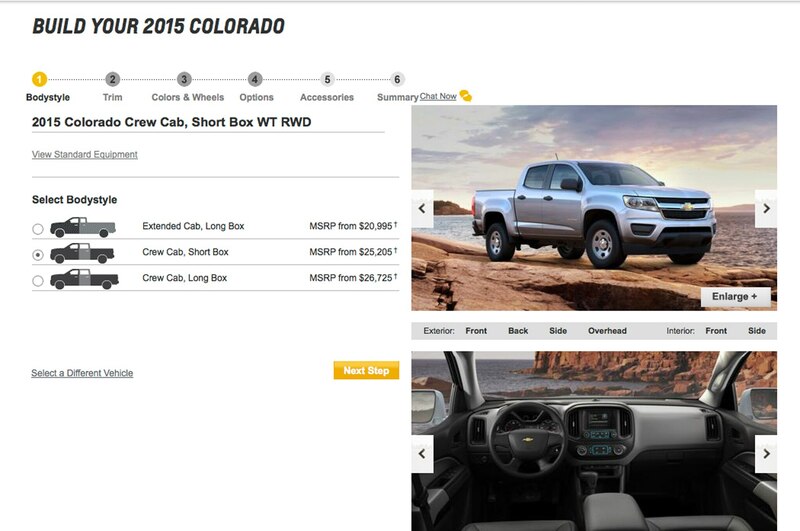 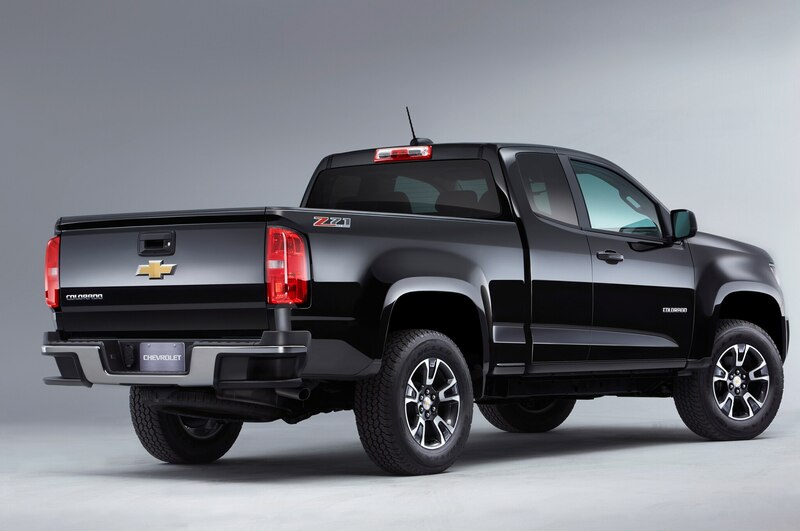 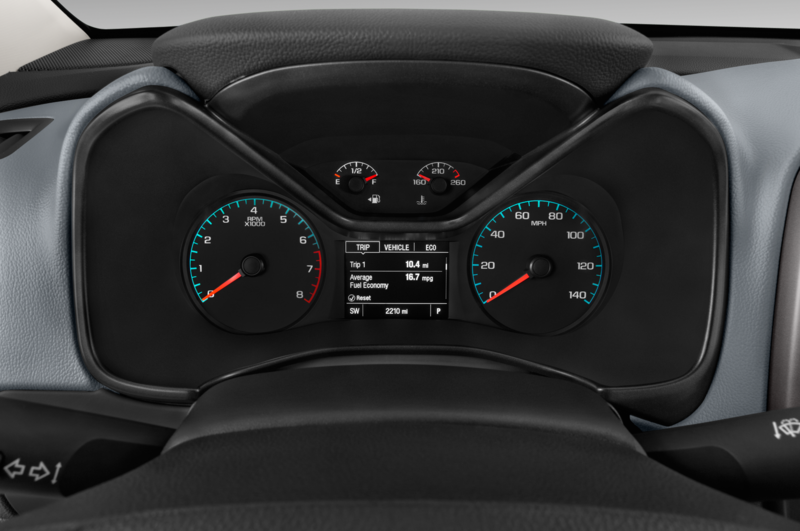 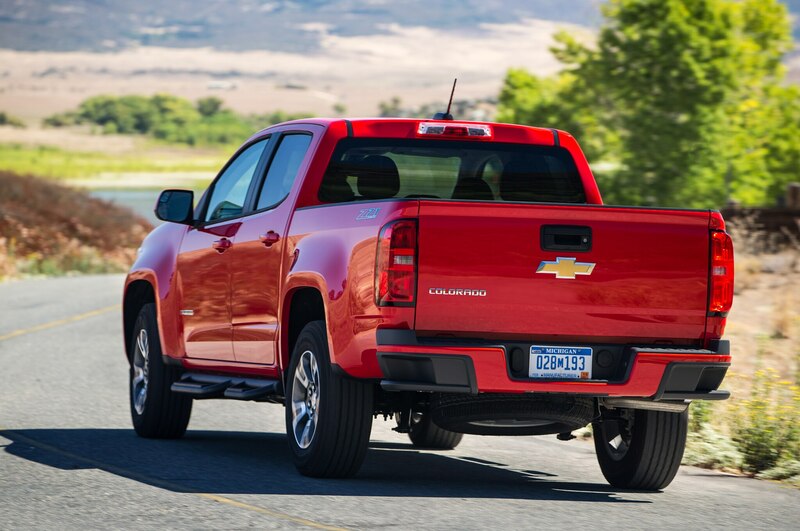 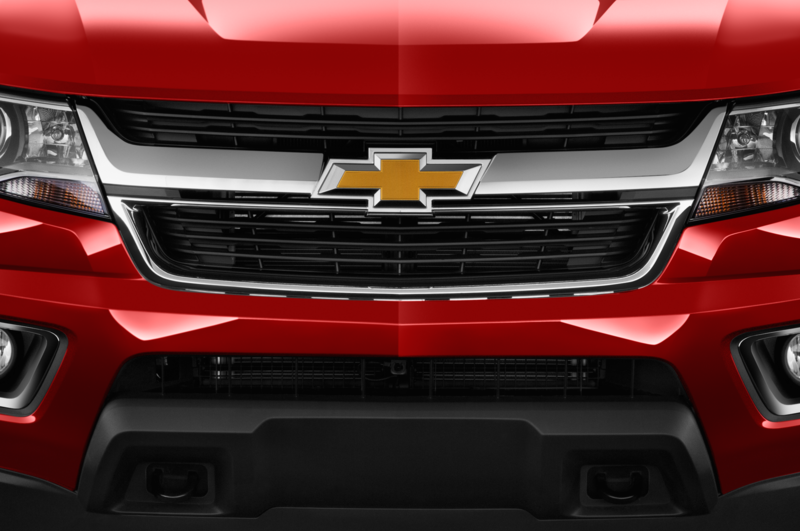 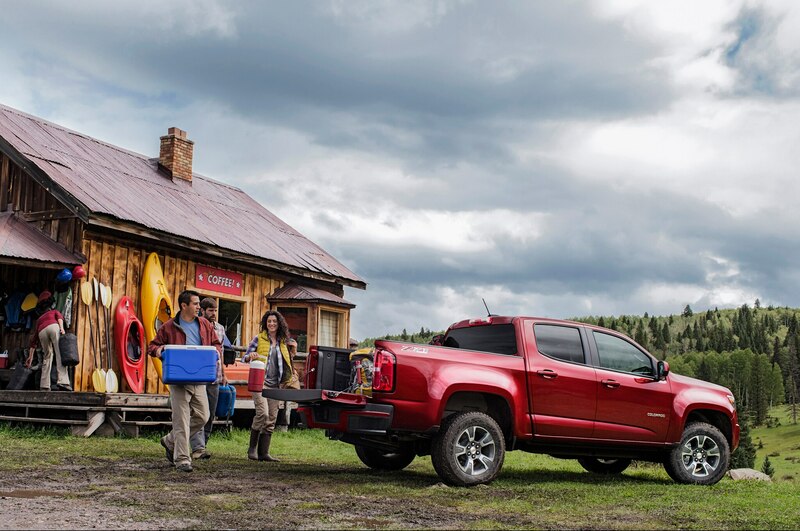 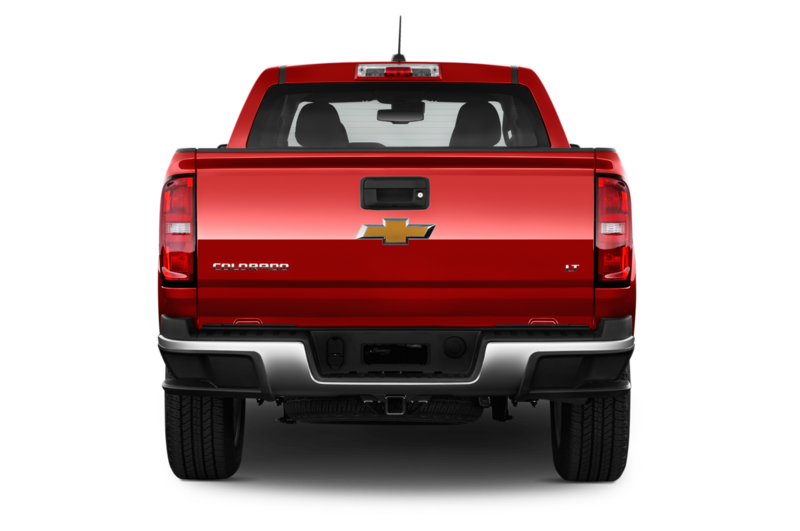 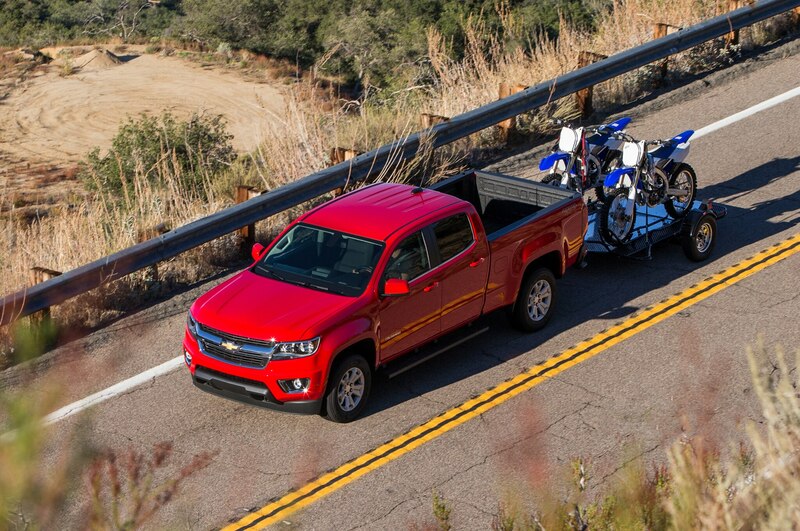 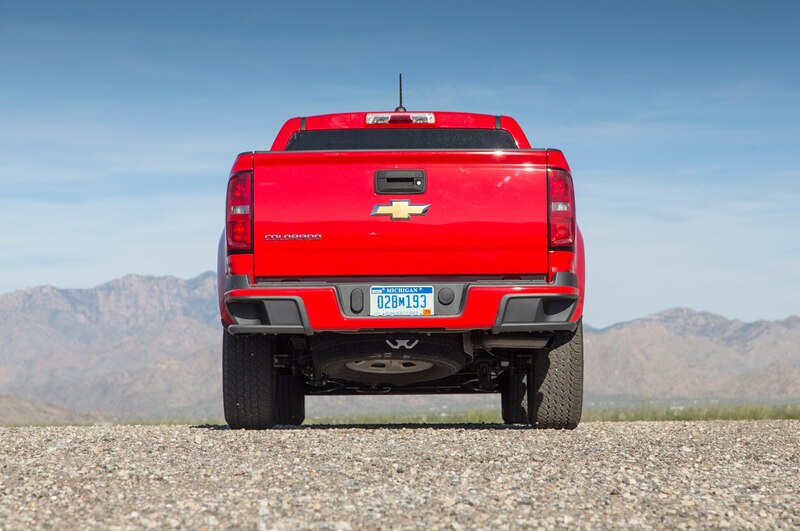 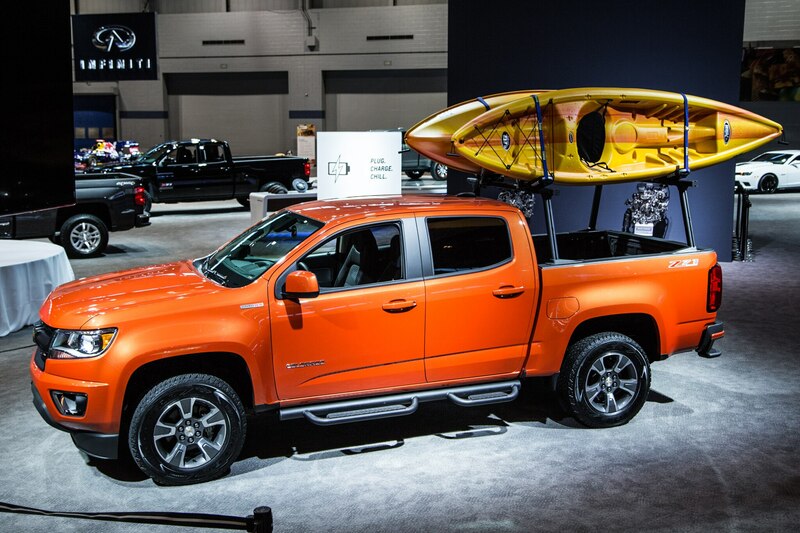 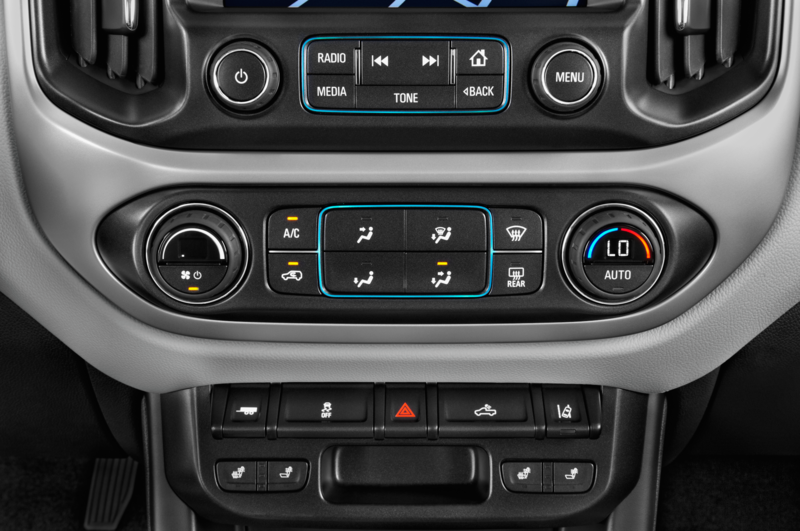 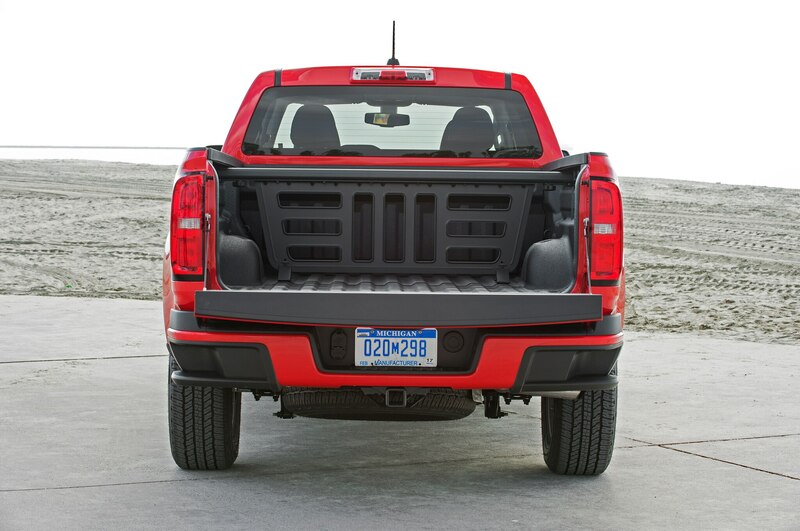 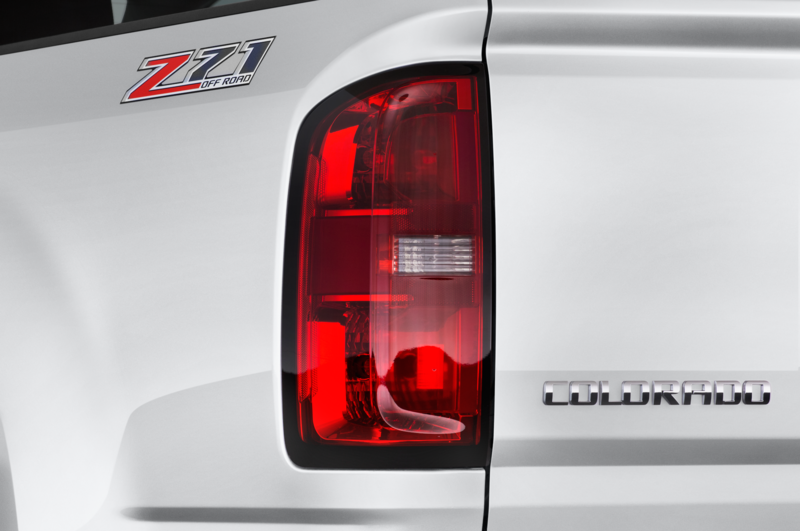 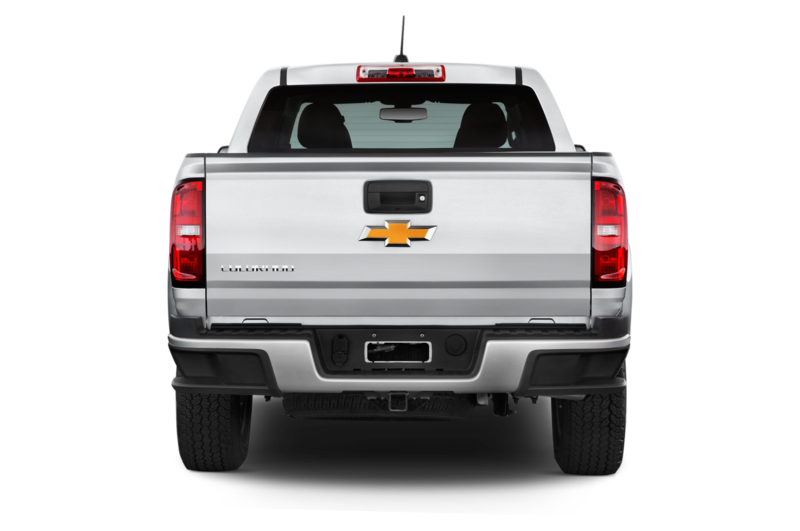 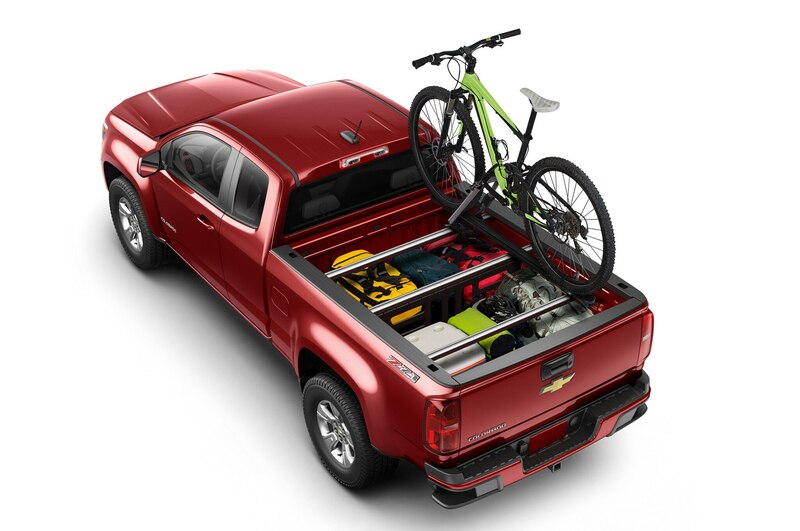 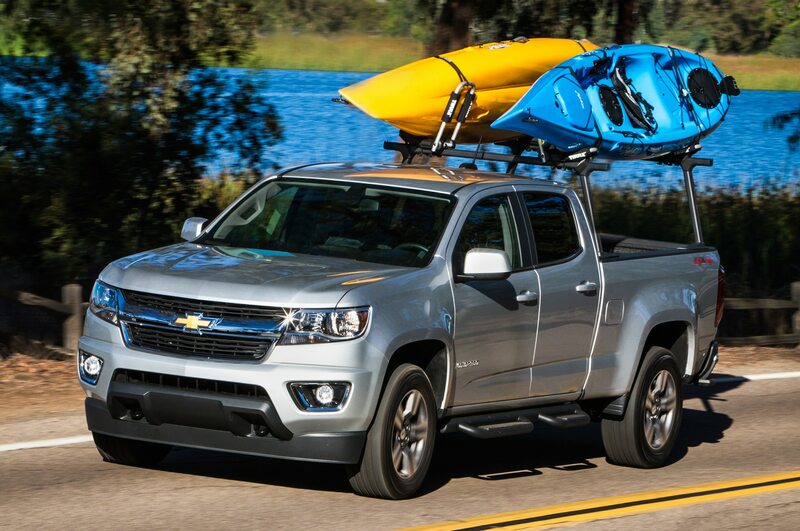 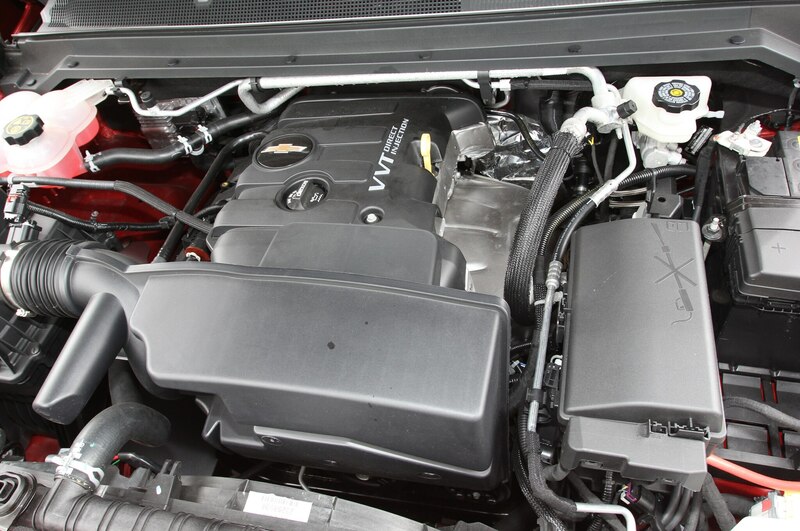 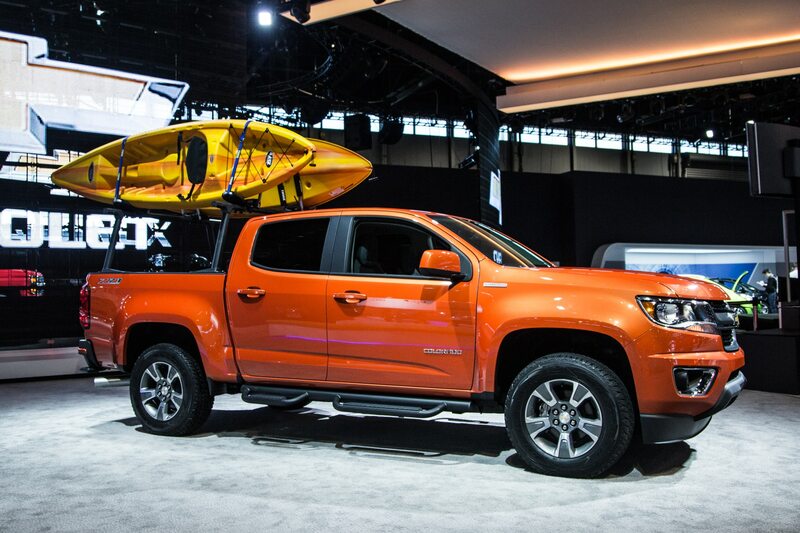 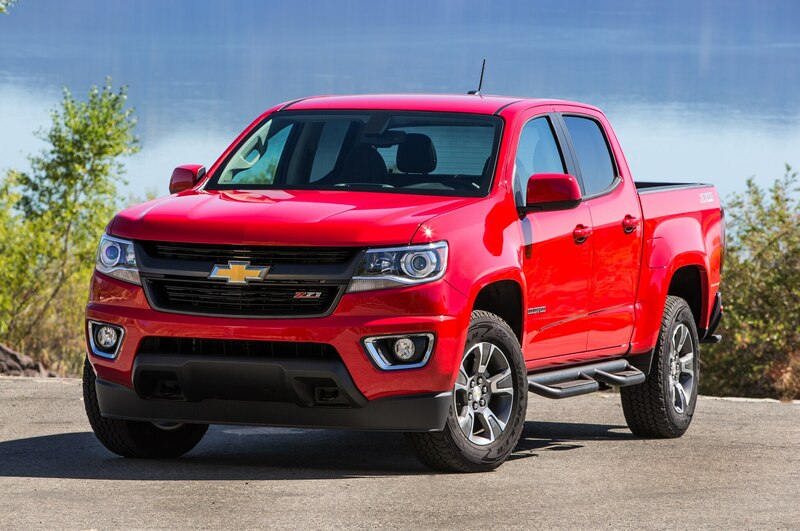 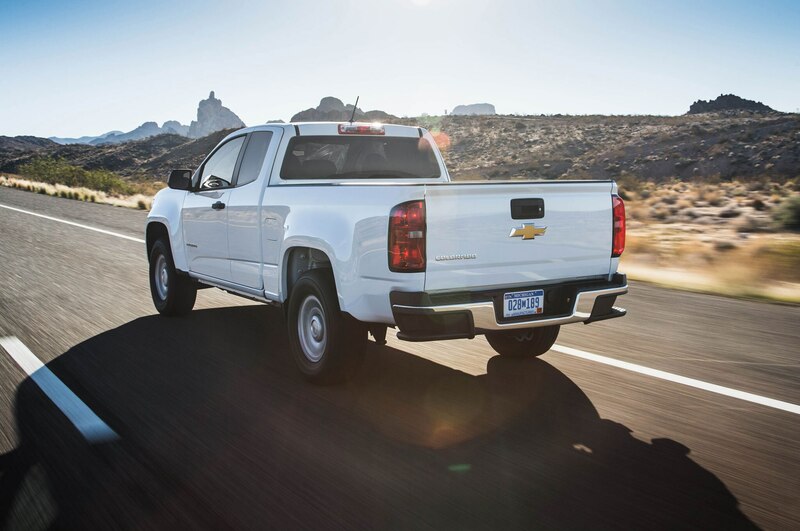 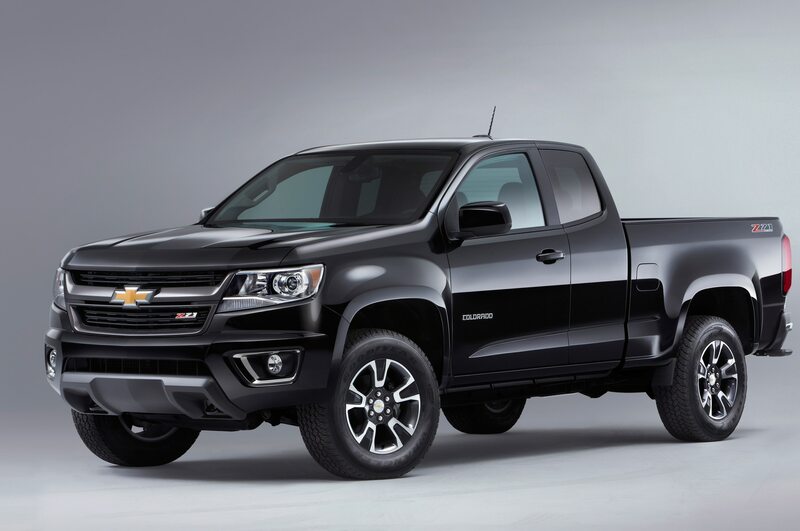 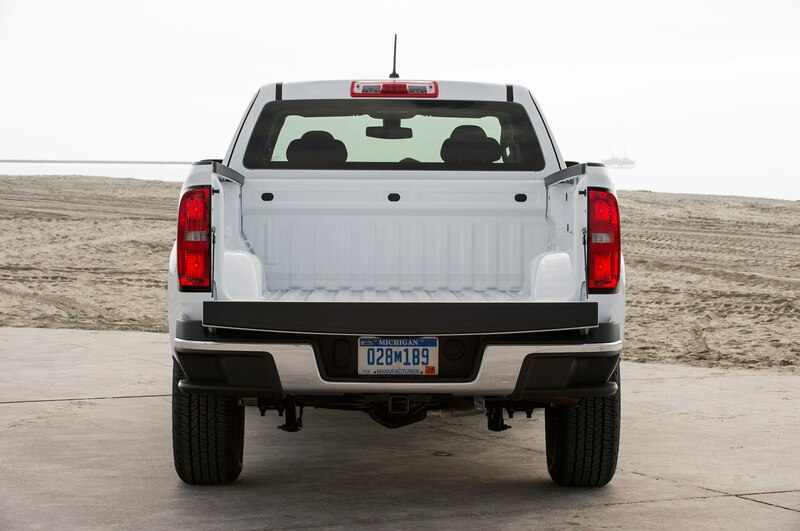 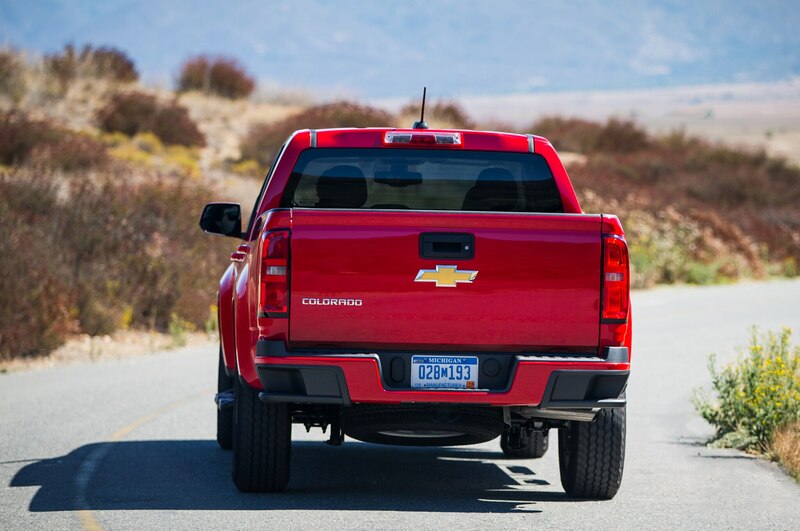 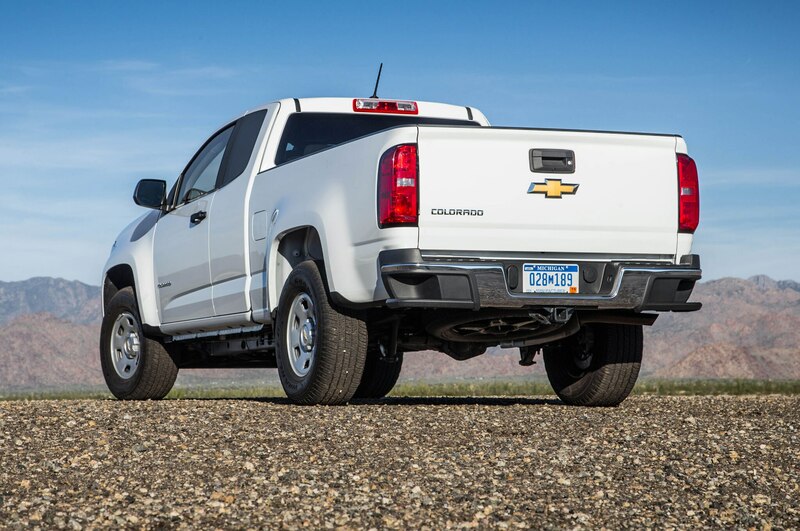 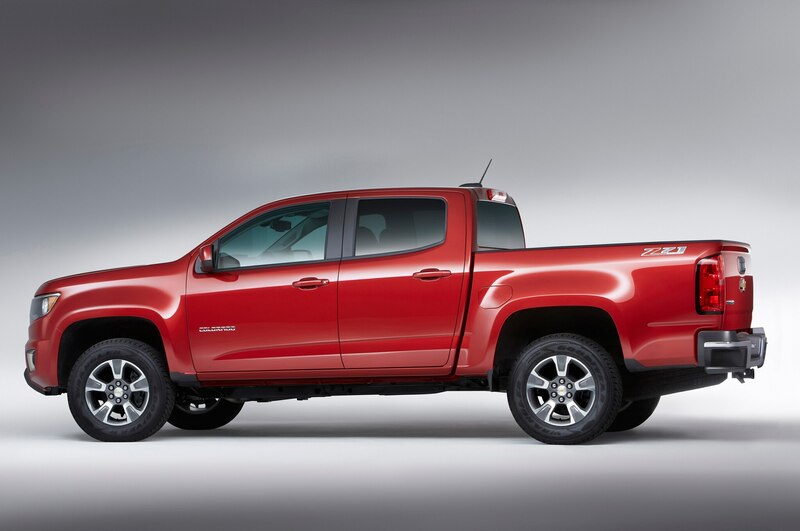 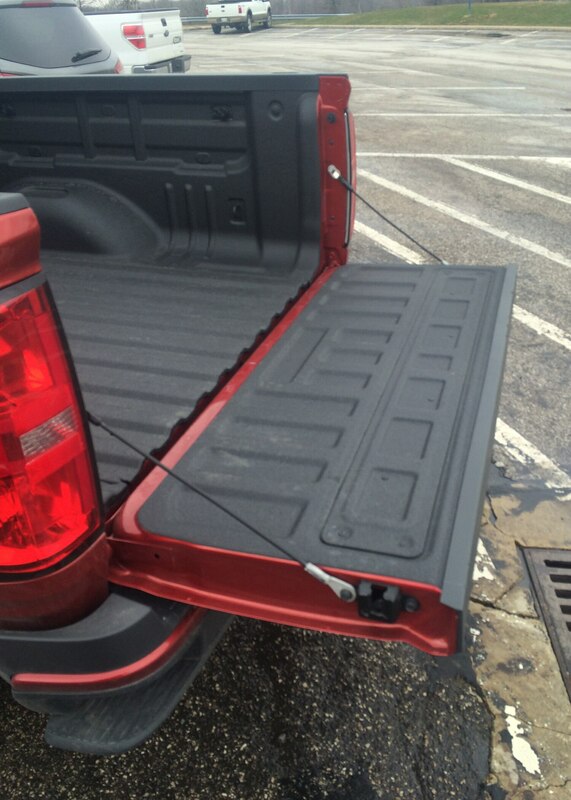 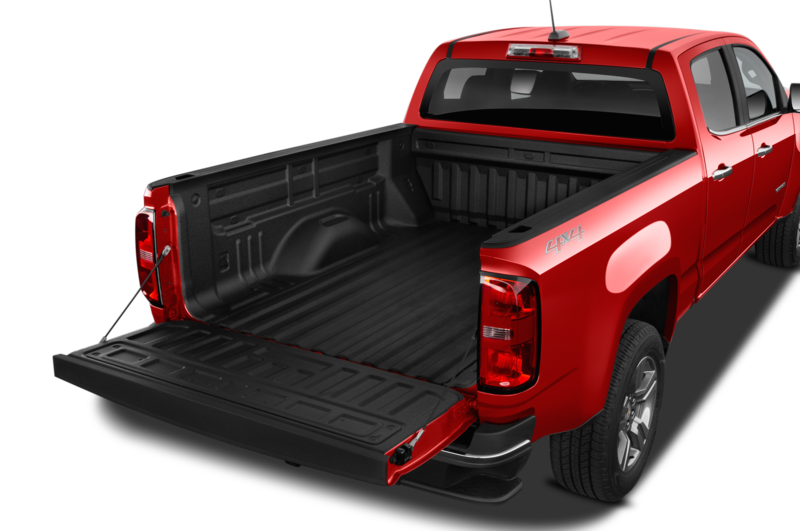 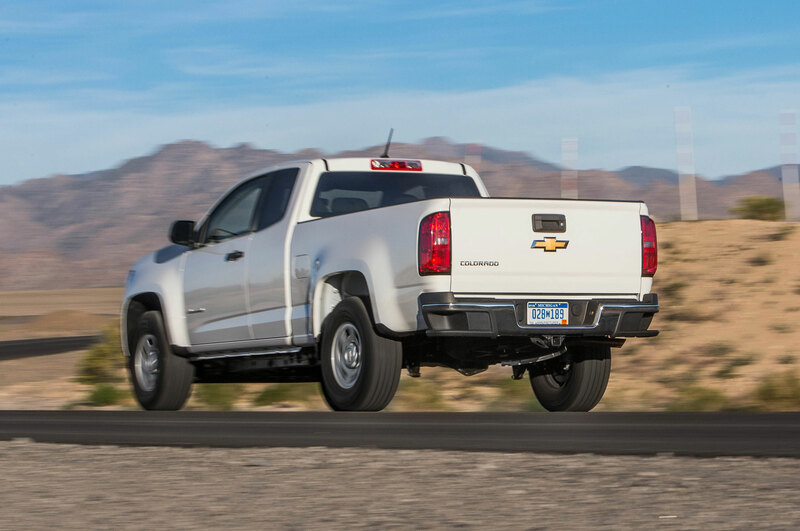 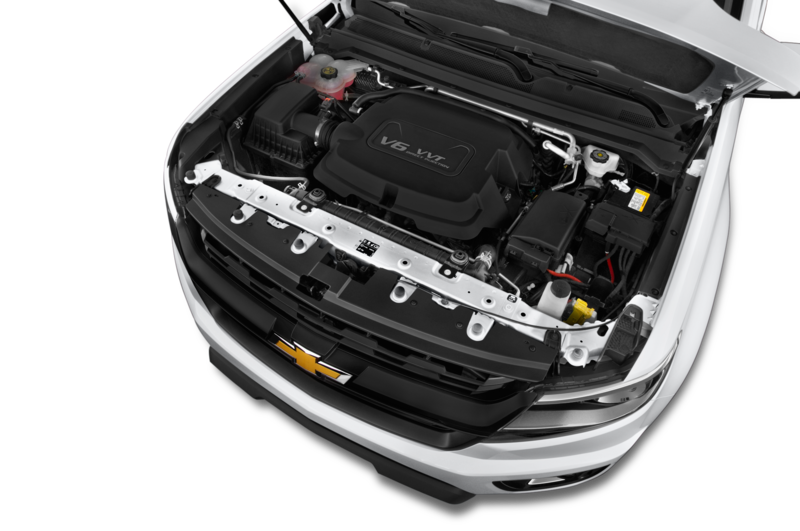 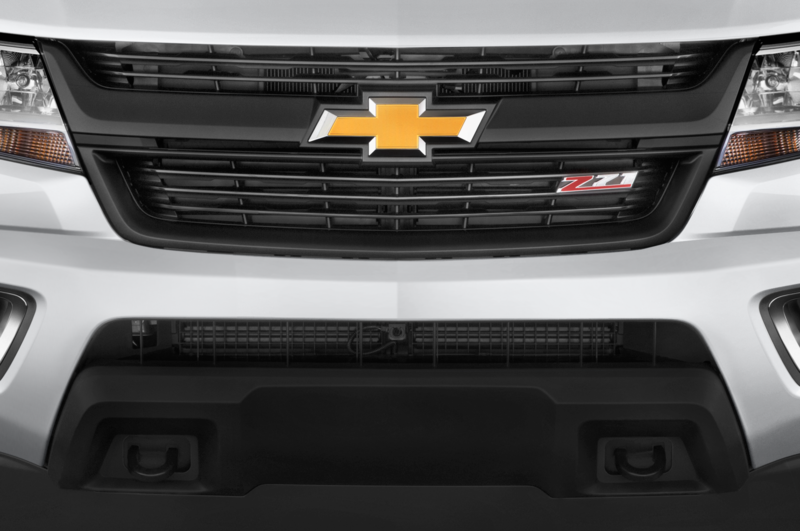 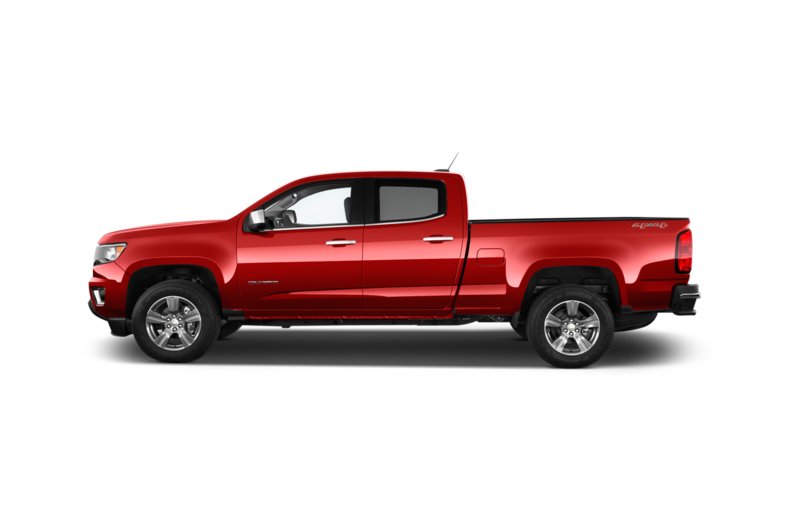 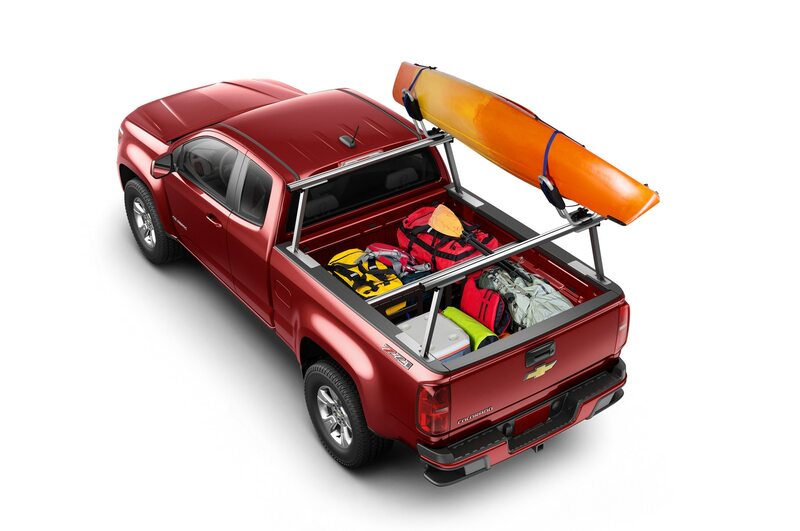 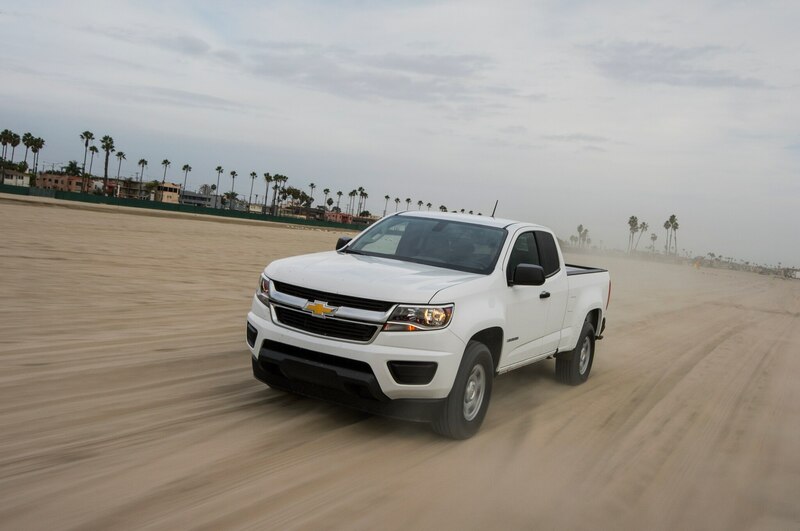 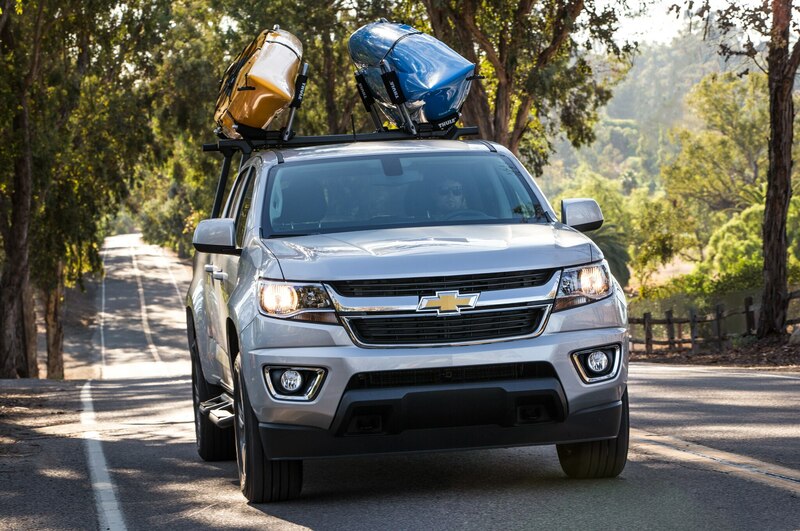 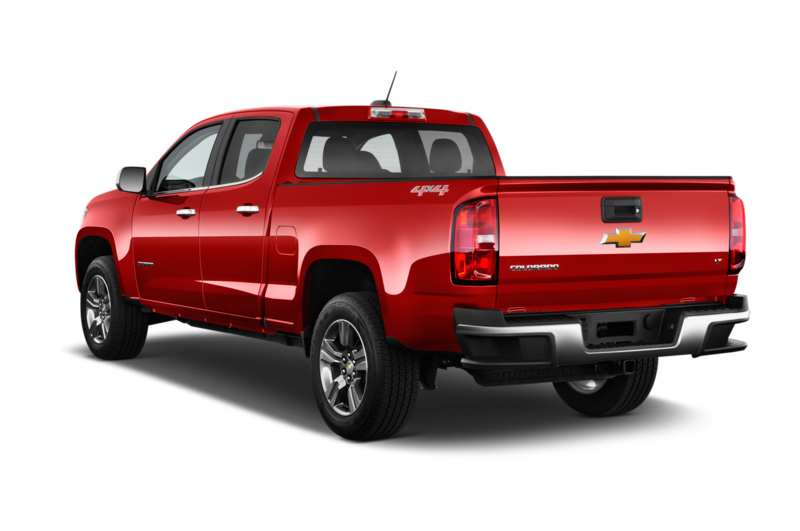 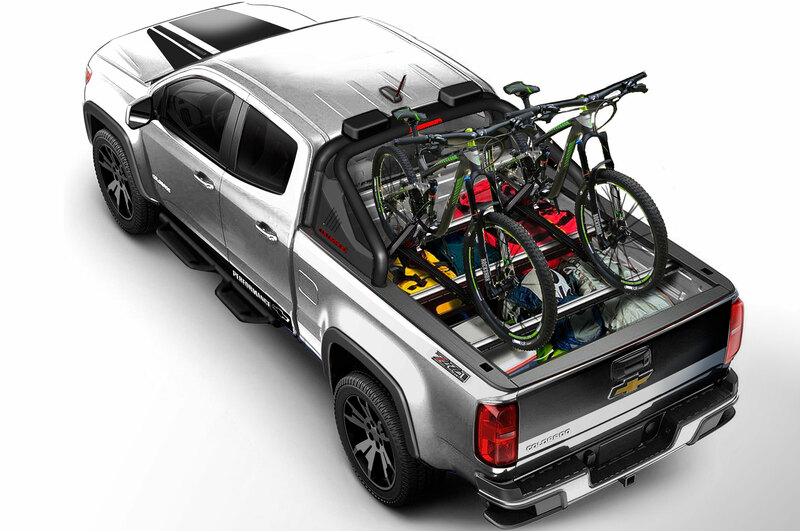 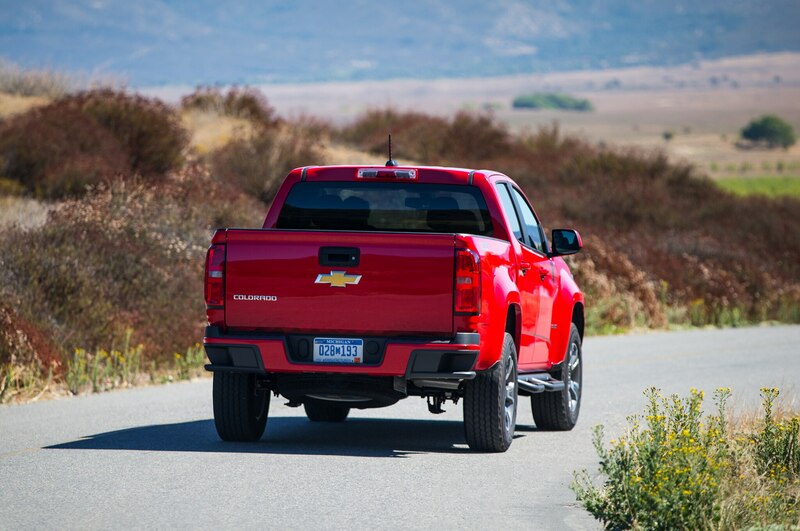 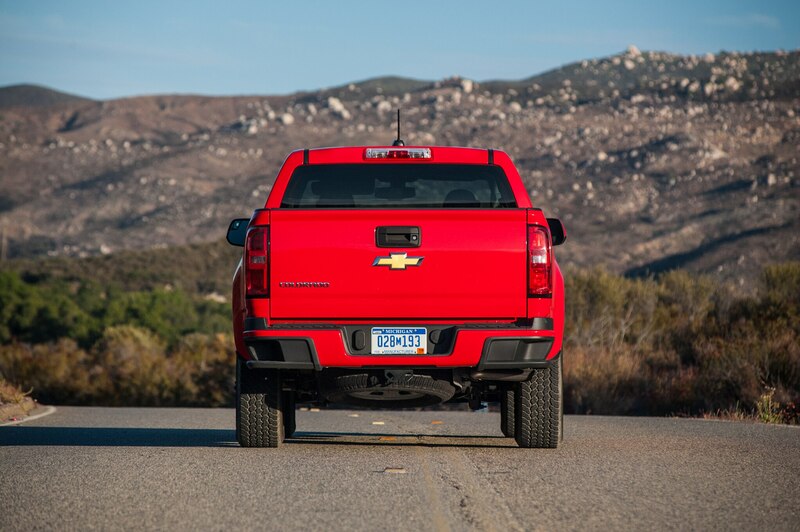 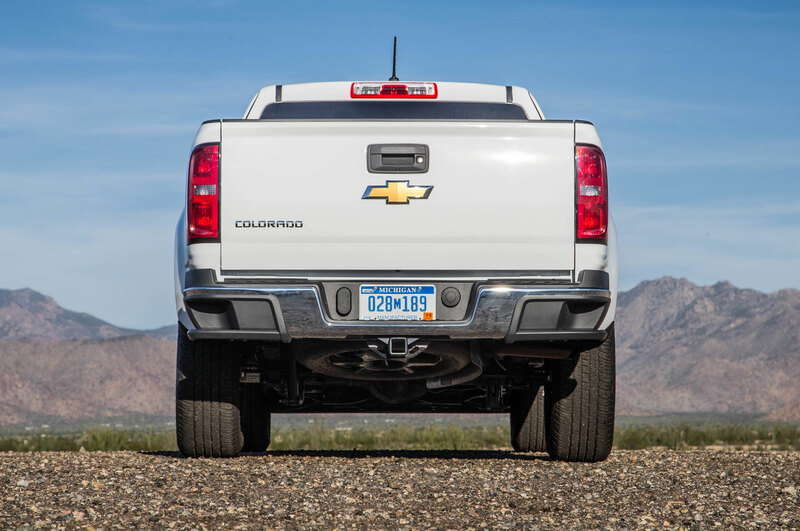 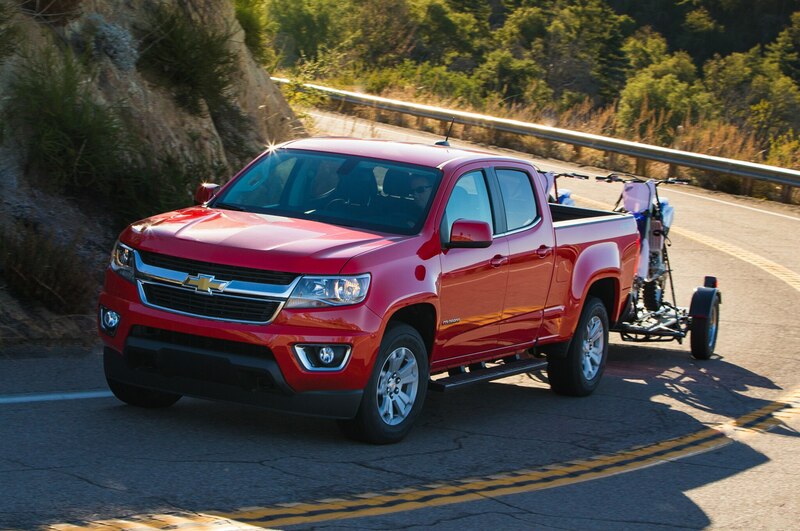 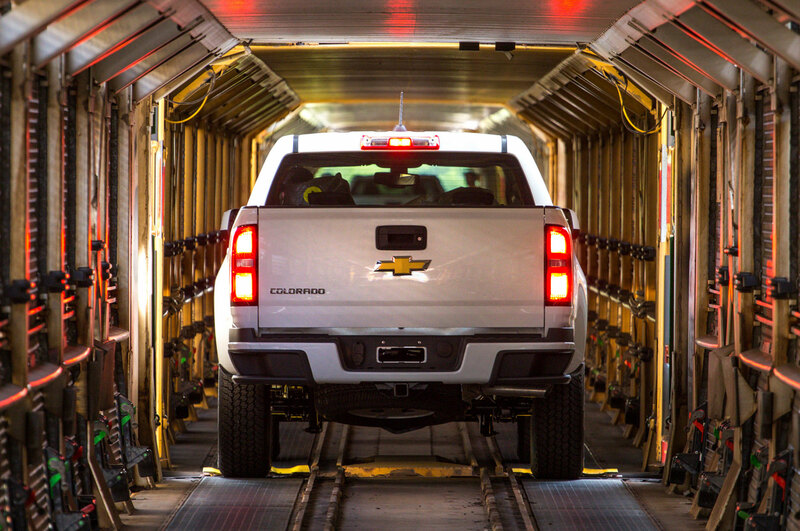 For those in the market for a bare-bones work truck, the 2015 Chevrolet Colorado checks most of the right boxes. 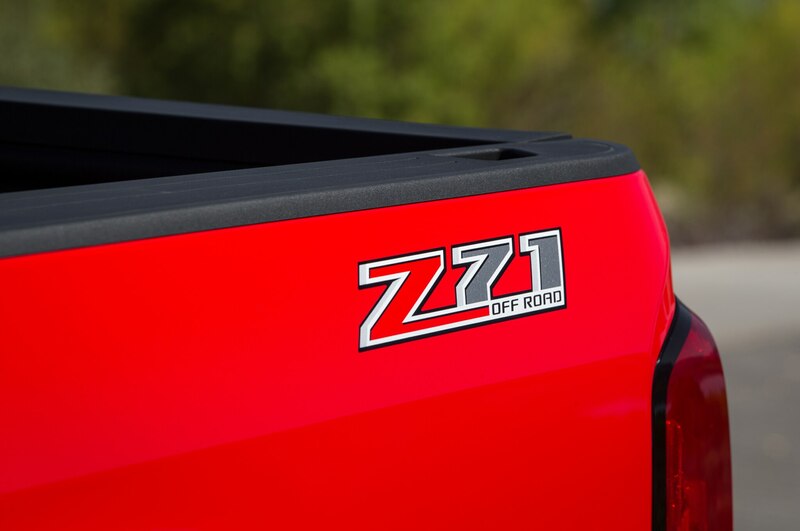 It’s solid and affordable, with a quiet, smooth power delivery and just enough capability to haul, tow, and get you to the job site on time. 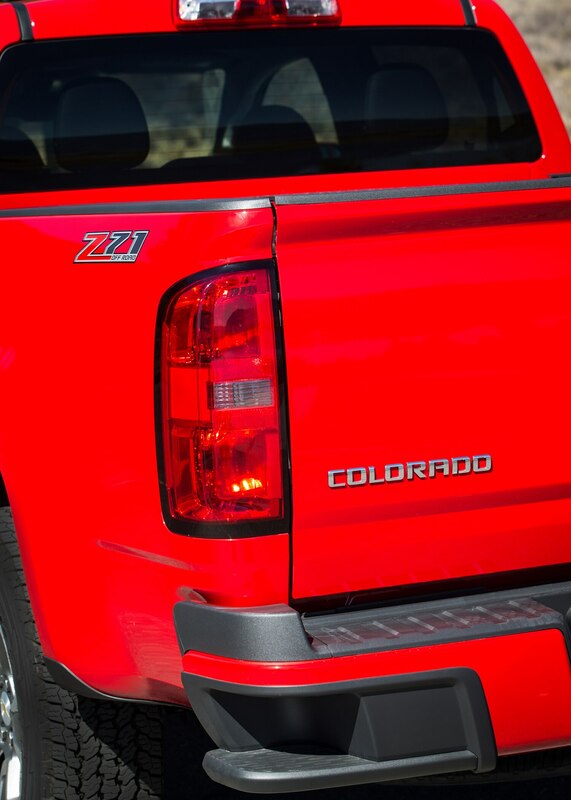 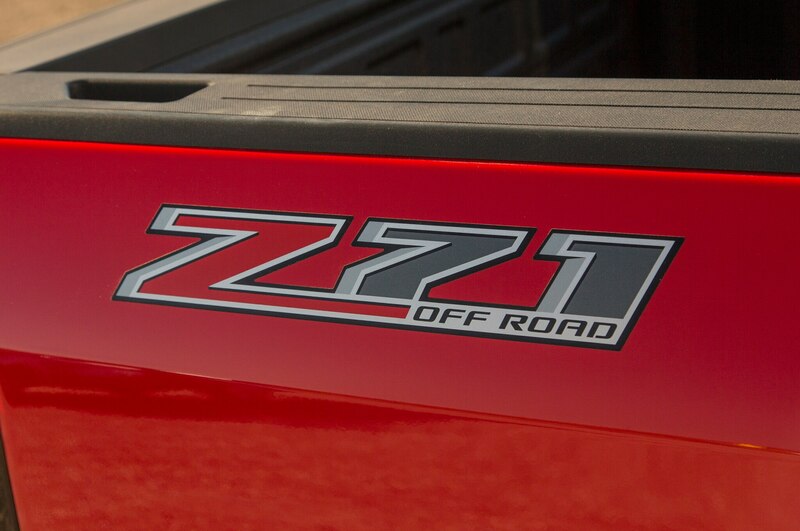 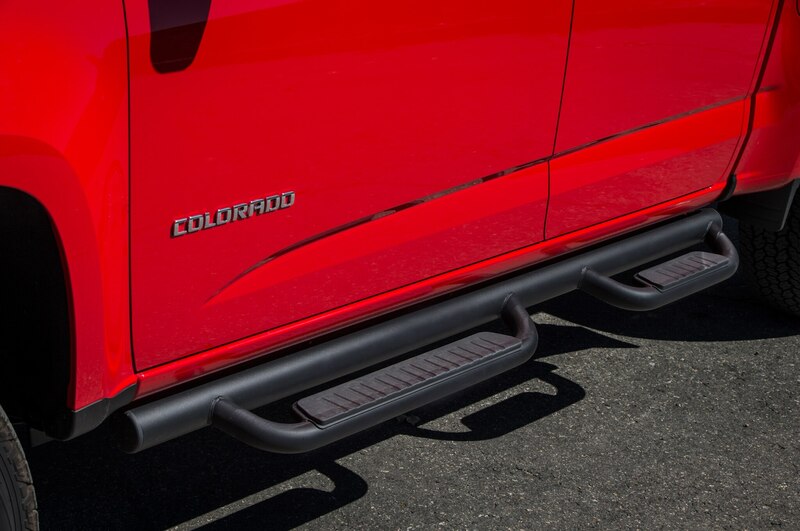 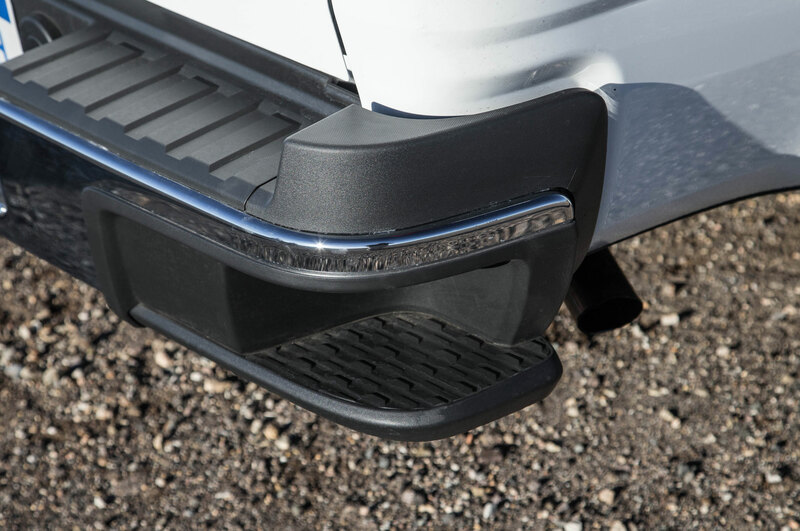 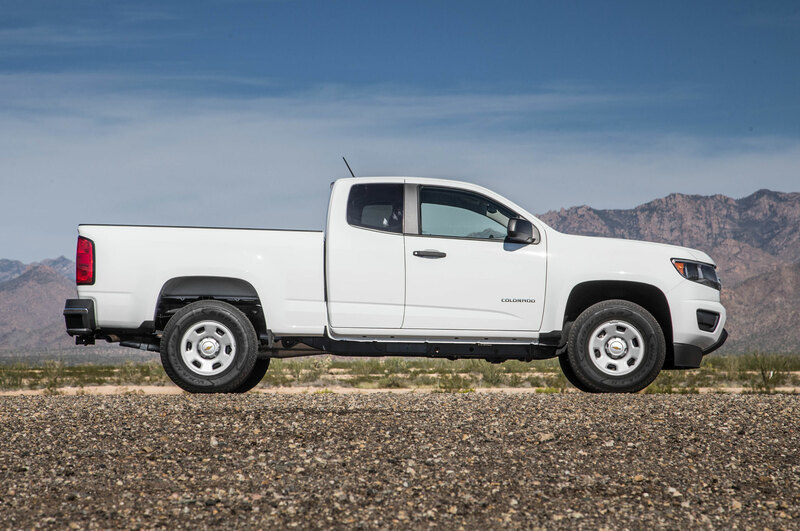 The Colorado’s less savory points — a lower towing limit than similar pickups and an unreasonably small back seat in the extended cab to name two — can be waved away as a matter of preference. 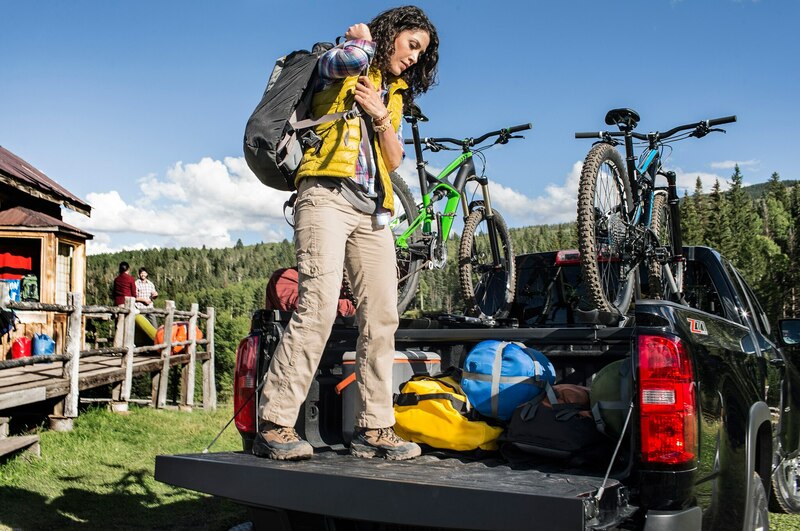 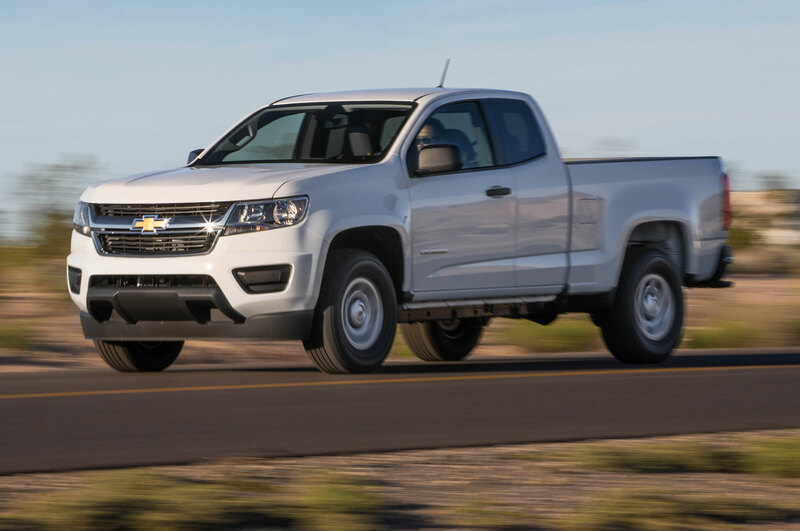 But after a week tooling around in the Colorado, we couldn’t get away from the nagging feeling that even in its most stripped-down configuration it’s a small truck trapped in a bigger truck body. 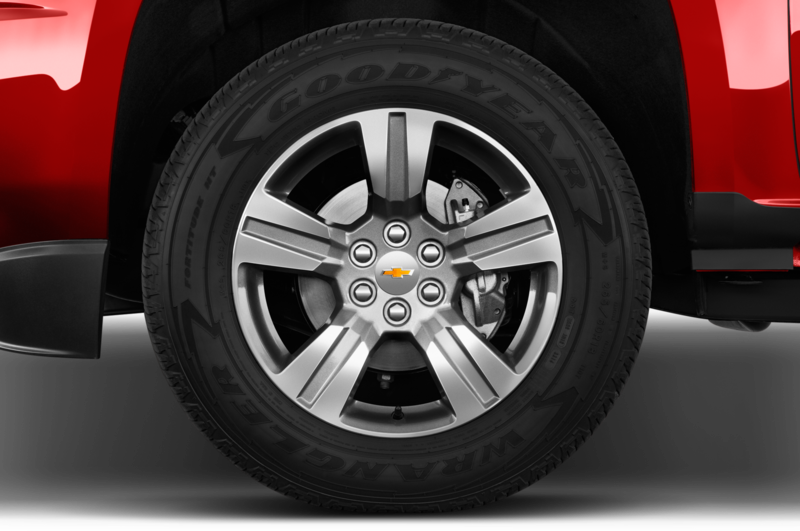 That comes with some compromises as well as some advantages. 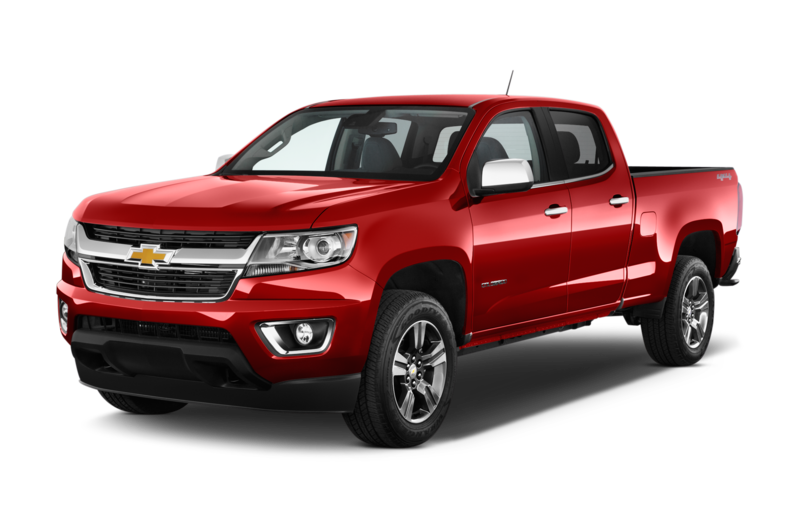 The Bow Tie’s new midsize truck offering certainly appeals on the economic front – at least the 2015 Chevrolet Colorado 2WD Extended Cab work truck we had in recently for testing. 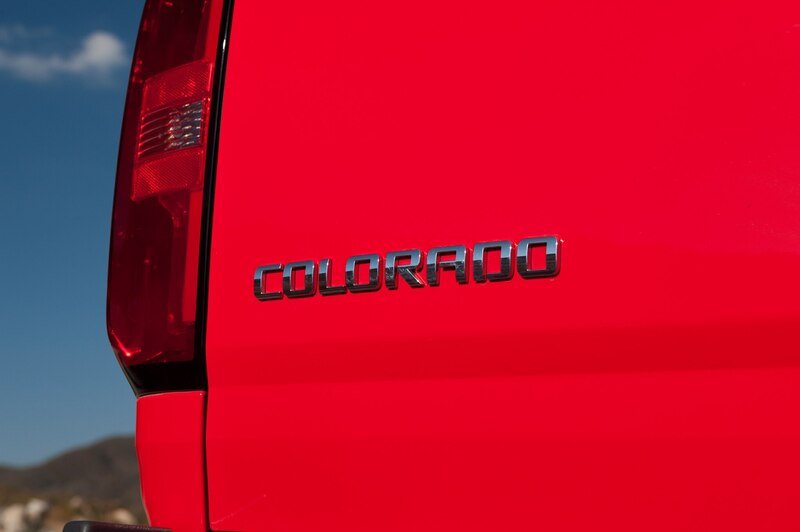 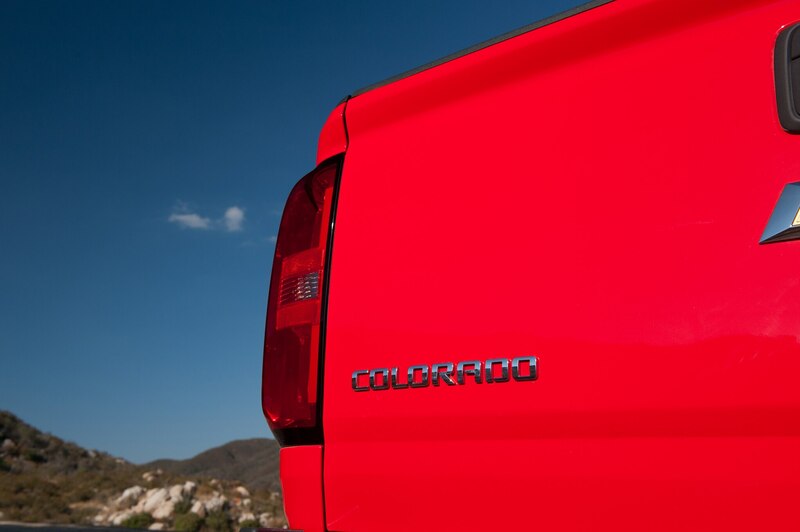 With a base price of $22,650, this particular Colorado can easily squeeze into many a DIYer or small businessman’s budget. 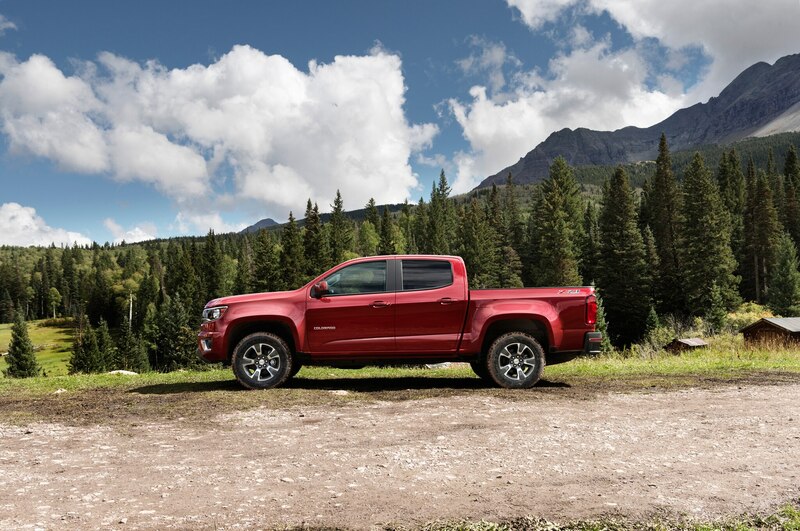 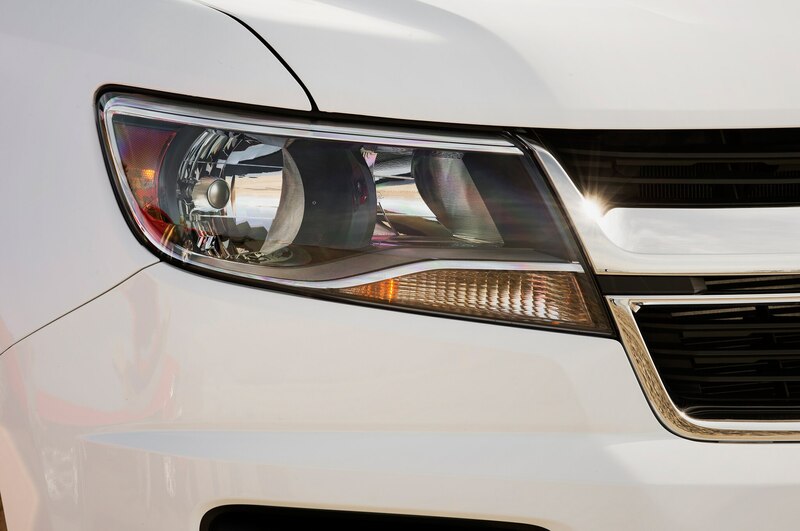 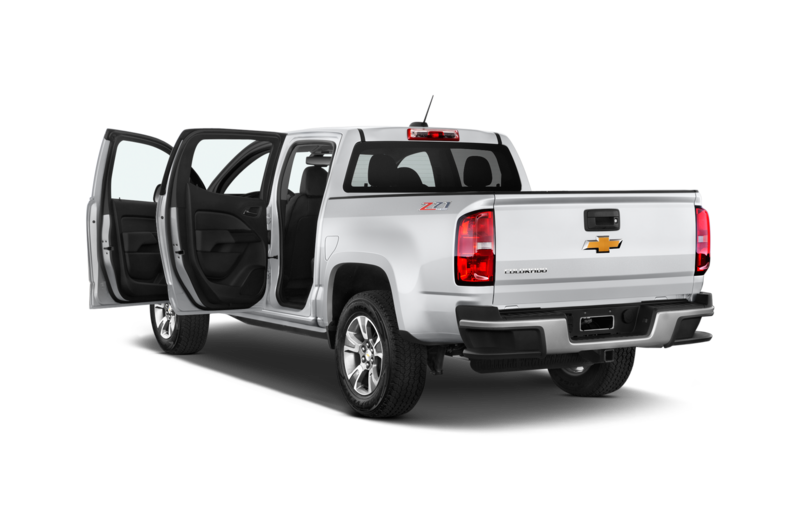 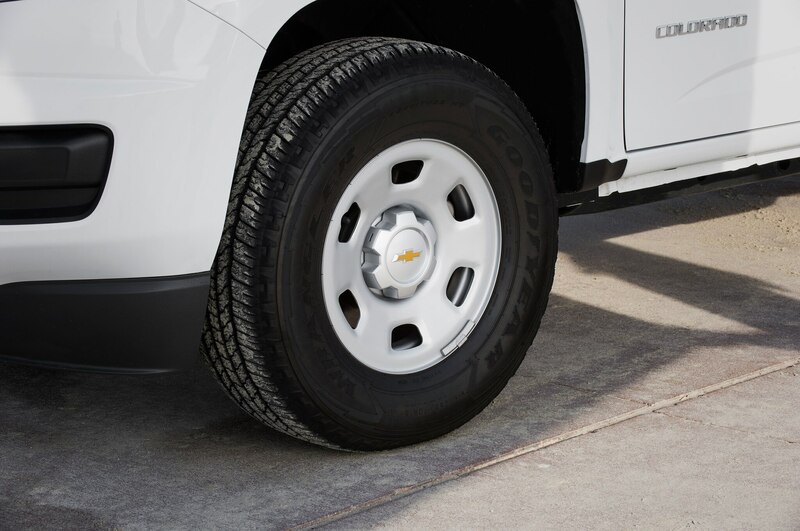 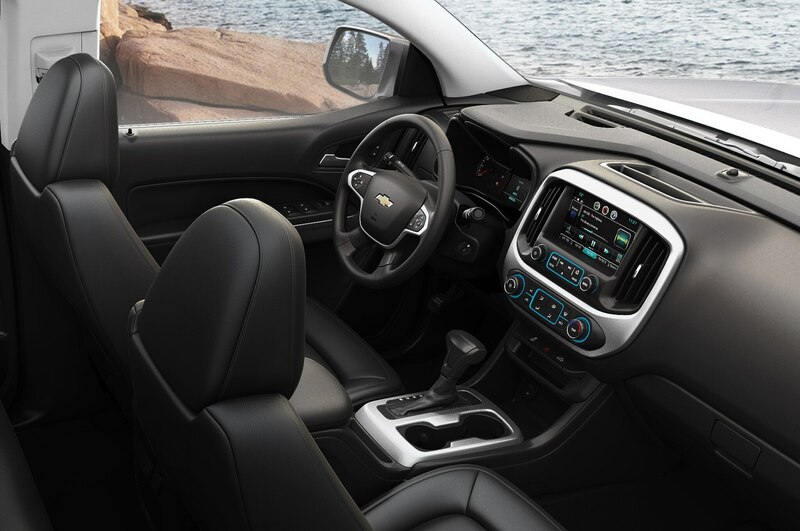 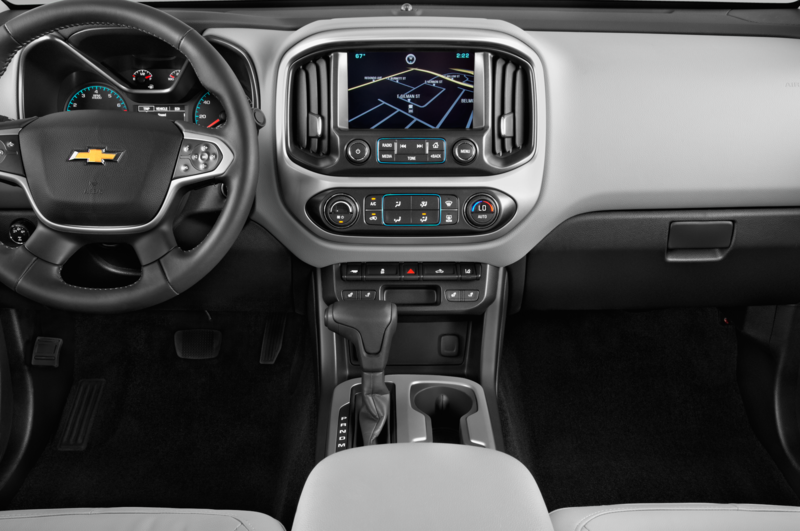 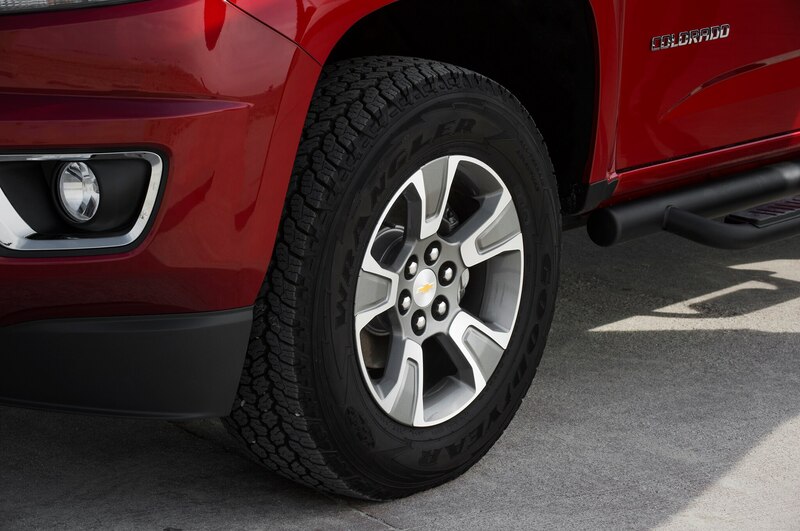 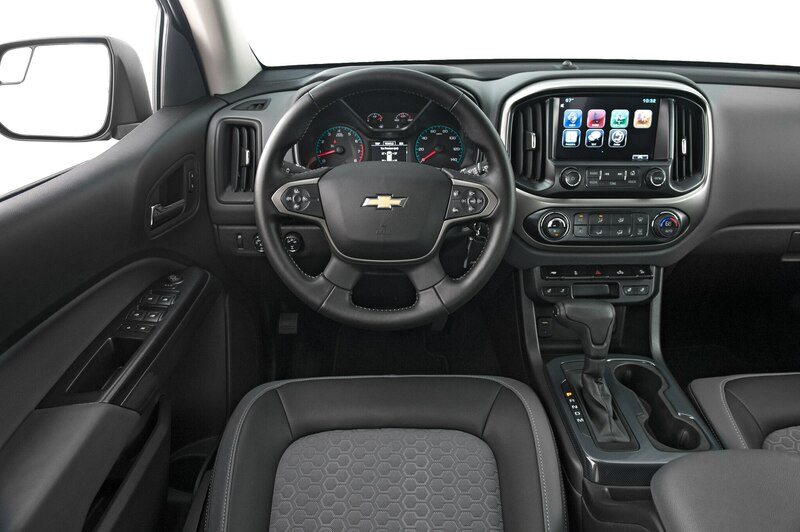 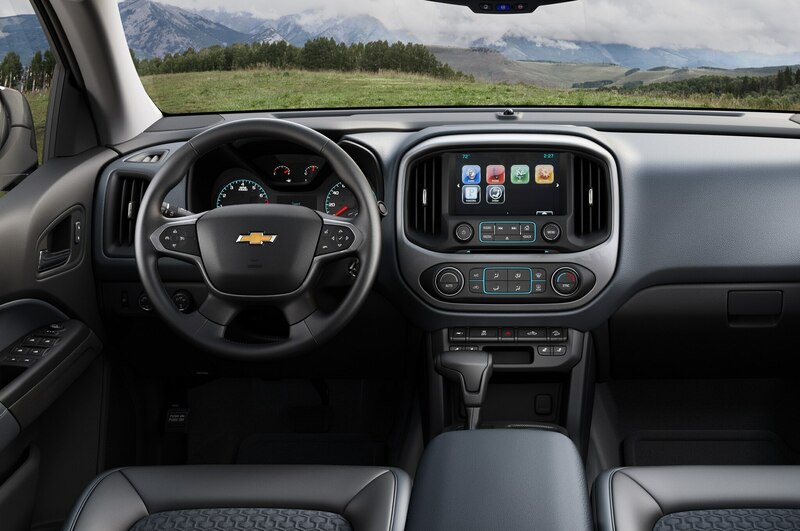 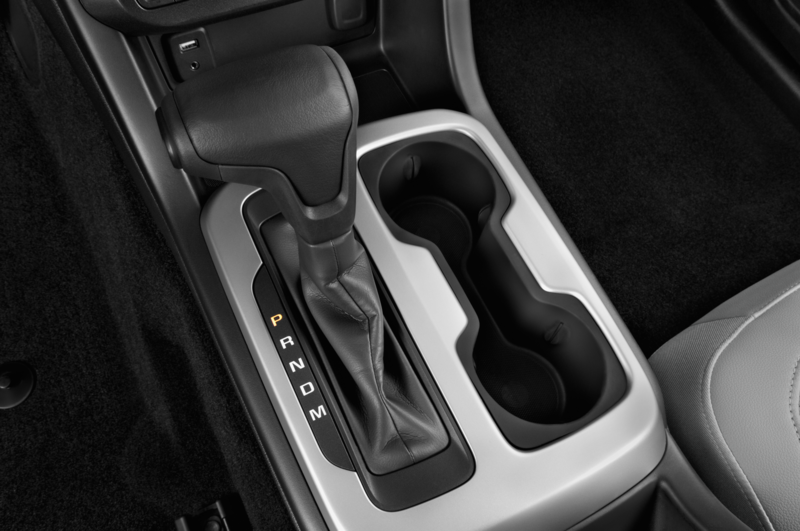 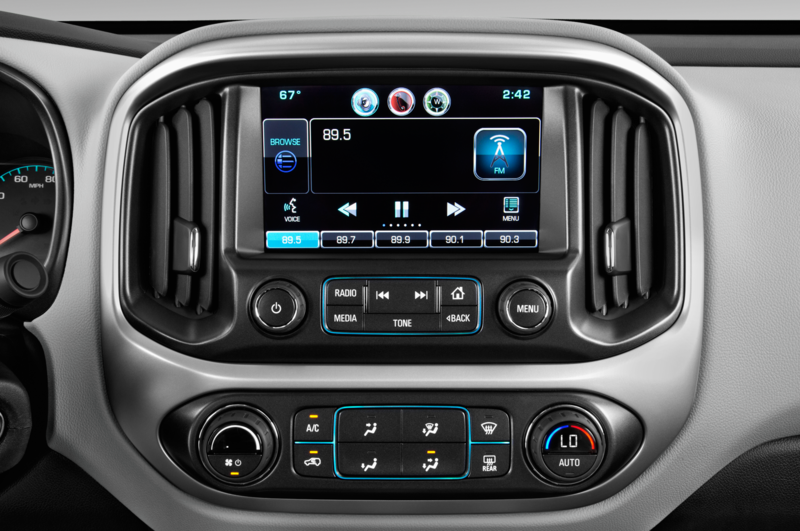 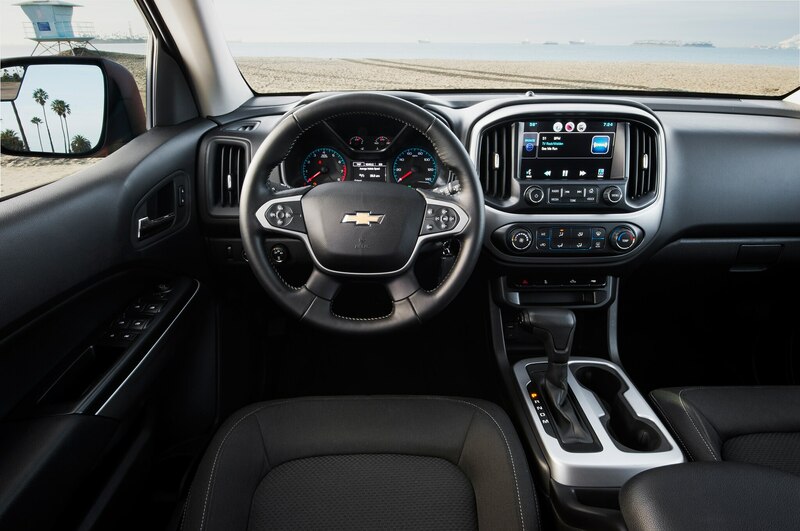 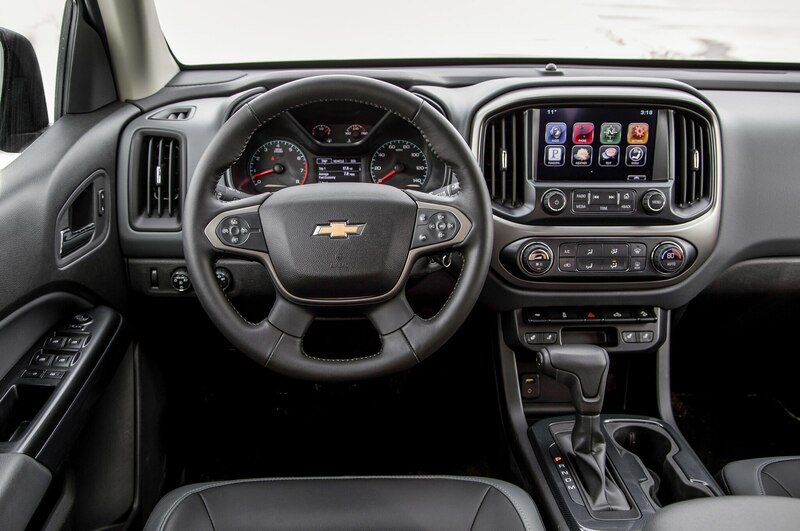 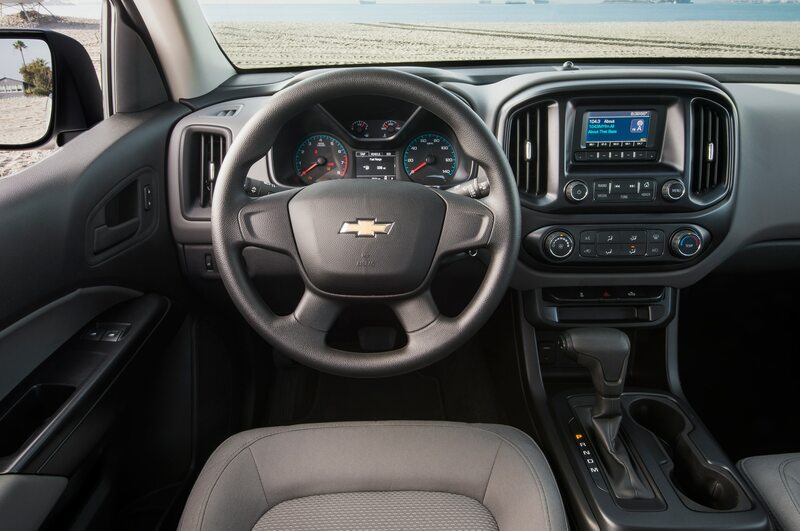 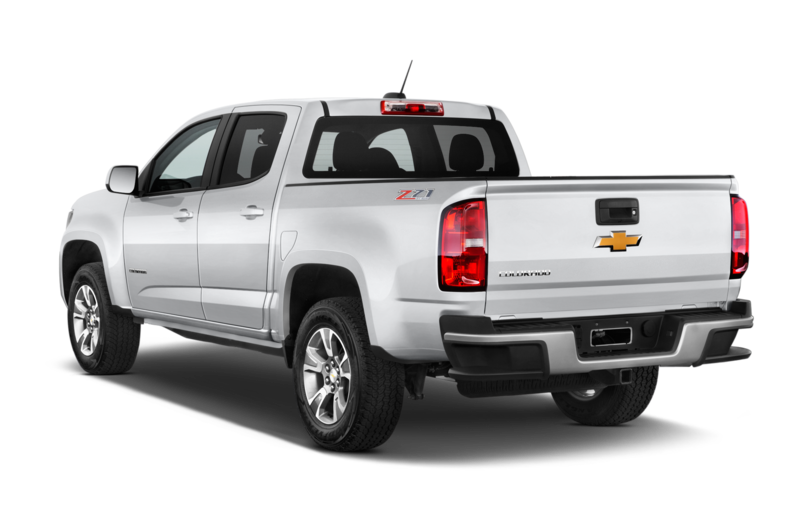 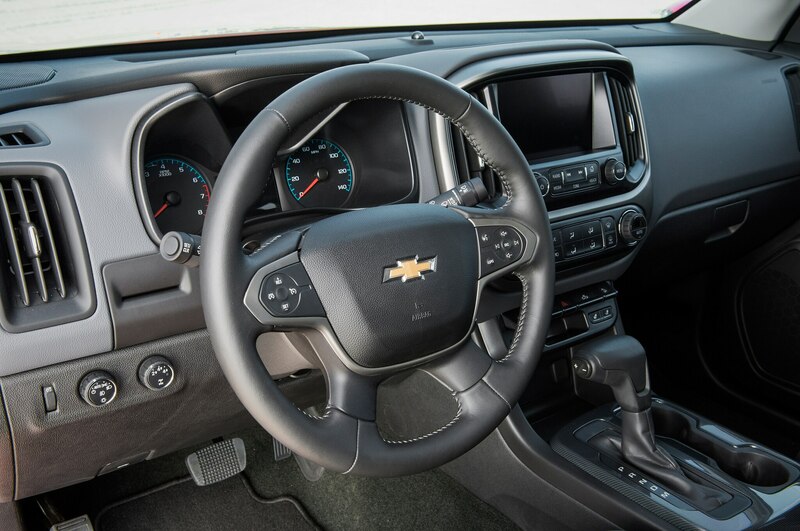 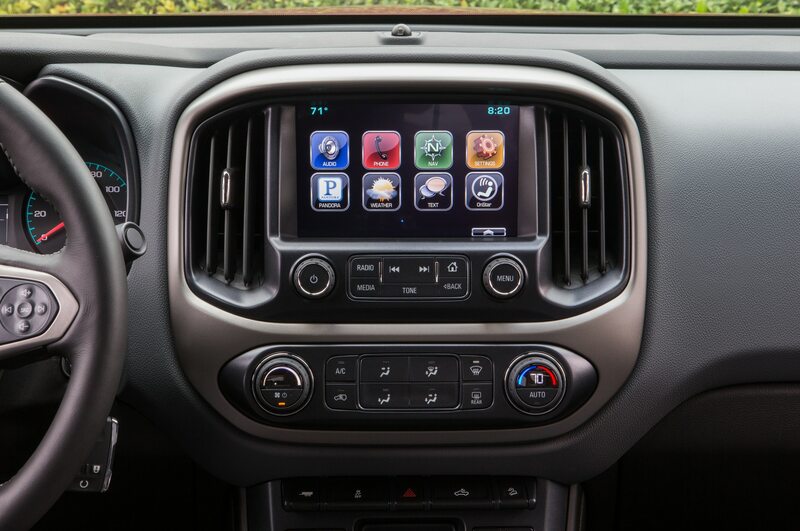 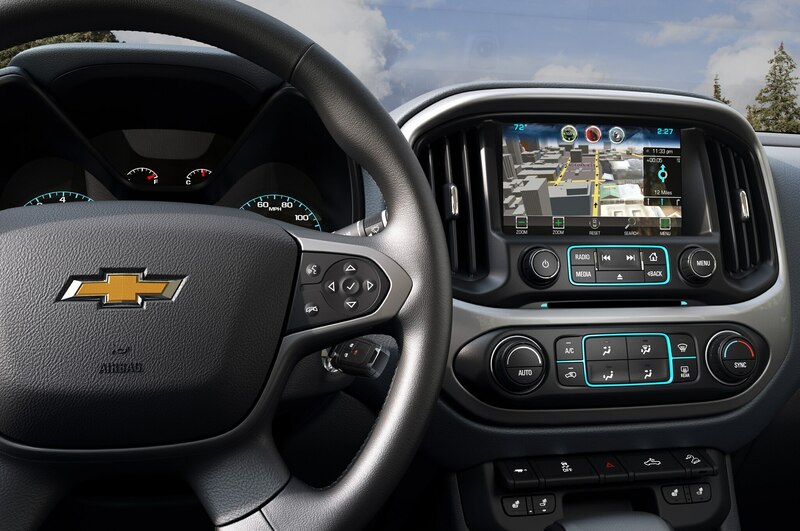 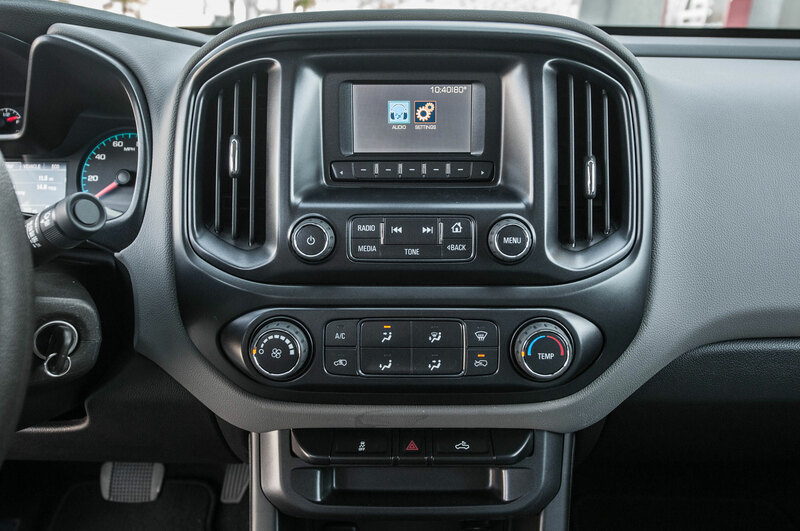 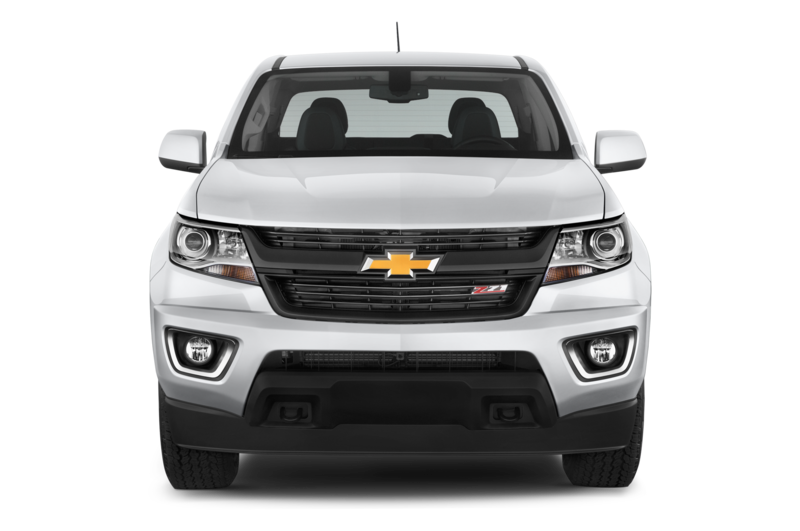 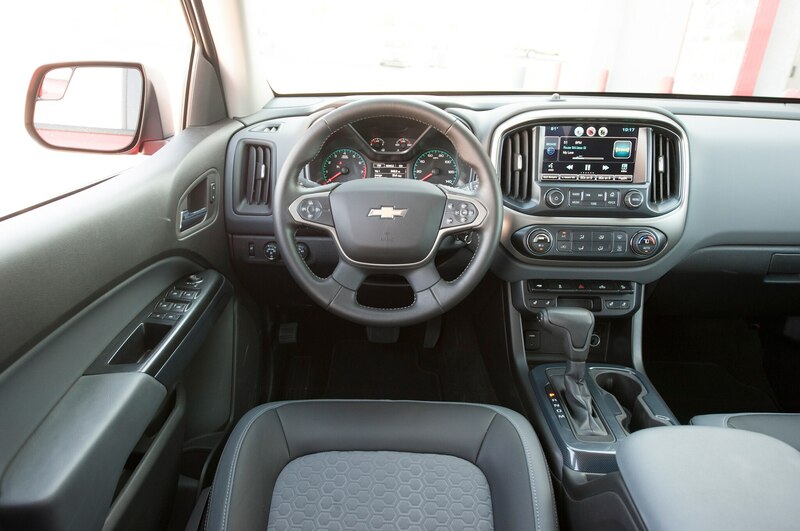 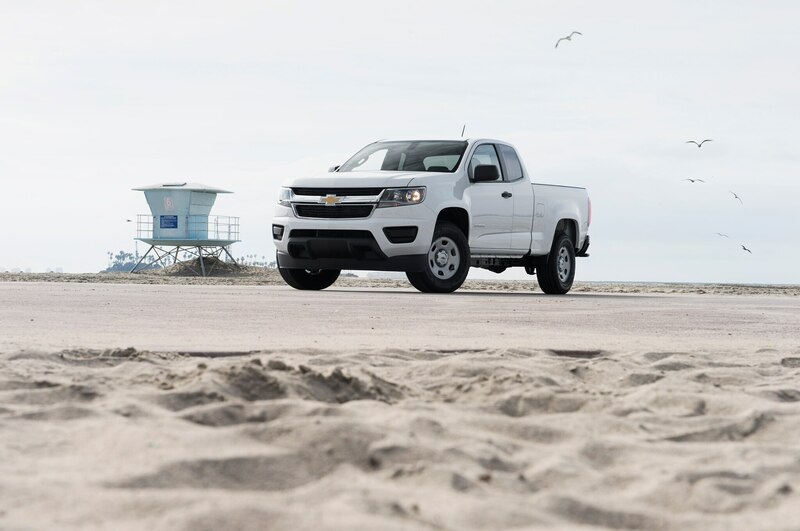 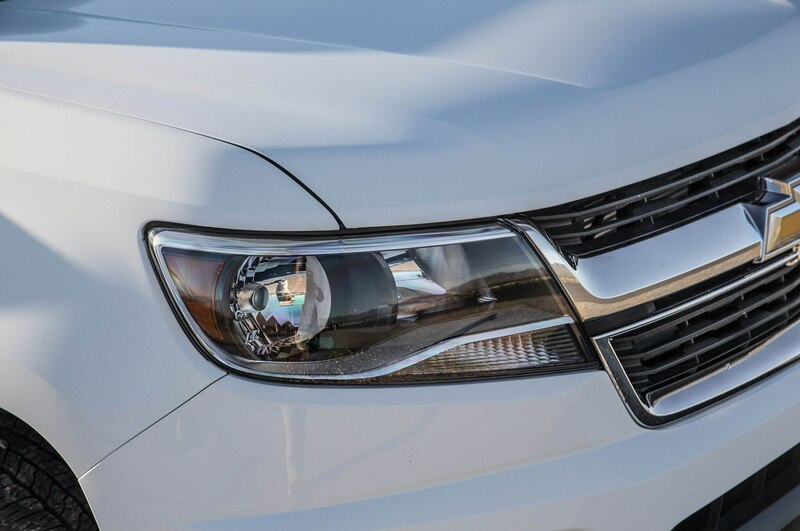 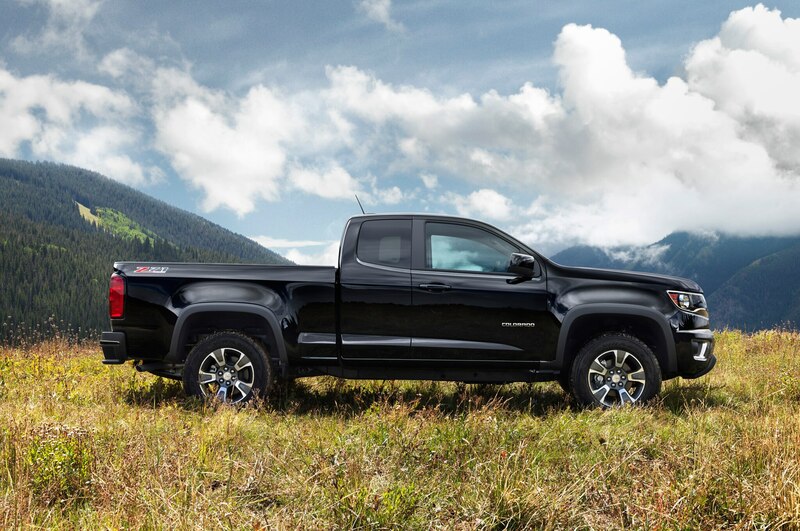 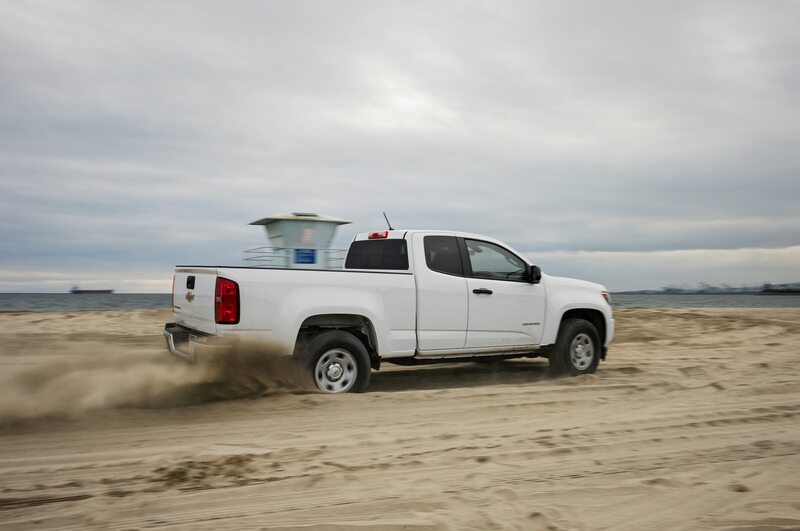 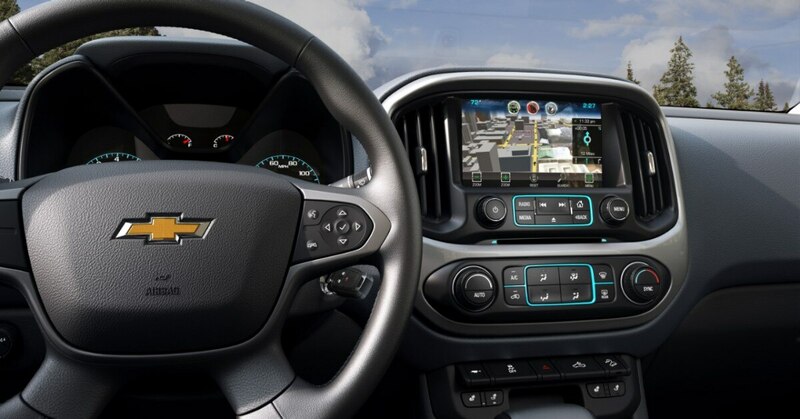 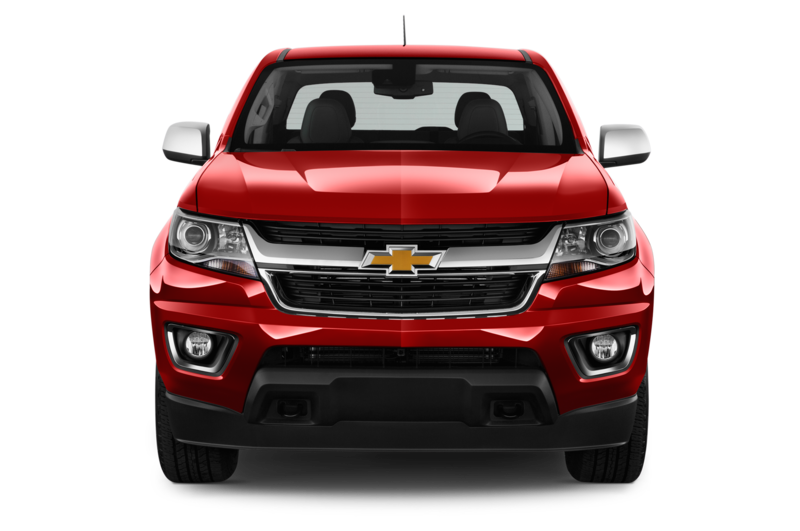 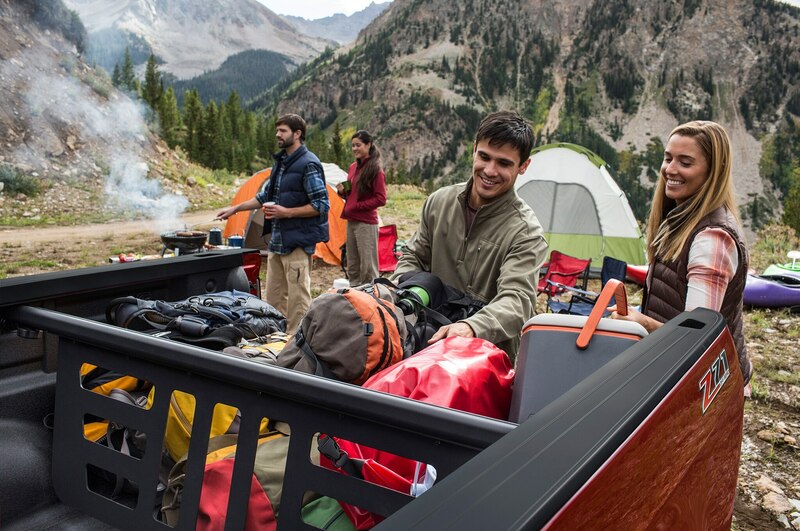 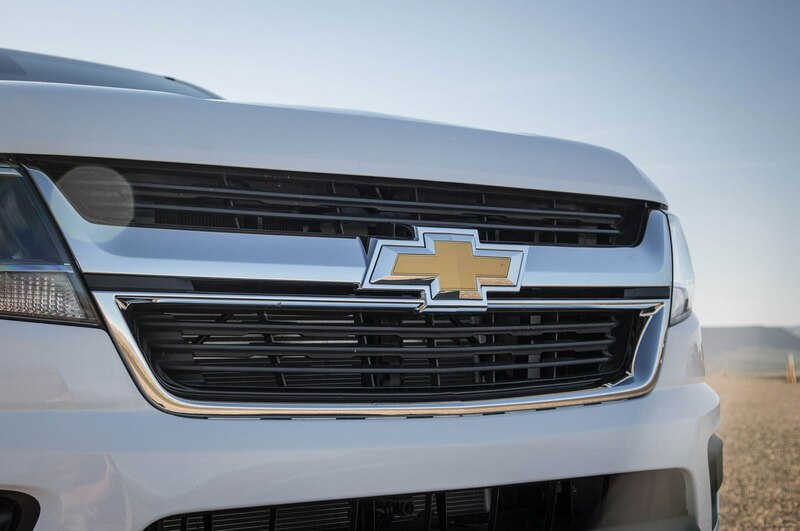 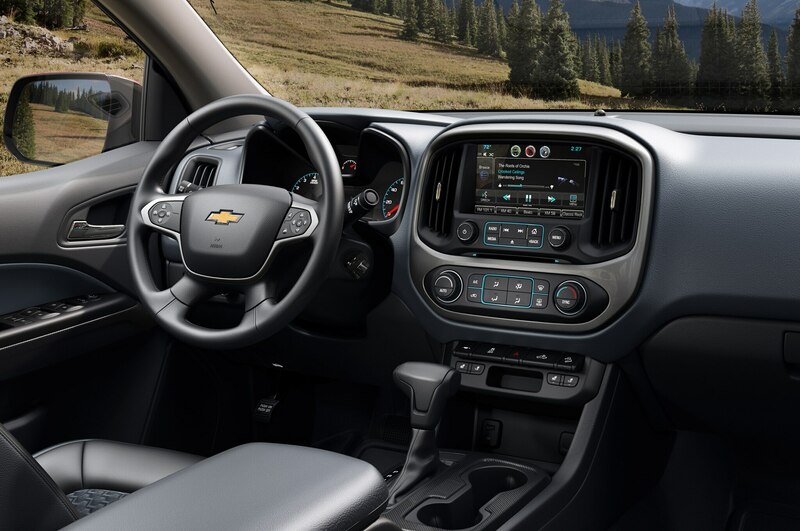 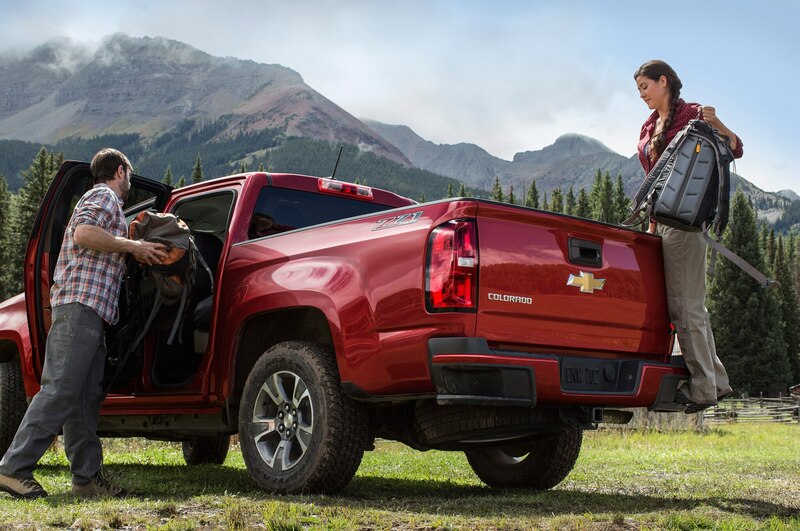 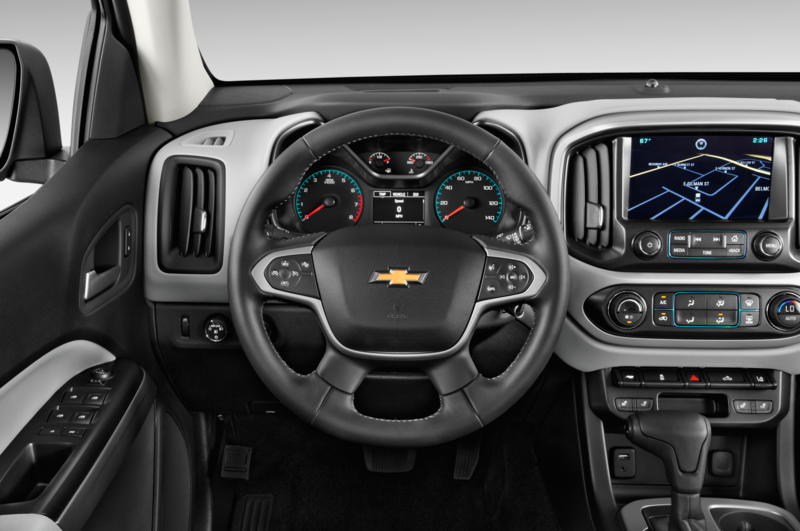 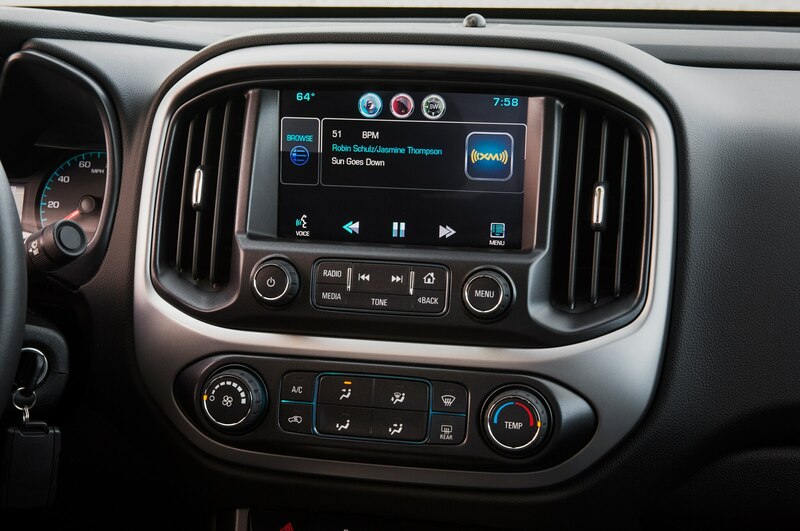 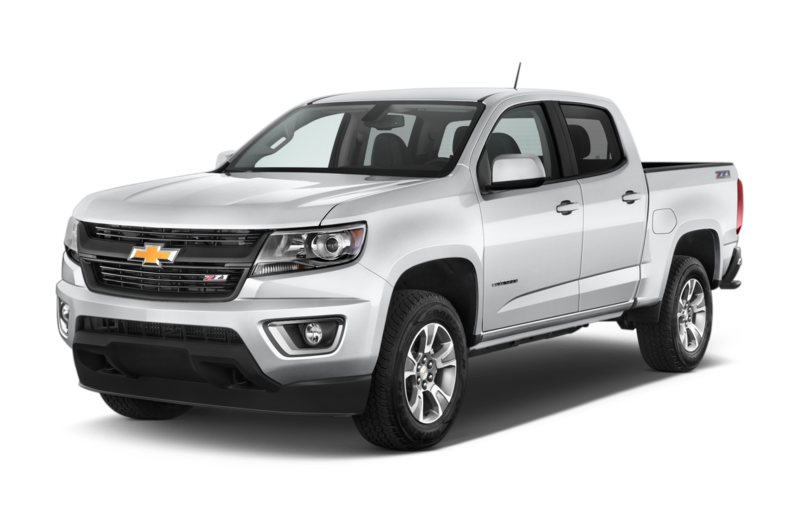 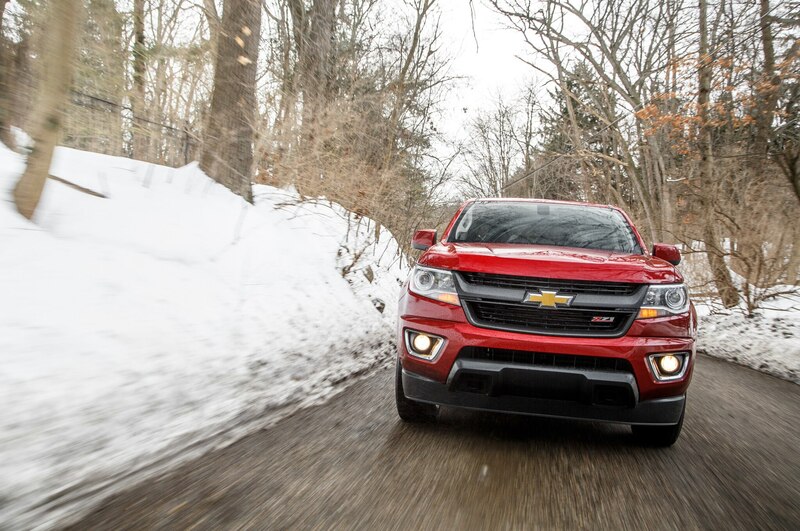 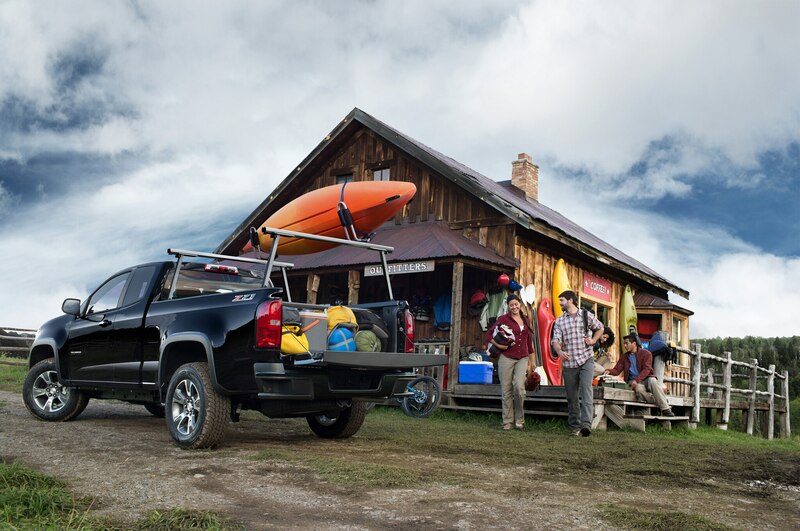 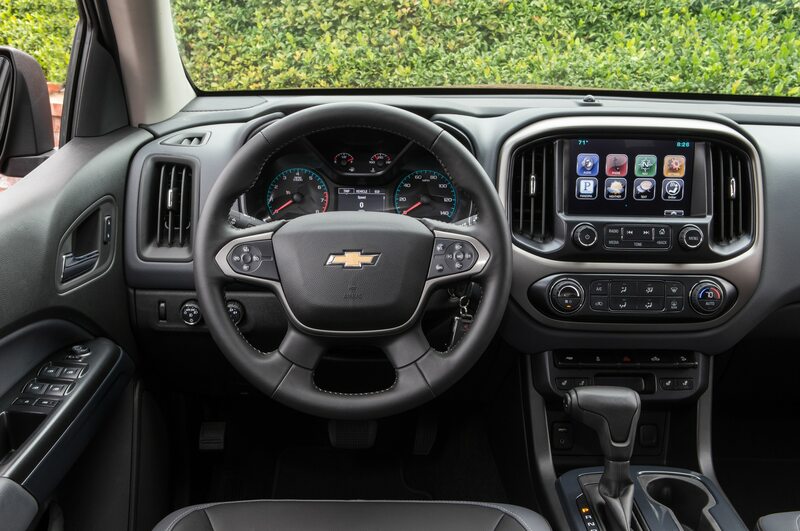 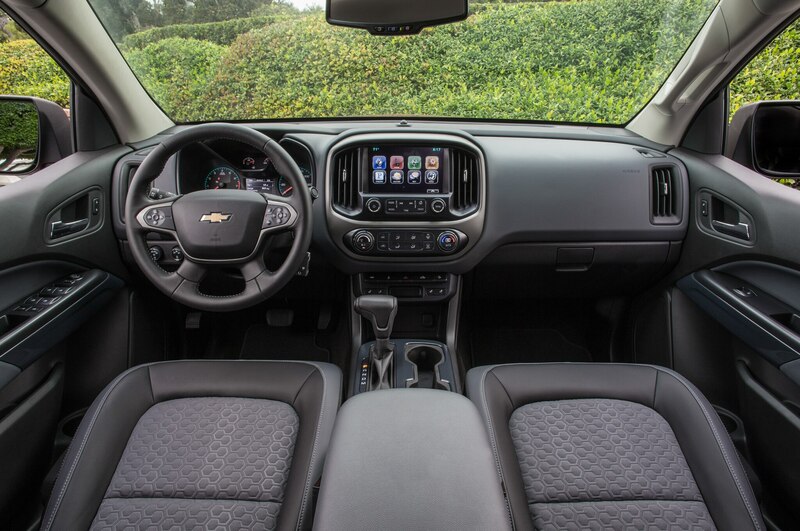 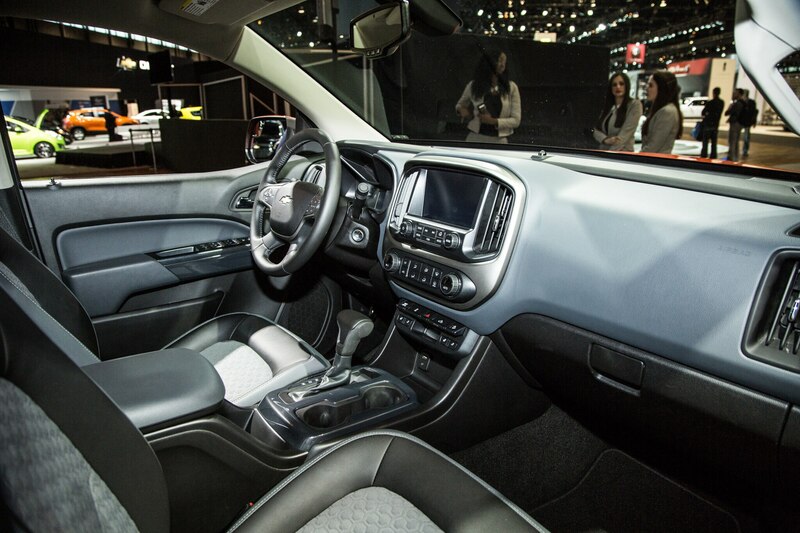 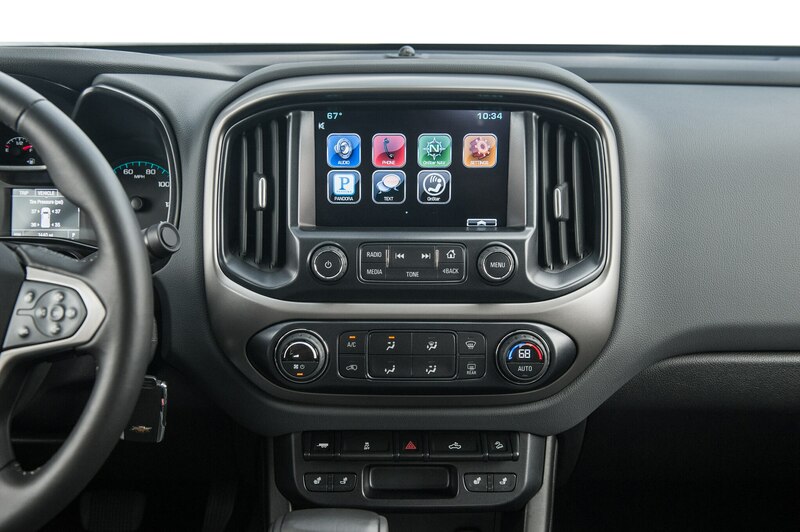 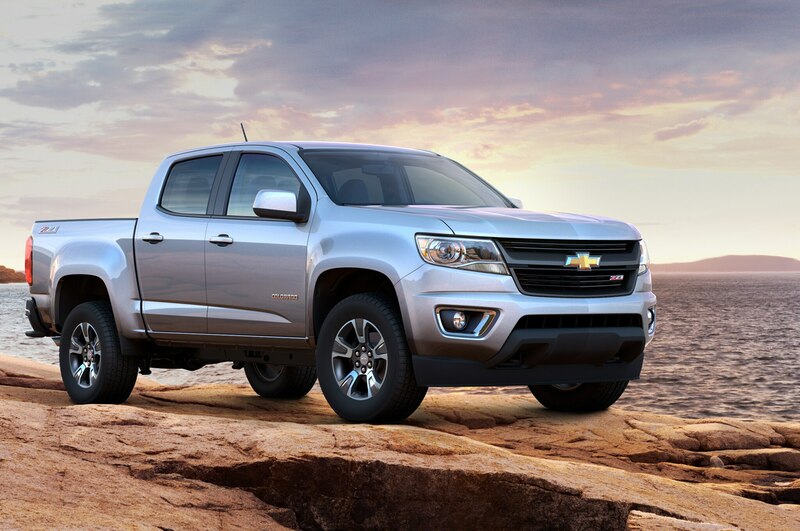 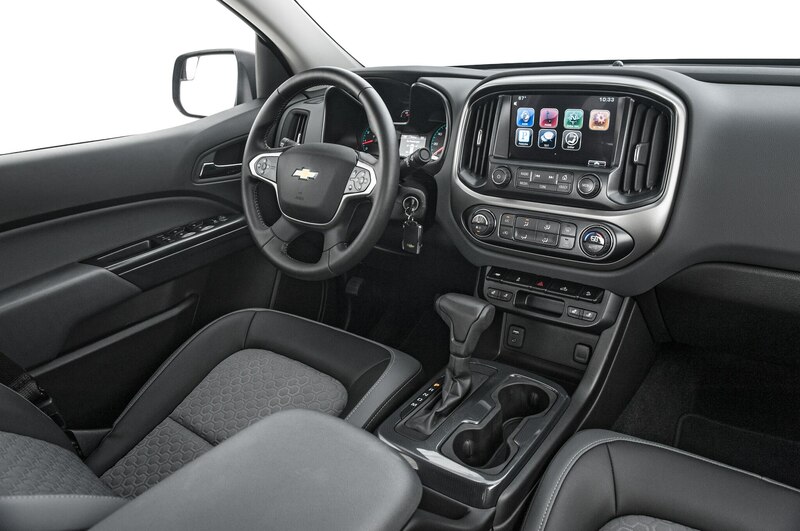 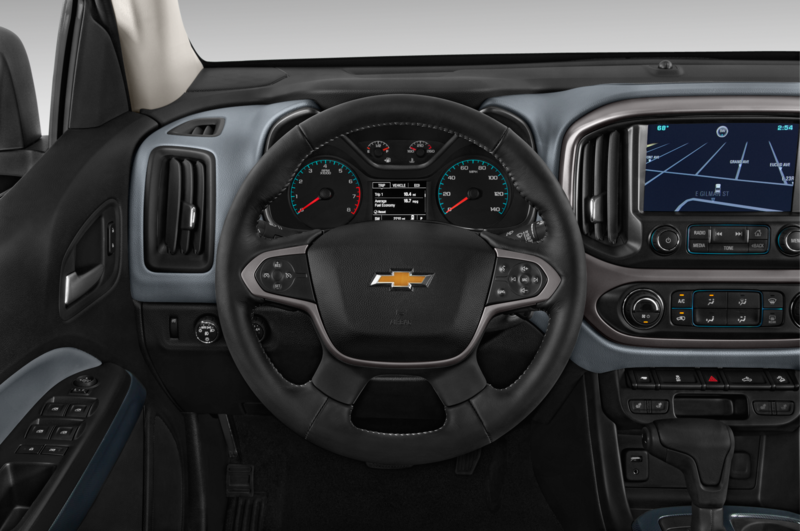 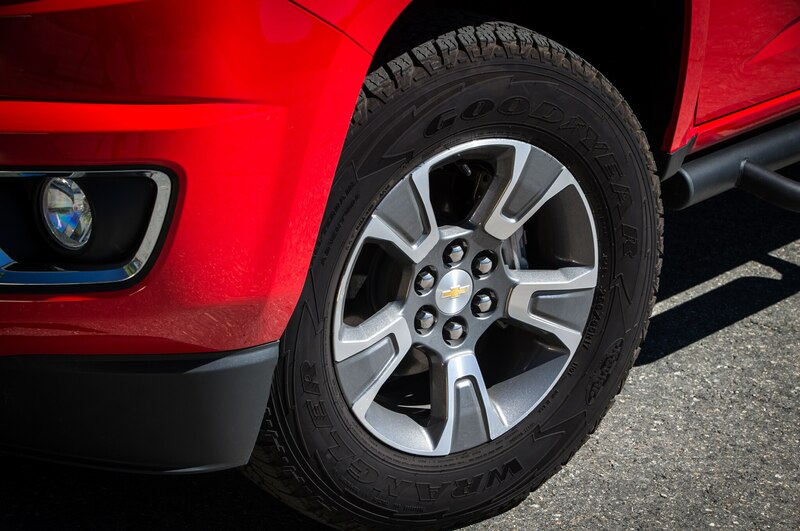 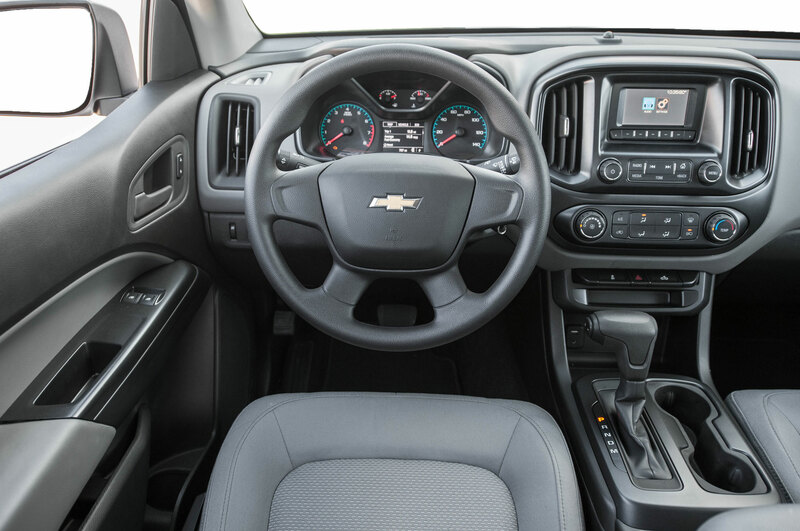 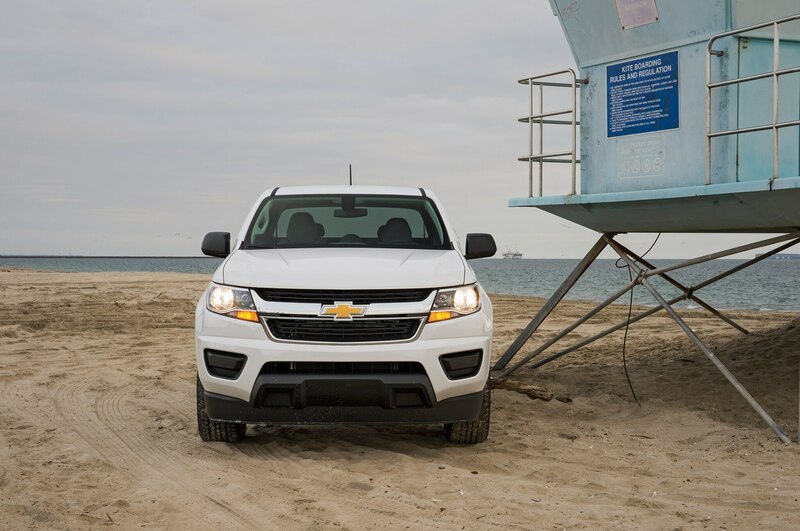 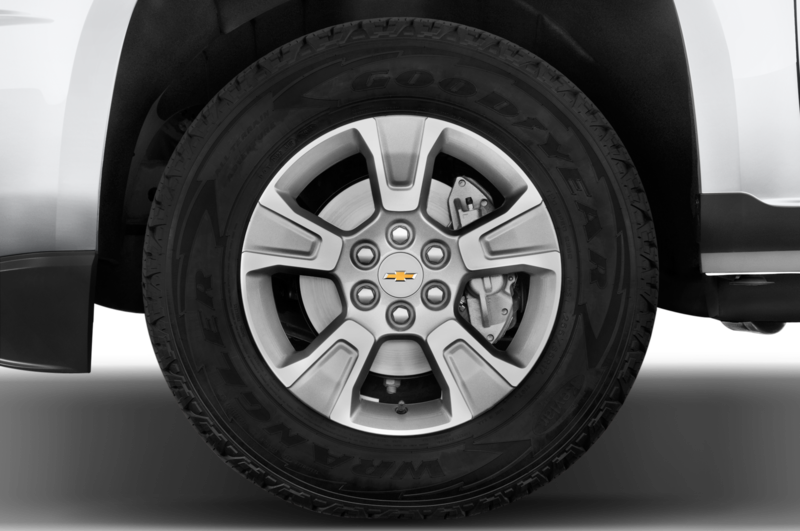 Powered by Chevy’s 2.5-liter four mated to a six-speed manual, the Colorado came with the optional convenience package, which added remote keyless entry, an easy-to-use cruise control setup, a content theft alarm, and a lift and lower tailgate, for $490. 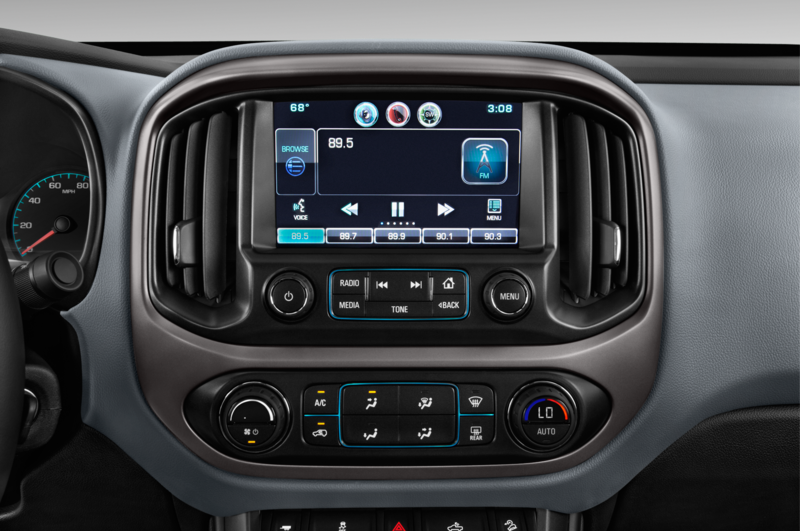 It was also equipped with the MyLink audio system for $275, if you want to call it an audio system, what with its mid-console color, non-touch display screen smaller than most smartphones. 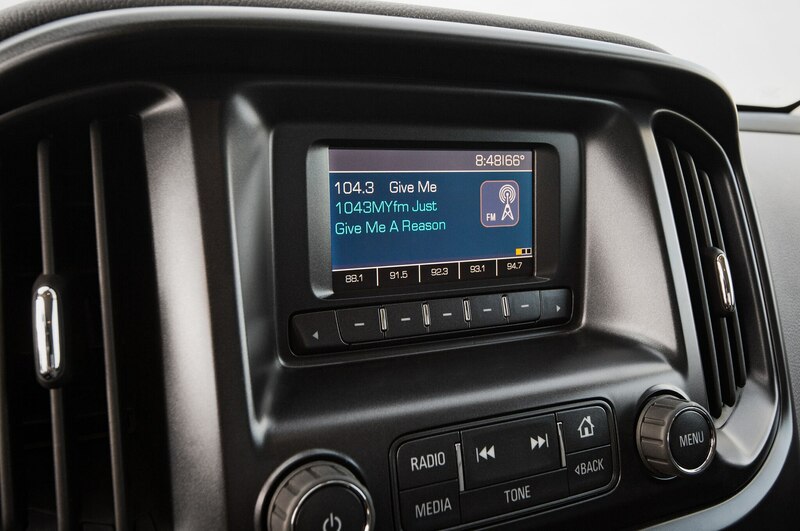 Still, this is a work truck, and the AM and FM radio stations should provide adequate on-the-job entertainment. 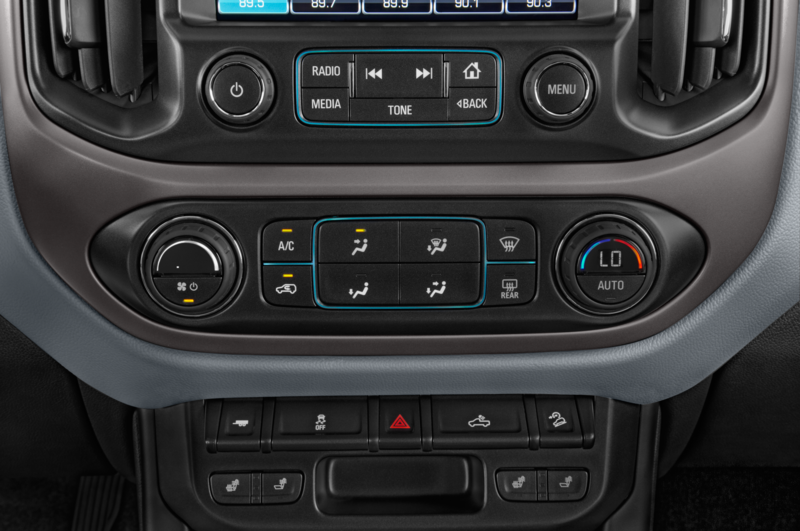 Thankfully, it’s also set up for Bluetooth. 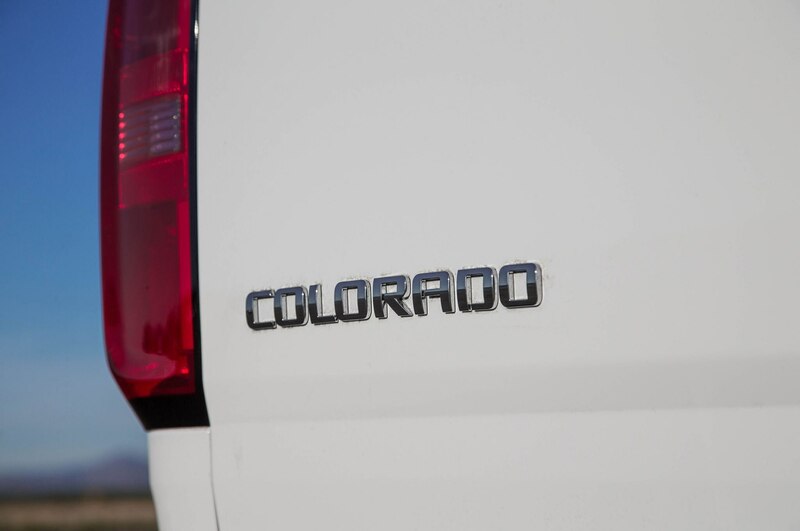 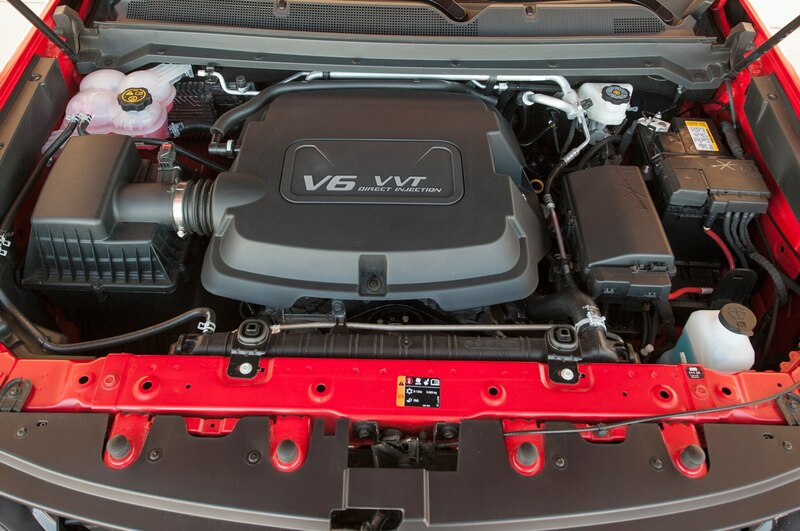 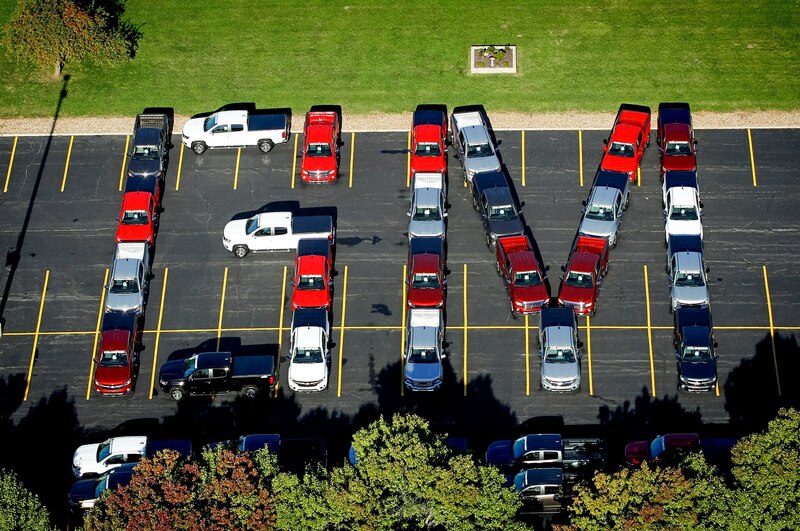 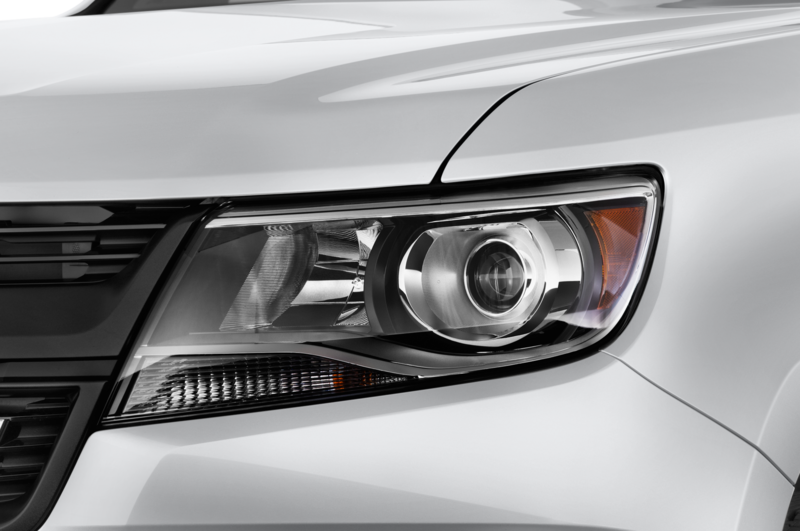 Things are much more impressive from a gas mileage perspective, with an EPA rating of 19/26 city/highway mpg. 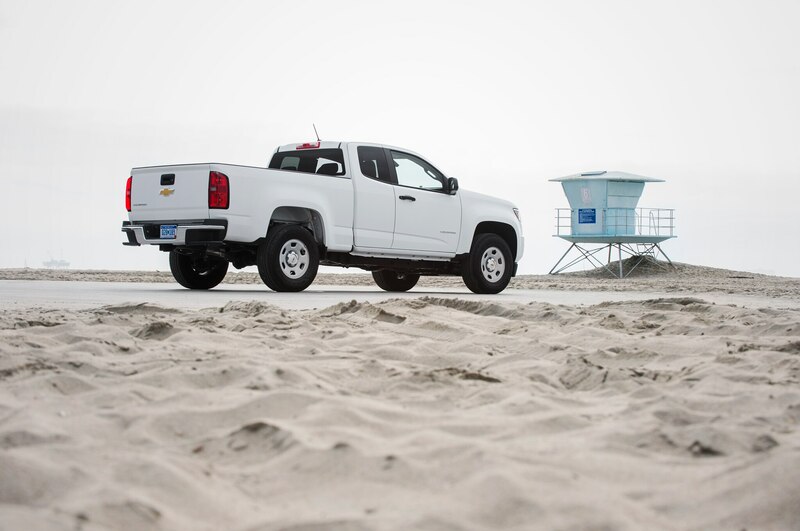 Even in thick L.A. traffic with three-hour daily commutes, we managed a five-day average of about 23 mpg. 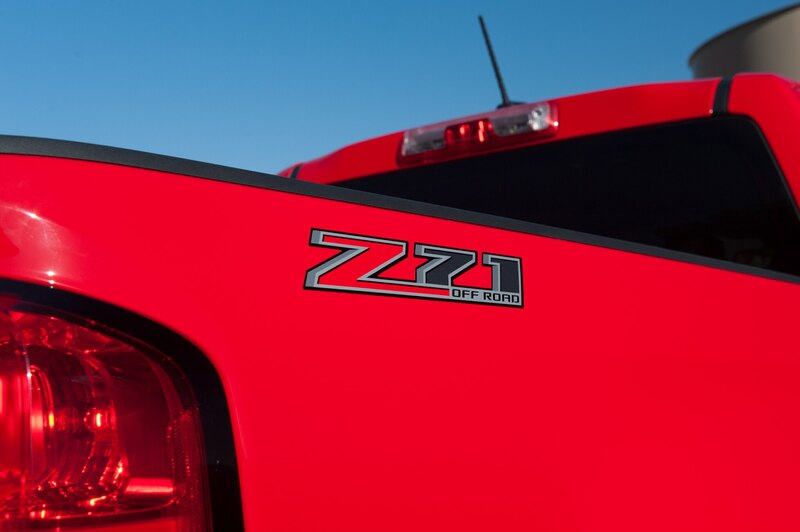 Solid numbers for a truck. 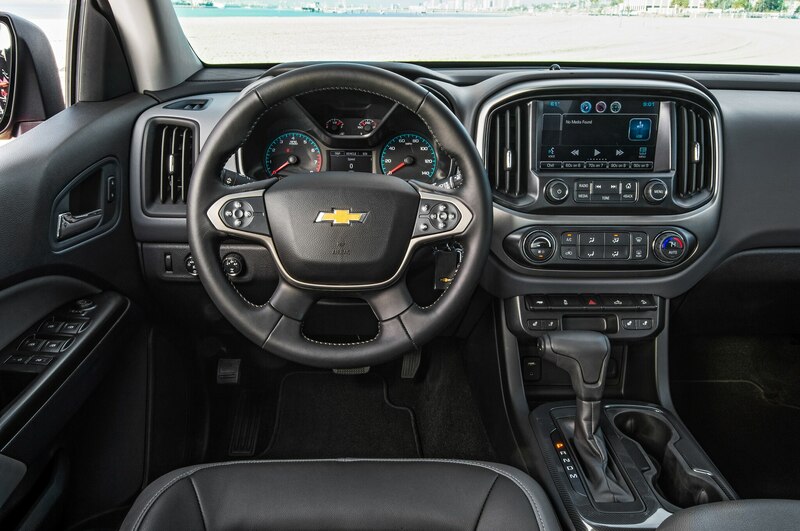 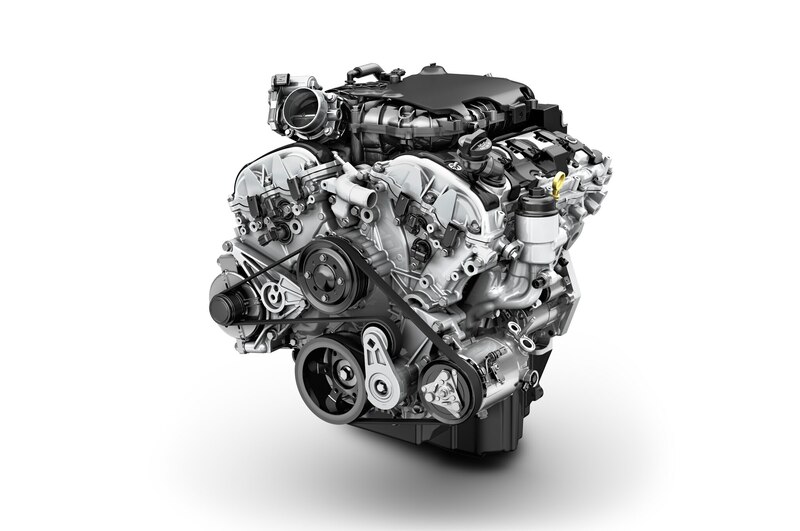 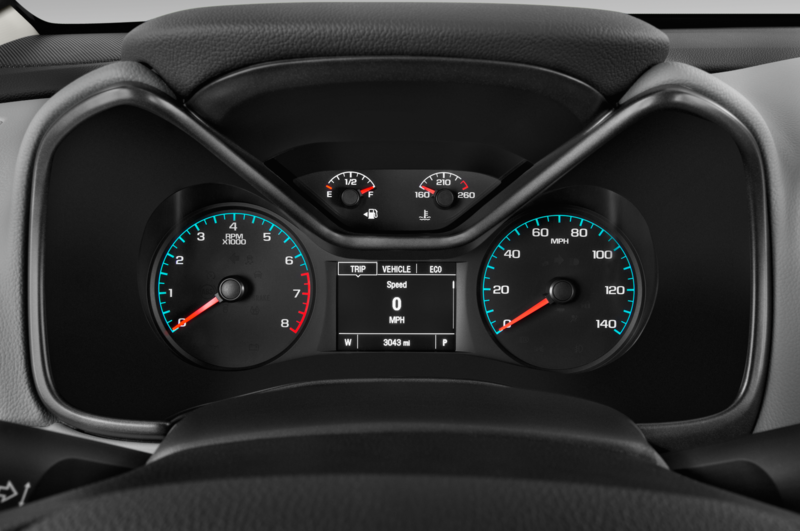 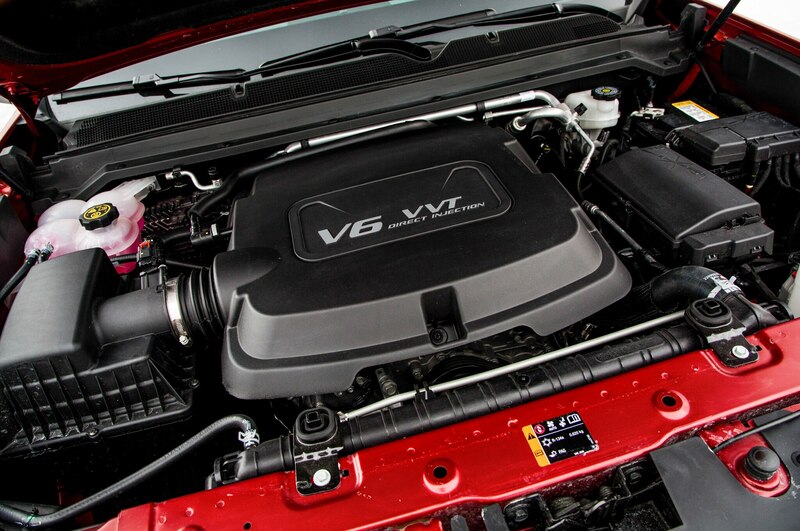 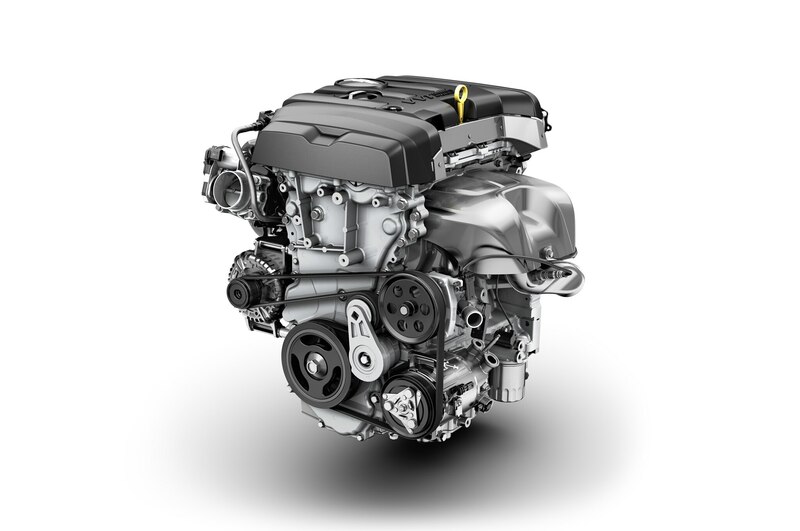 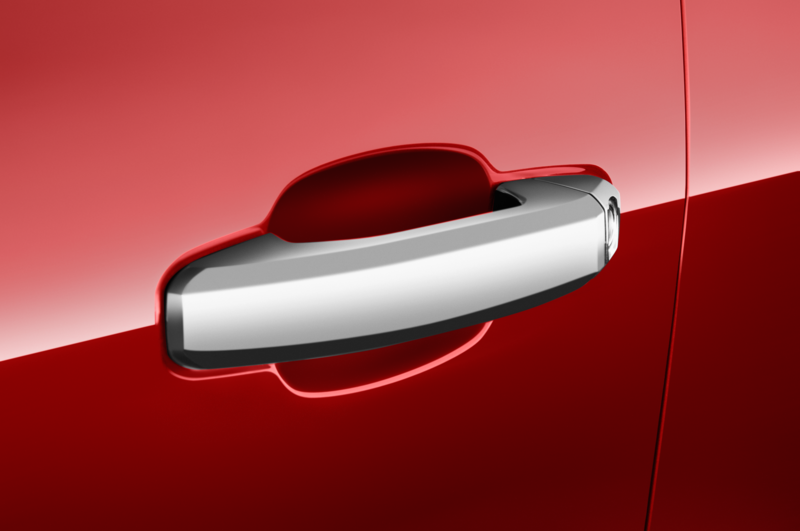 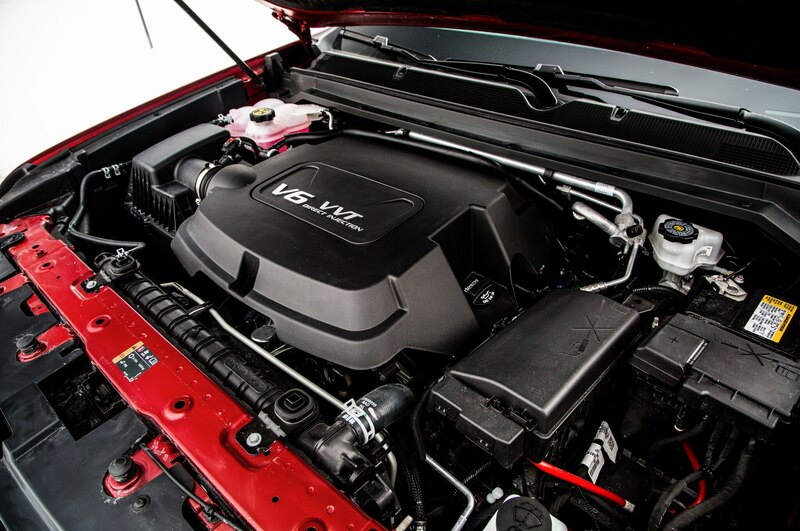 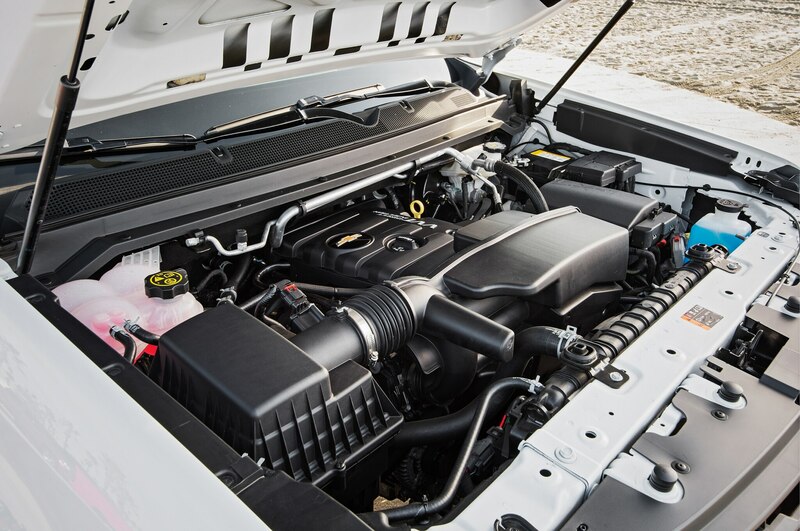 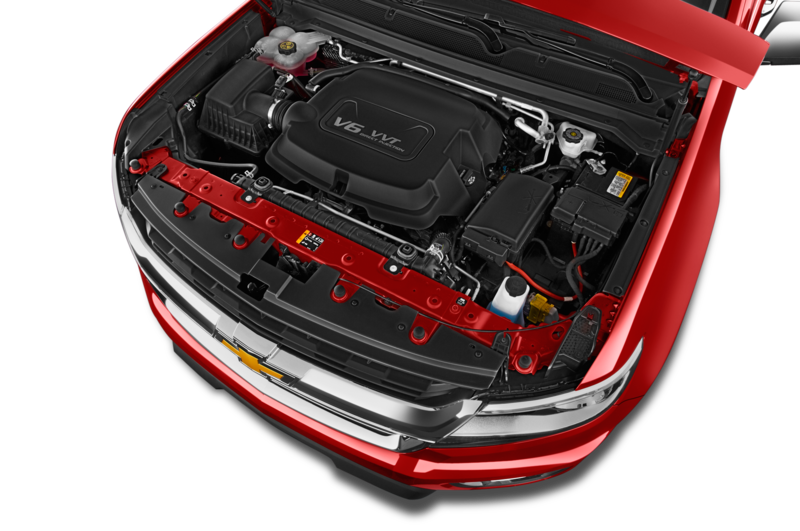 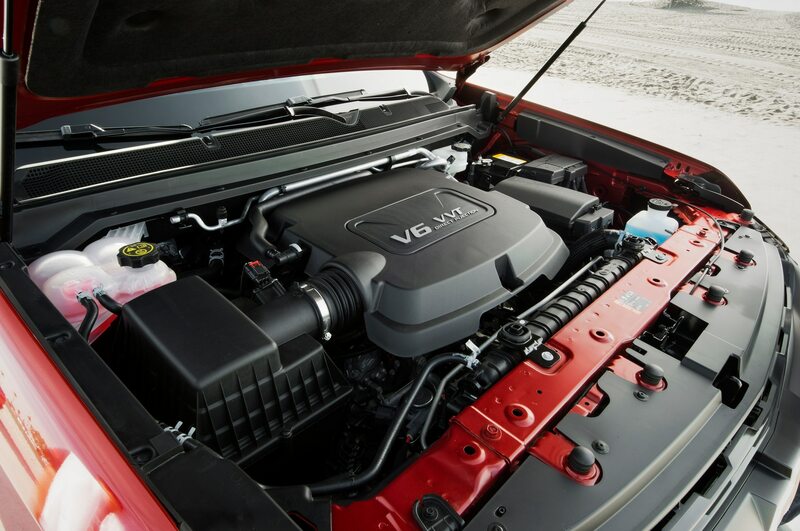 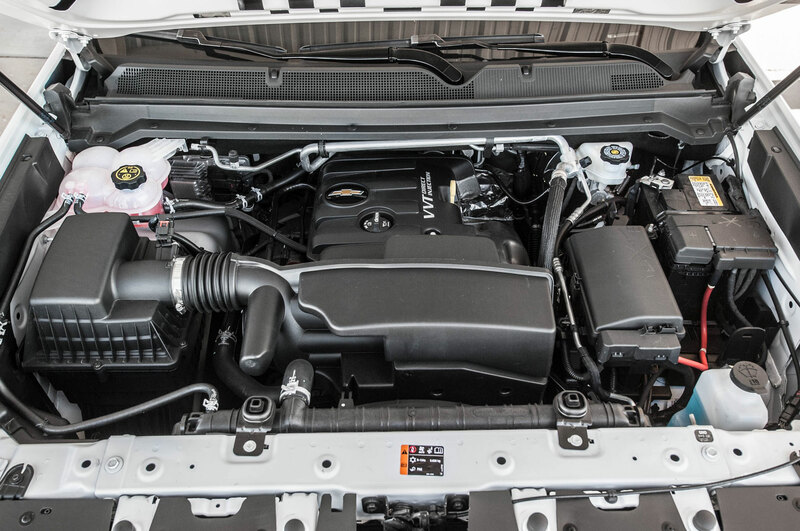 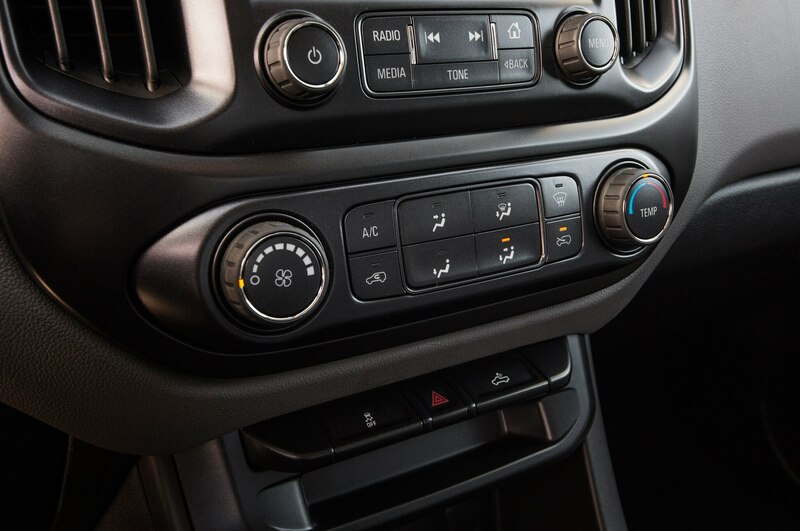 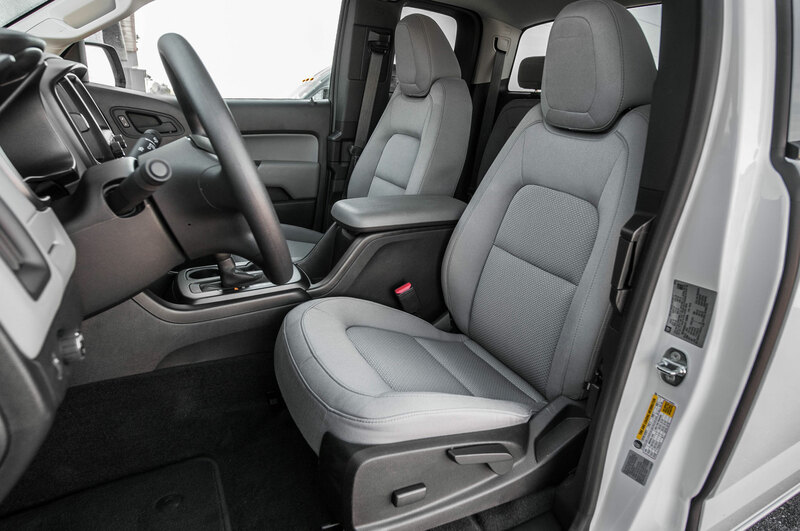 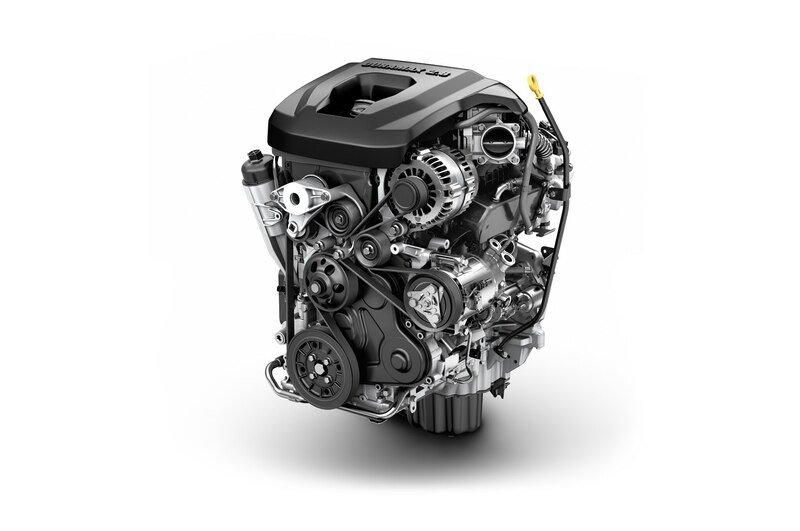 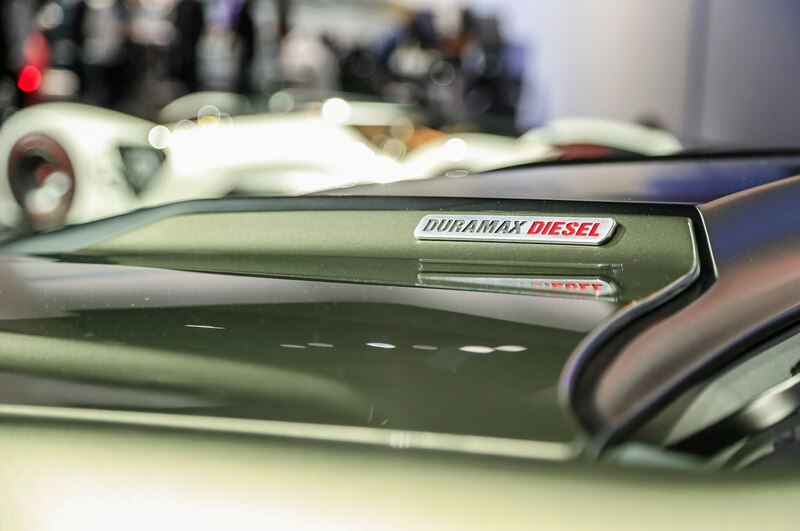 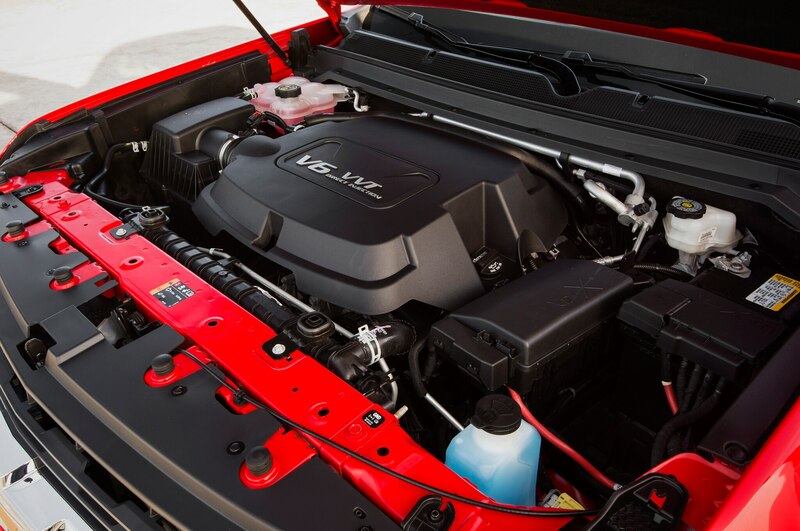 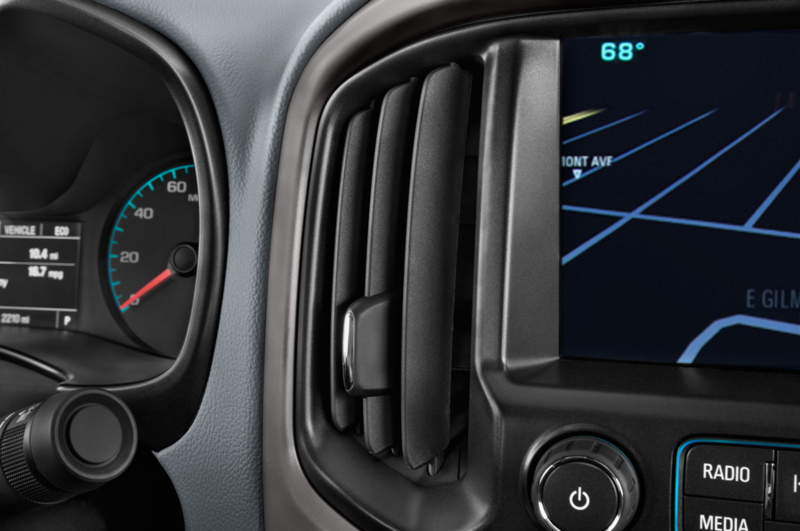 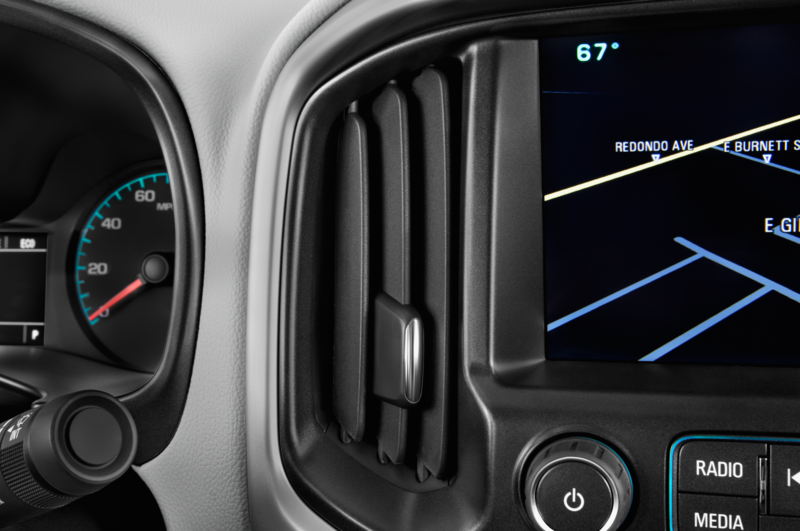 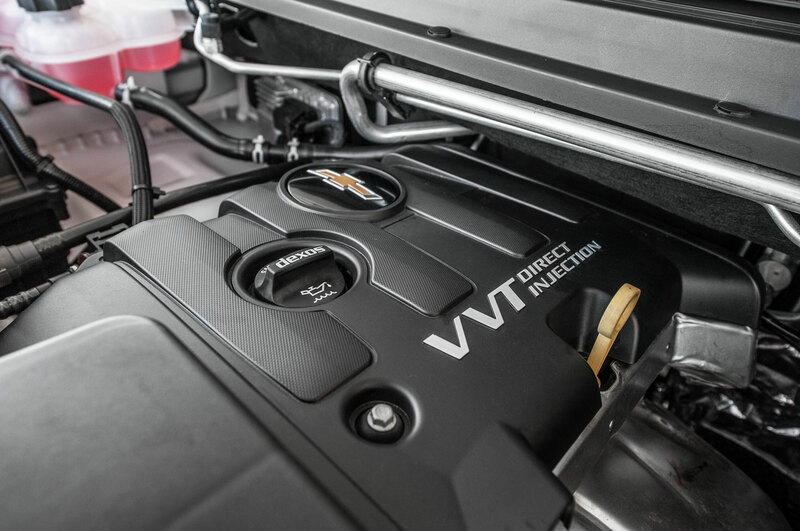 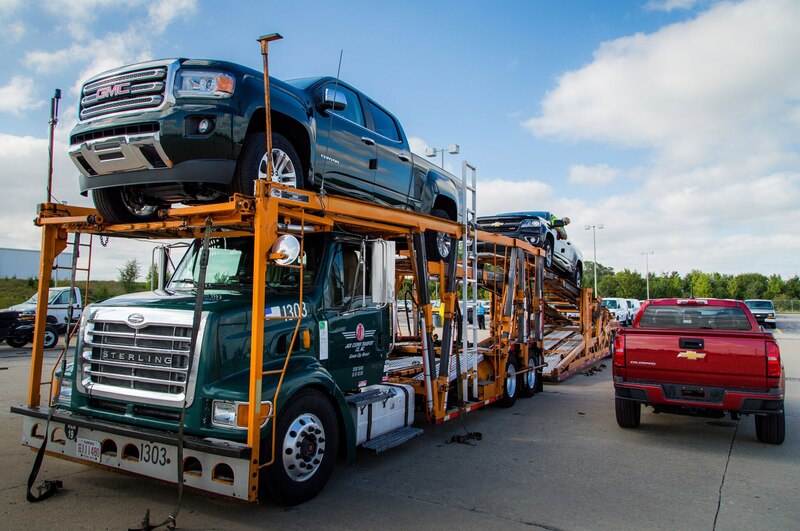 A big advantage of a truck with a manual transmission — besides acting as a built-in anti-theft system — is having the engine’s power at your fingertips. 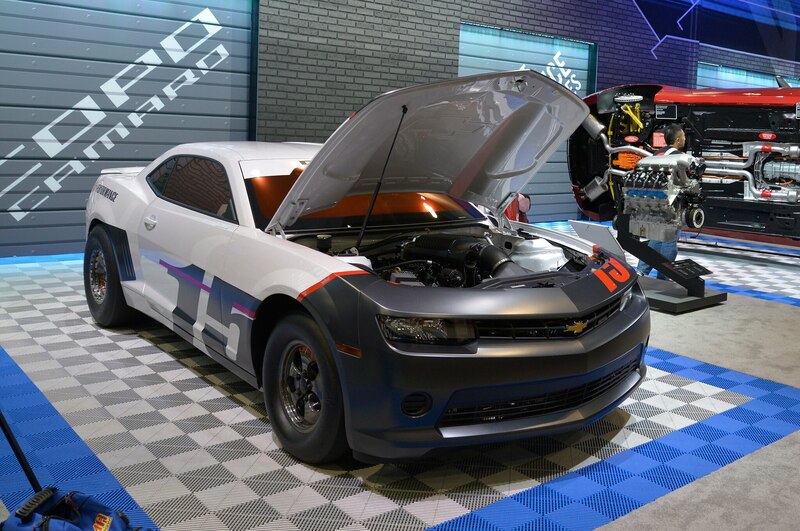 Being able to get the most out of a gear by shifting down or up at the best time is why race-car enthusiasts love standard transmissions. 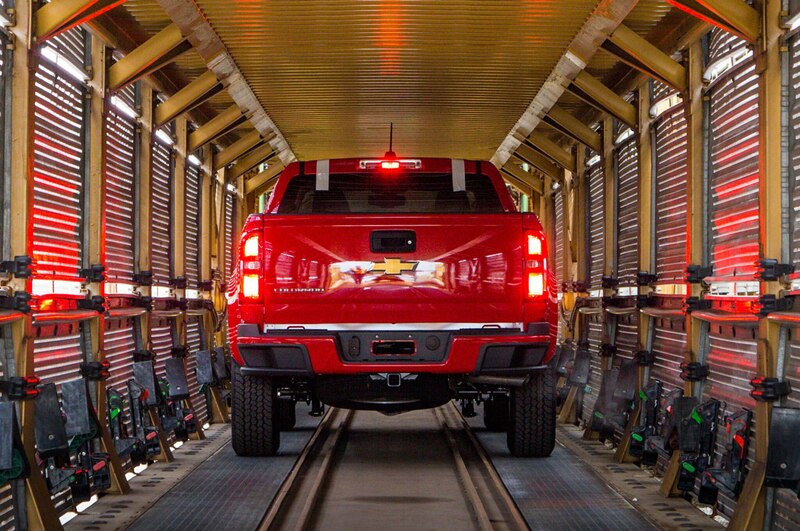 But it’s also beneficial for work trucks with heavy payloads or trailers. 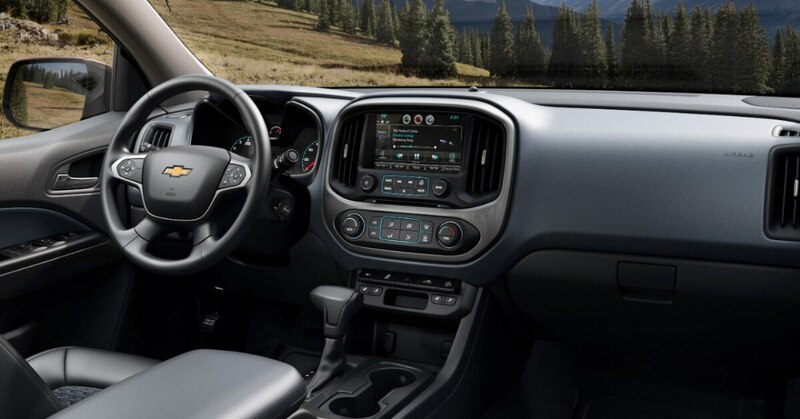 The blessing and curse of the Colorado is that the engine is so quiet in the cabin you’ll miss the sound cues for when to change gear. 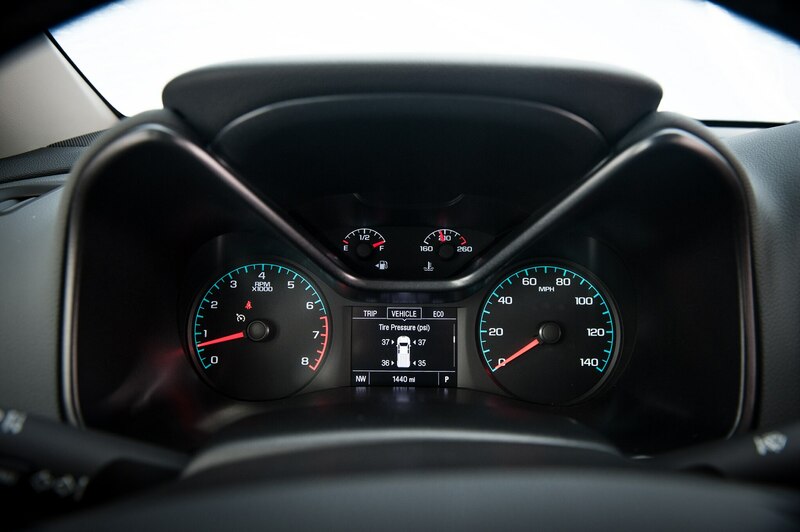 You’ll have to constantly check the gauges. 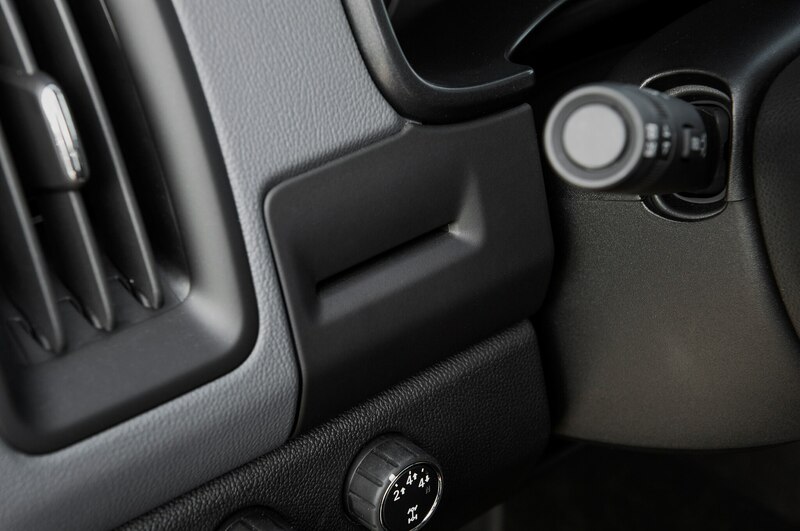 The shift lever in our test truck needed a little manhandling, preferring to be shoved from gear to gear. 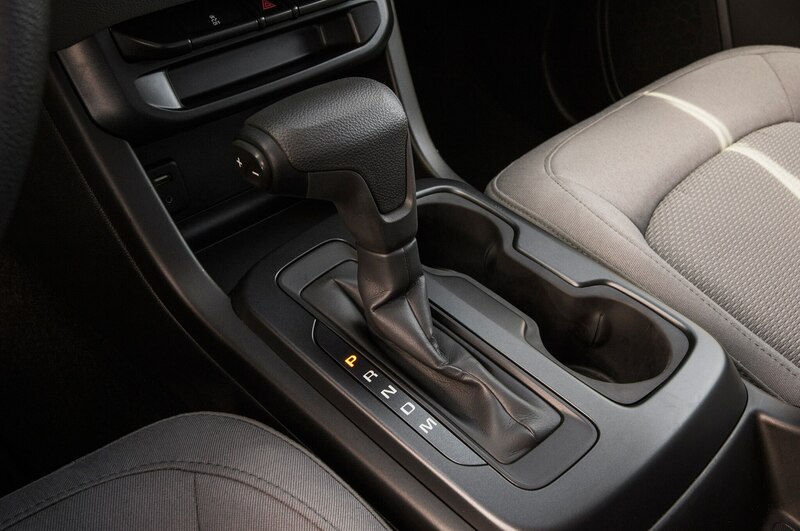 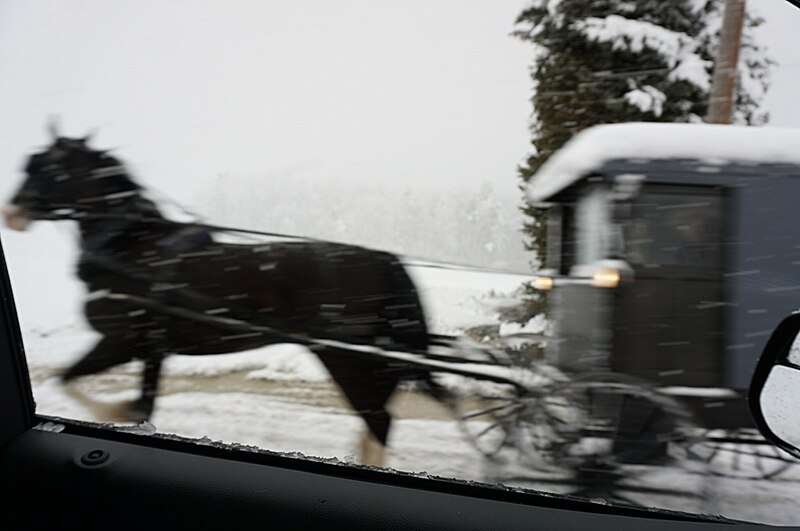 First gear is so short that taking off in second gear is no big deal. 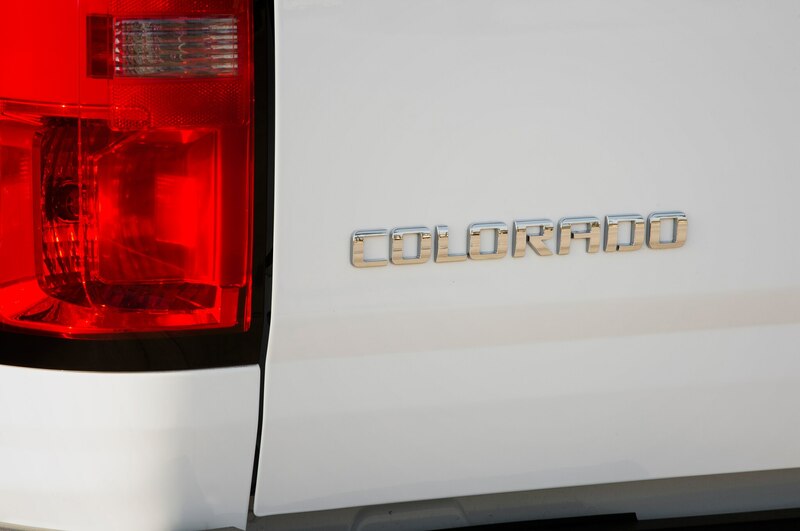 Getting the Colorado into reverse, though, is a tricky operation. 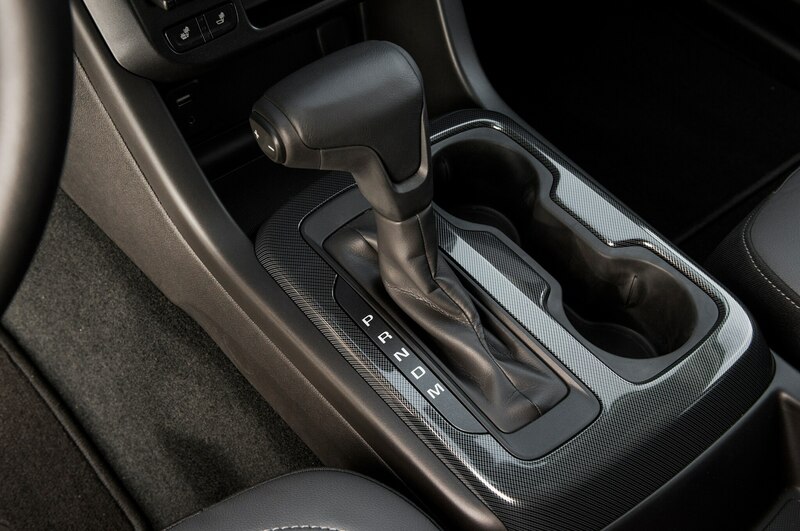 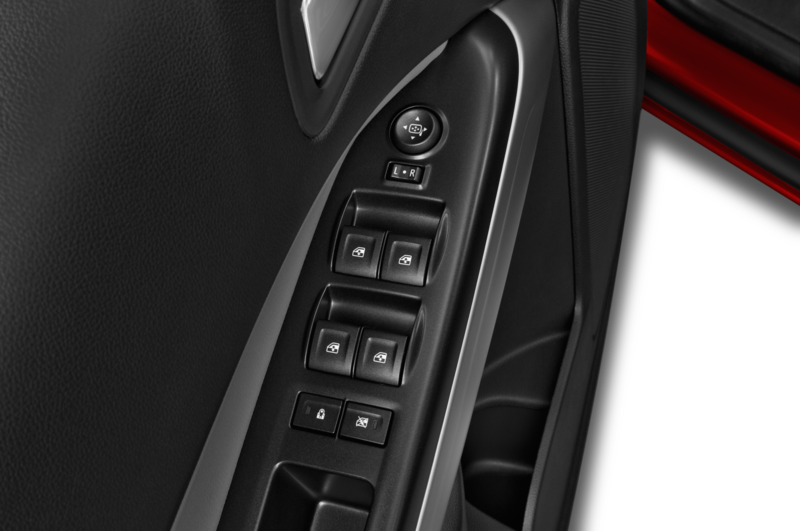 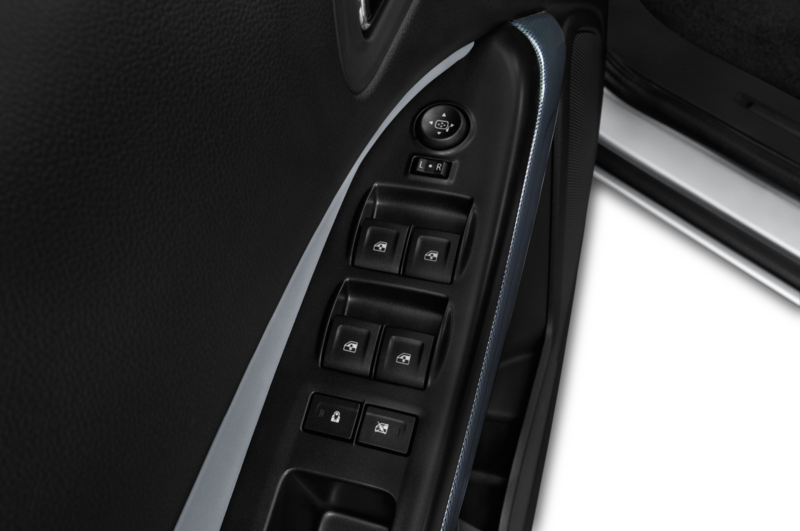 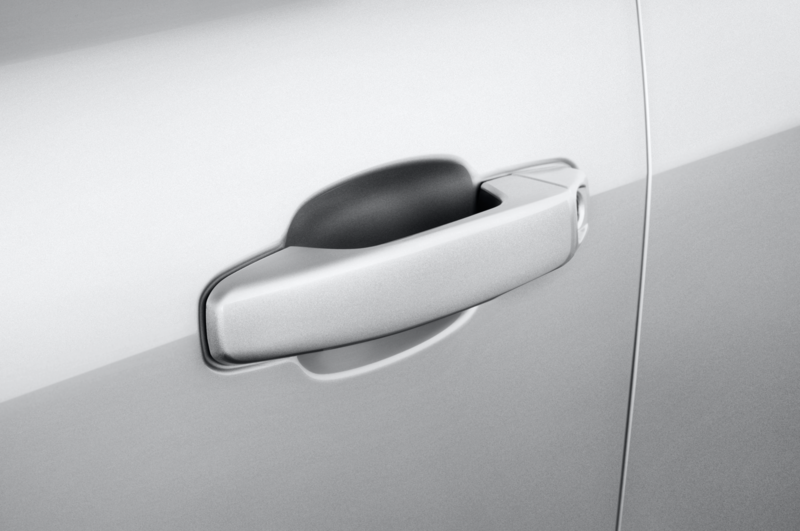 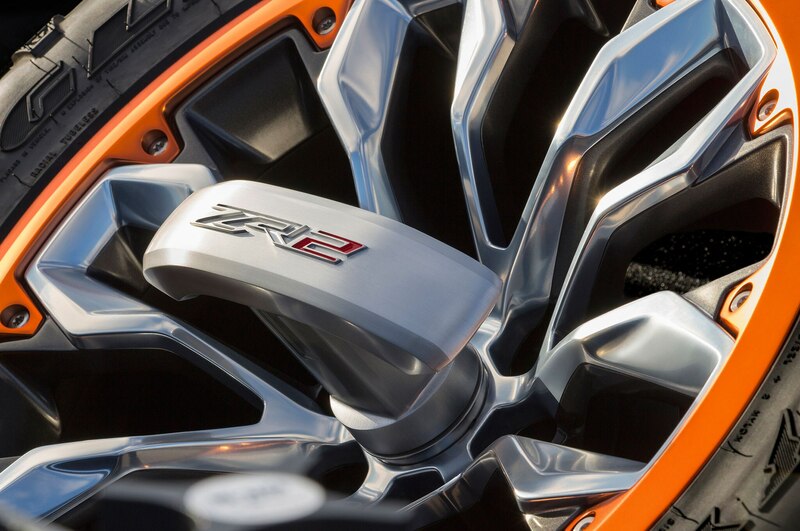 The backup gear is in a precise location requiring more of a map than what’s embossed on the shift knob — all the way over between fifth and sixth, pushed down into a secret slot, and shoved even farther northeast. 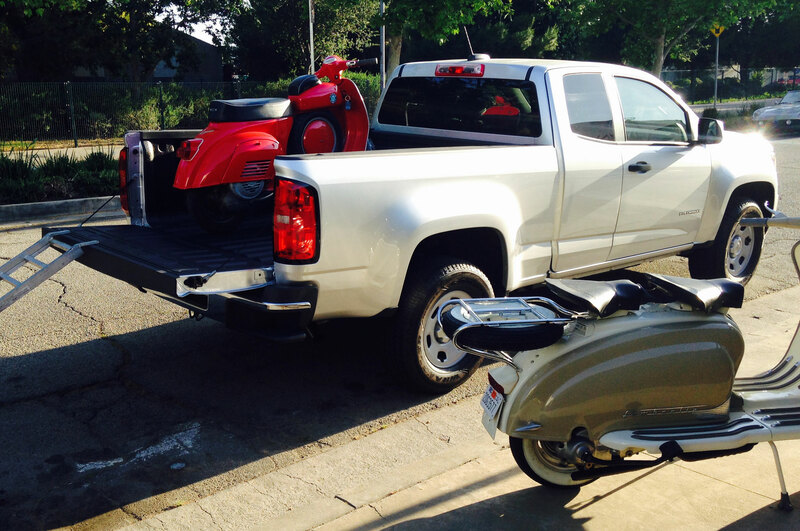 It took our editor-in-chief Mike Floyd some time to master. 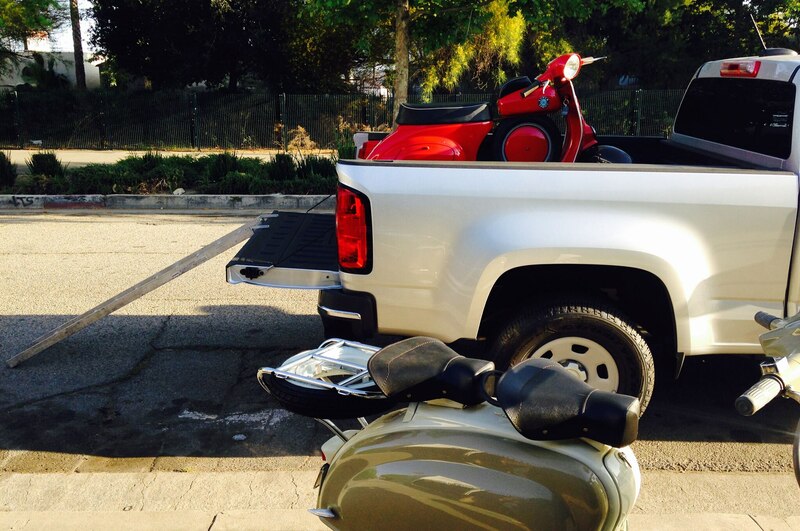 Yours truly didn’t quite get the hang of it, making parallel parking an extra bear. 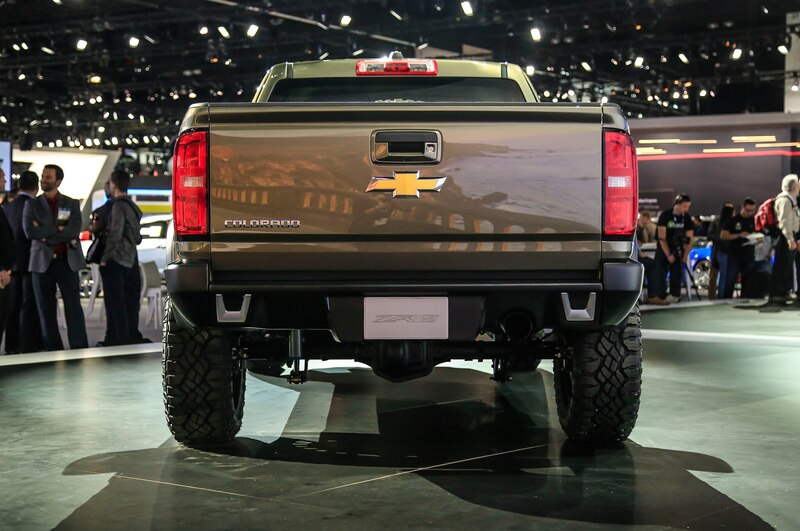 Americans like their trucks supersized. 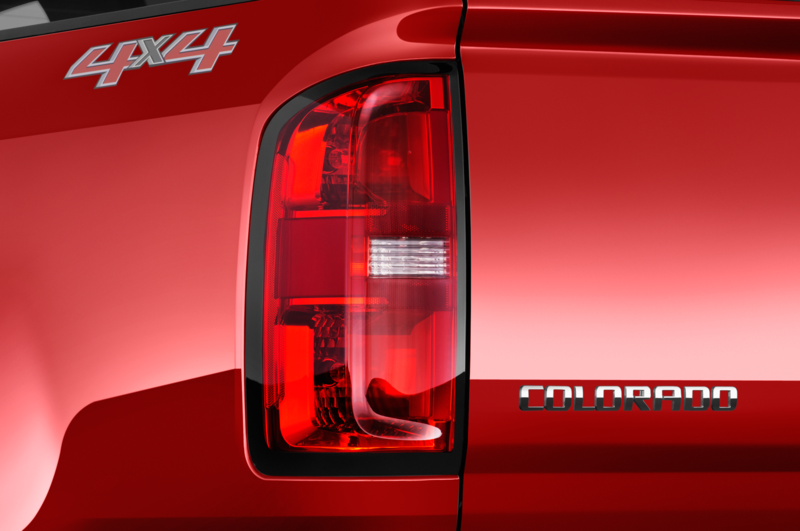 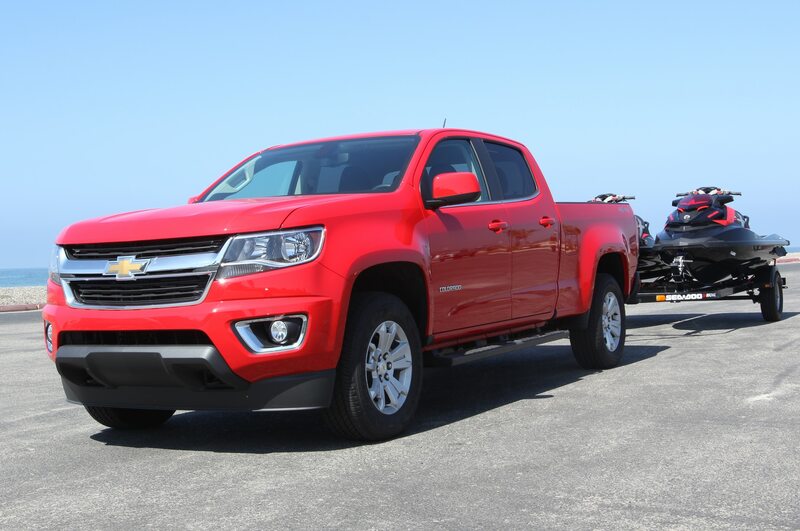 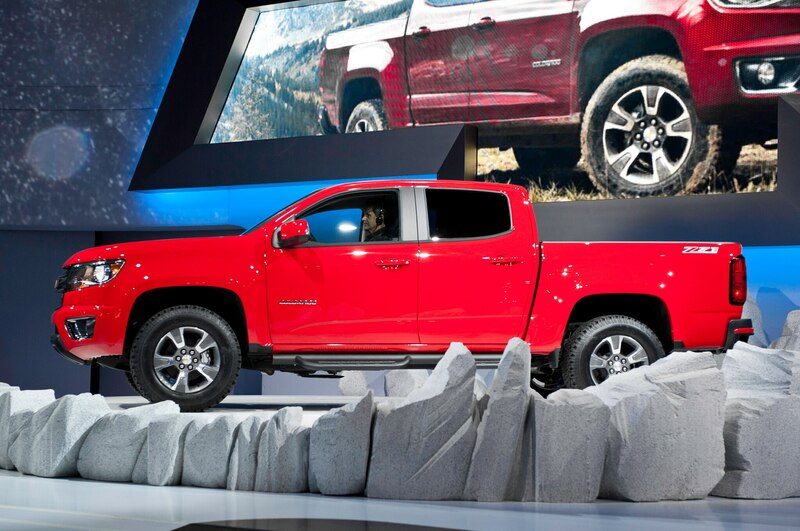 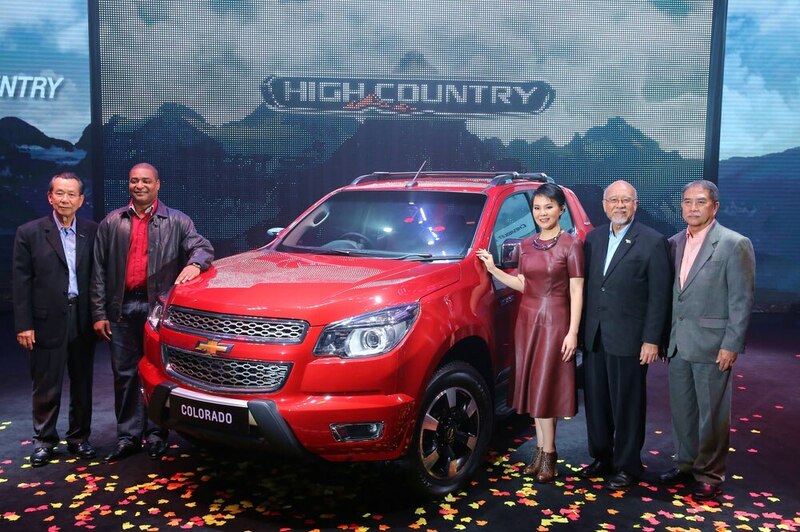 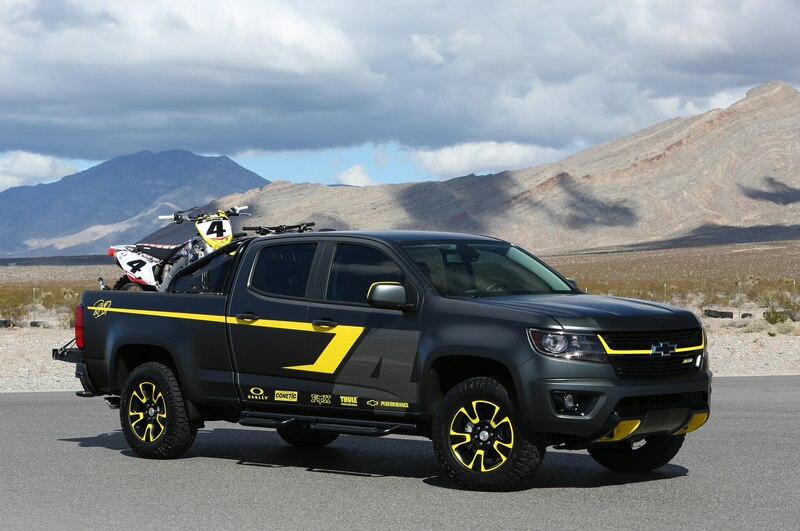 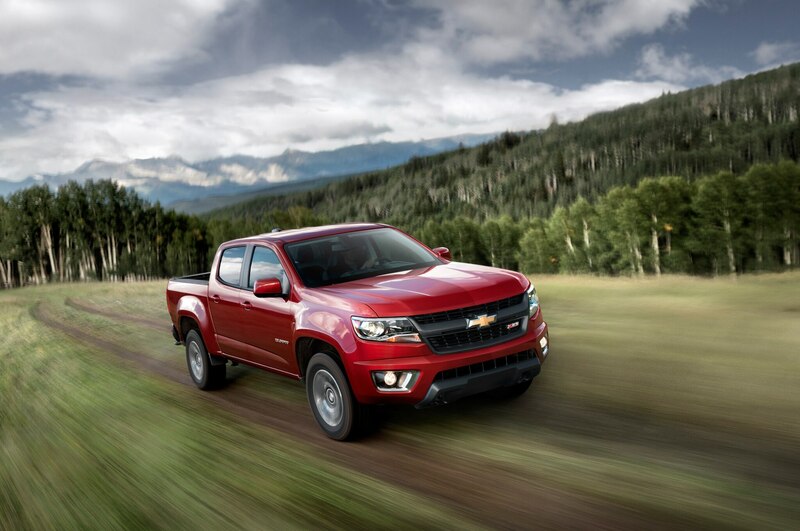 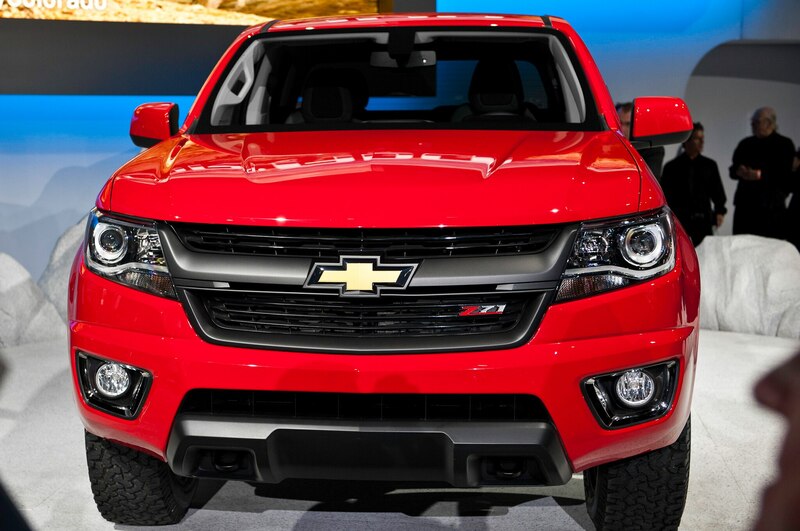 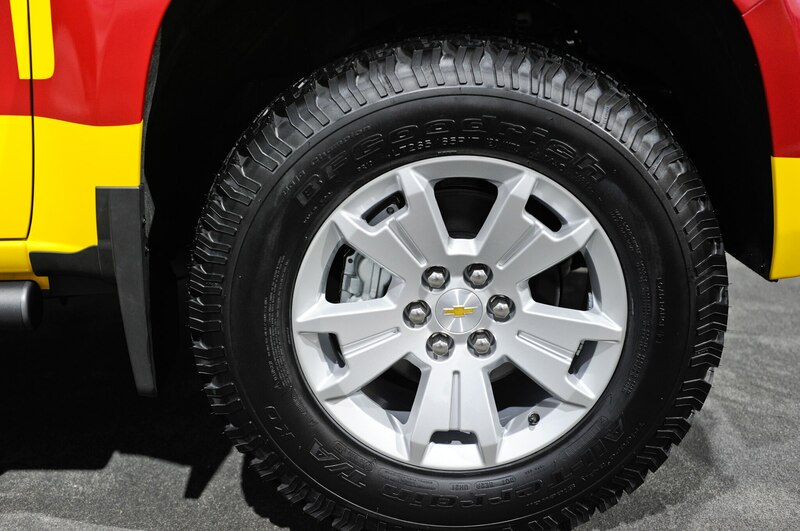 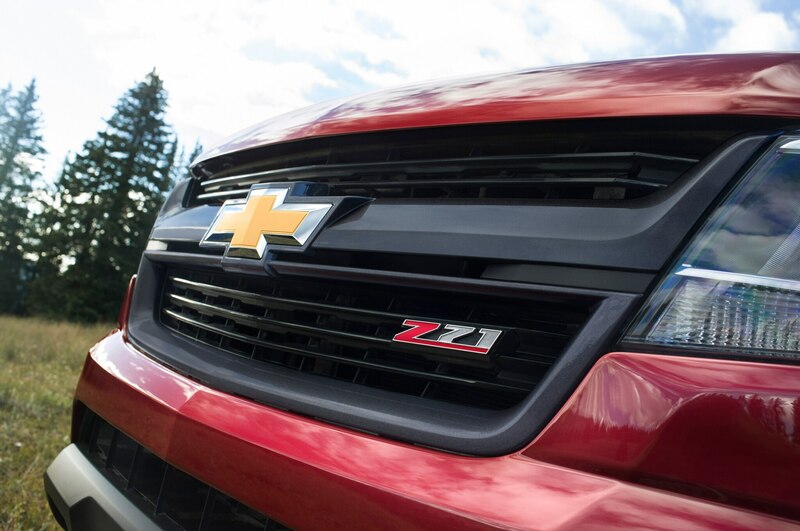 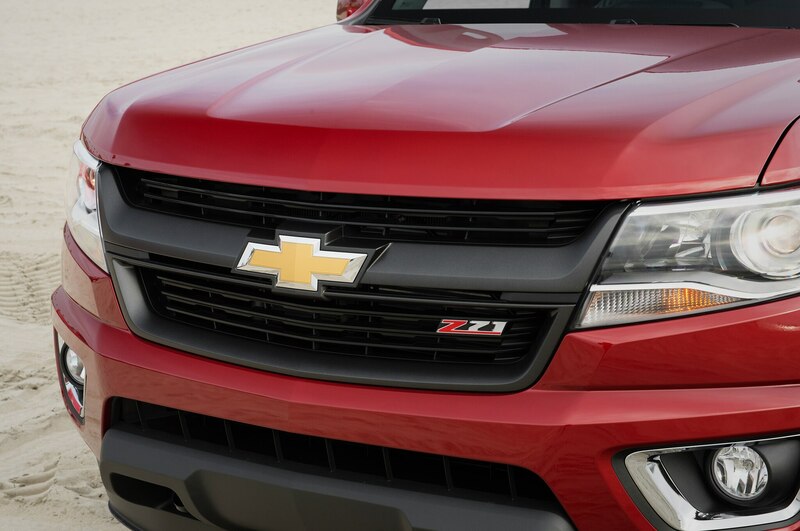 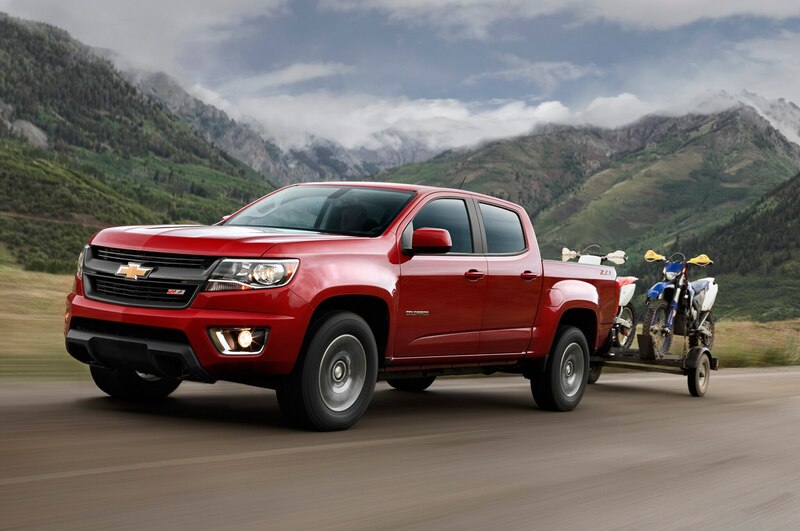 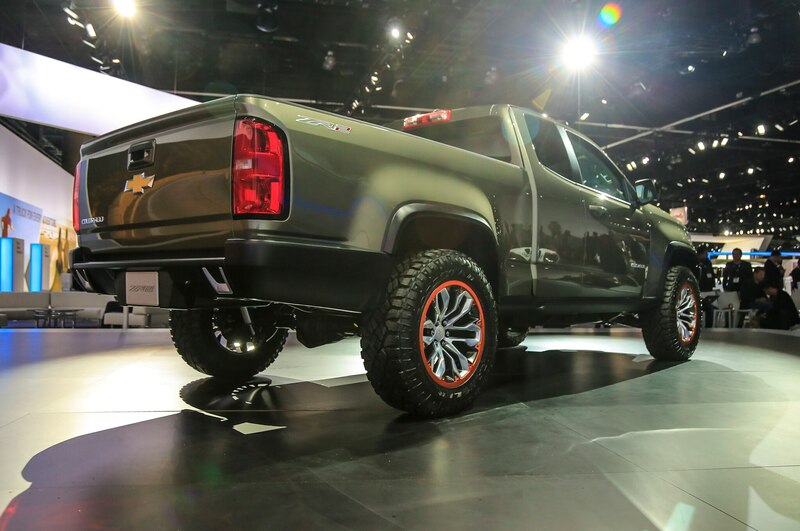 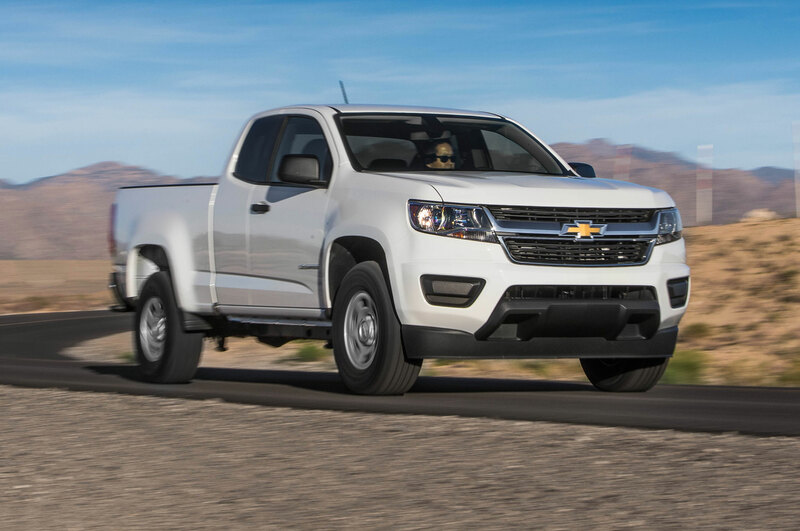 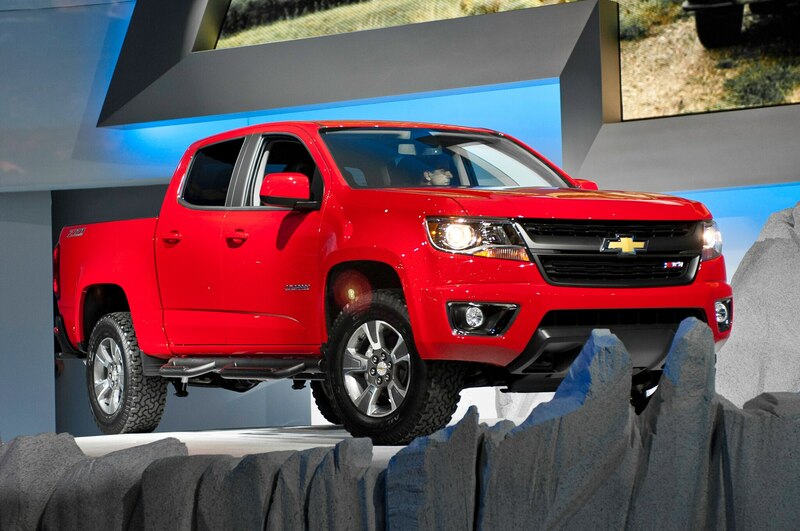 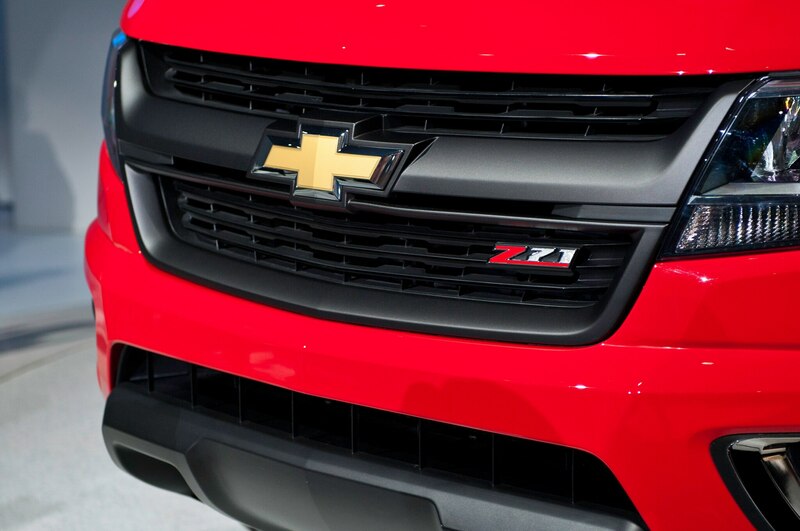 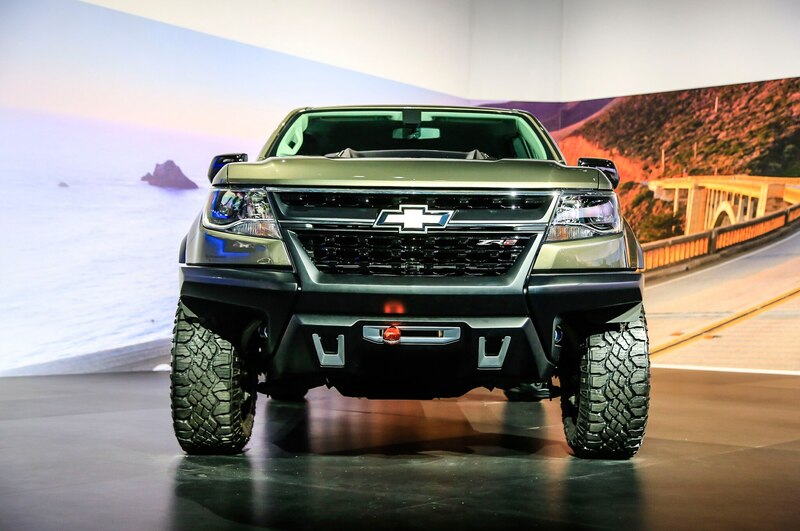 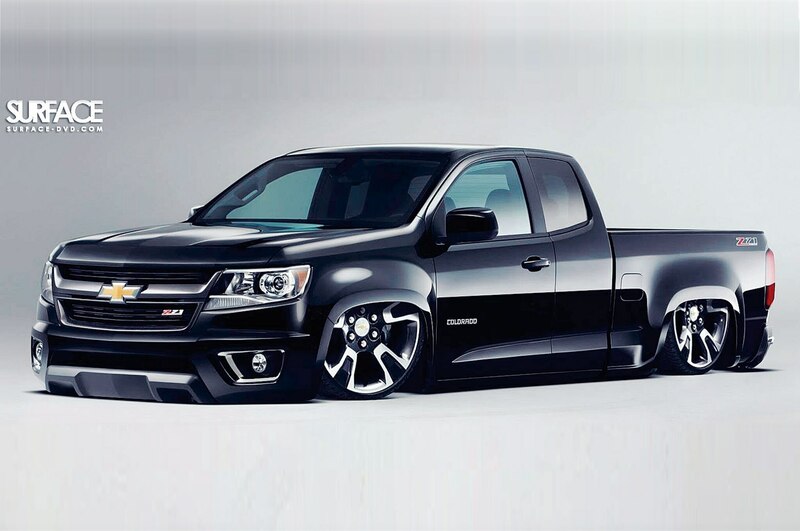 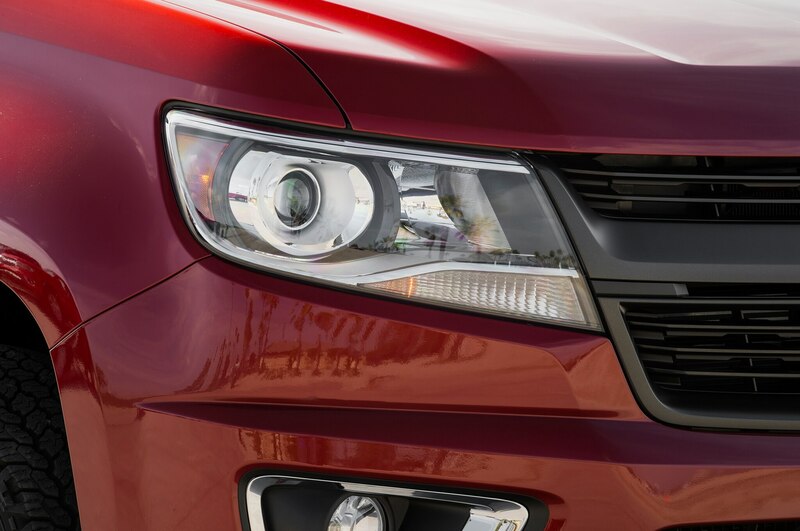 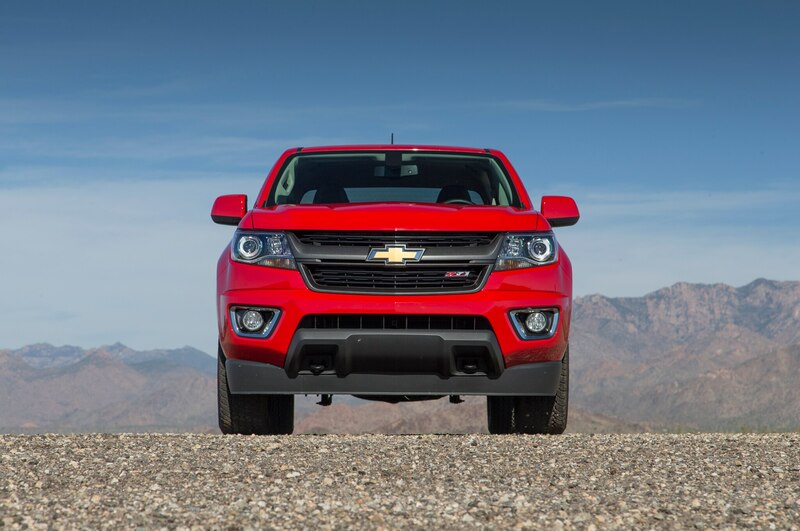 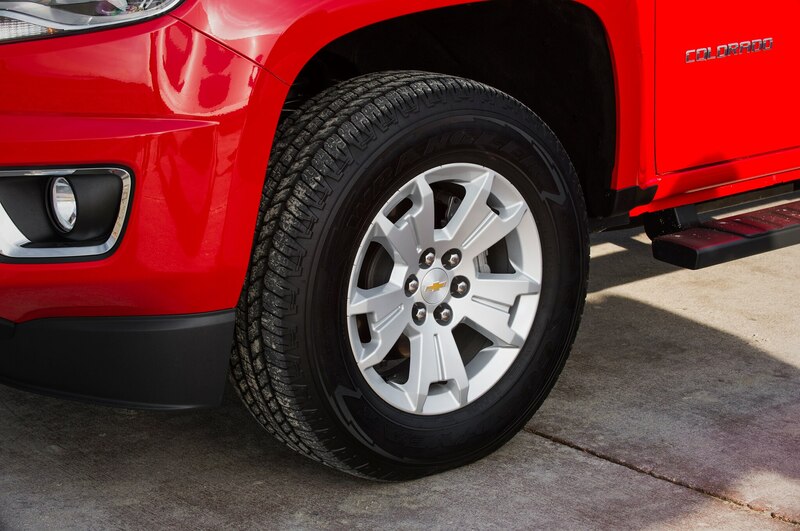 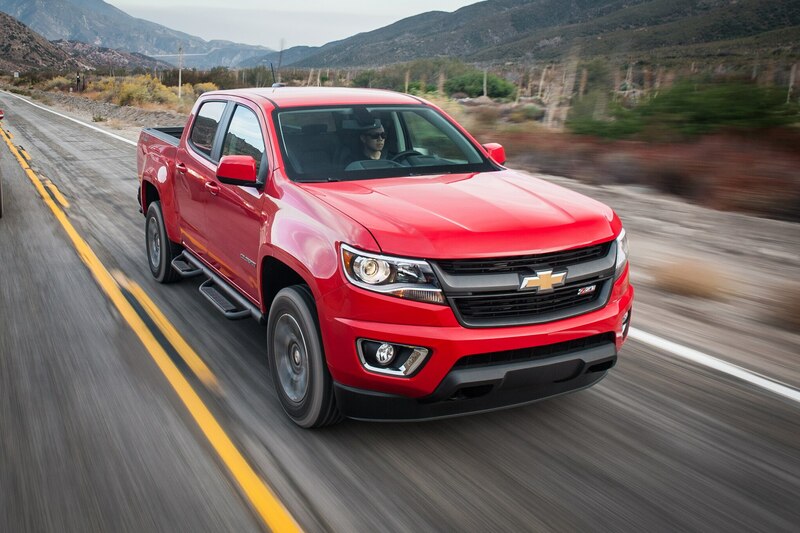 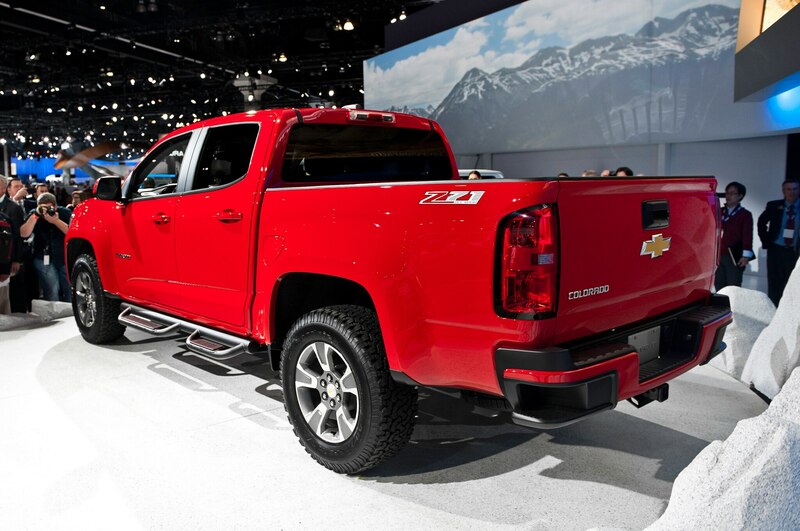 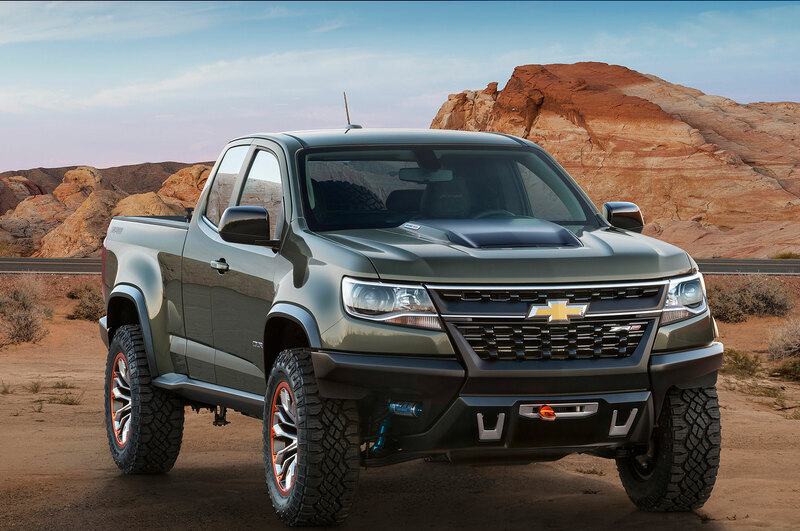 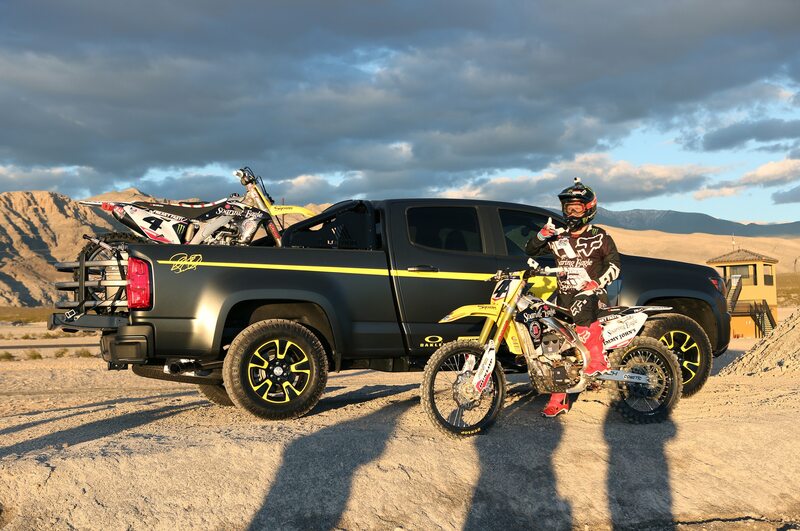 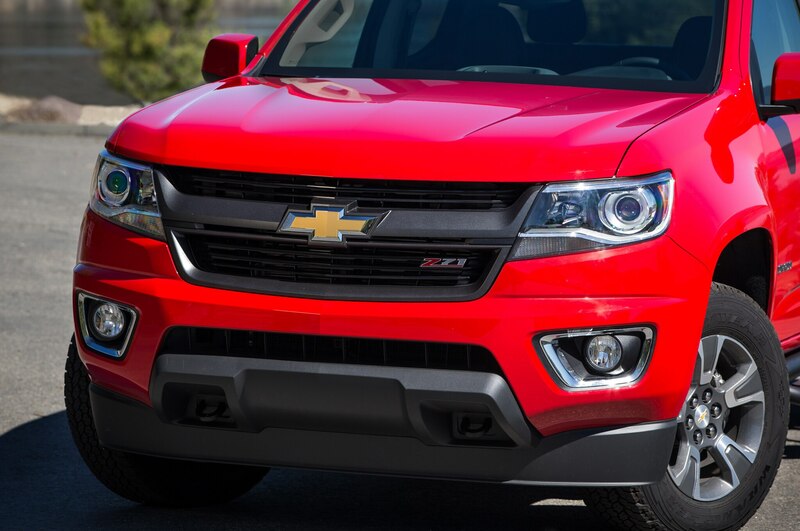 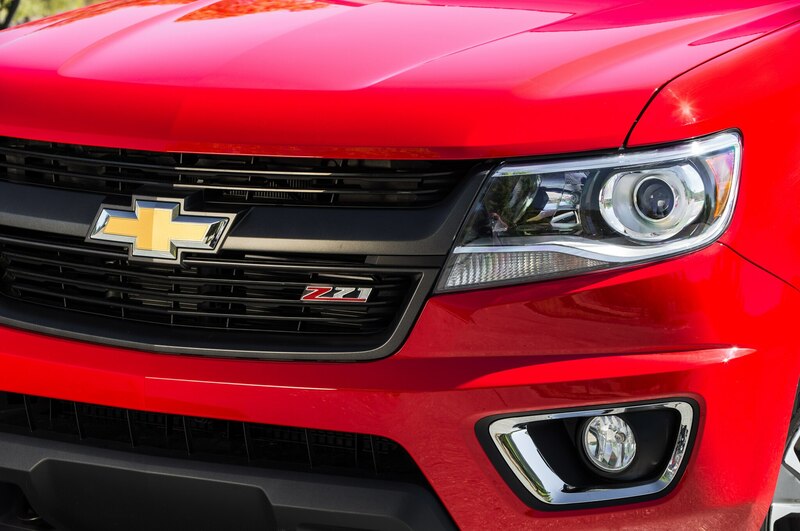 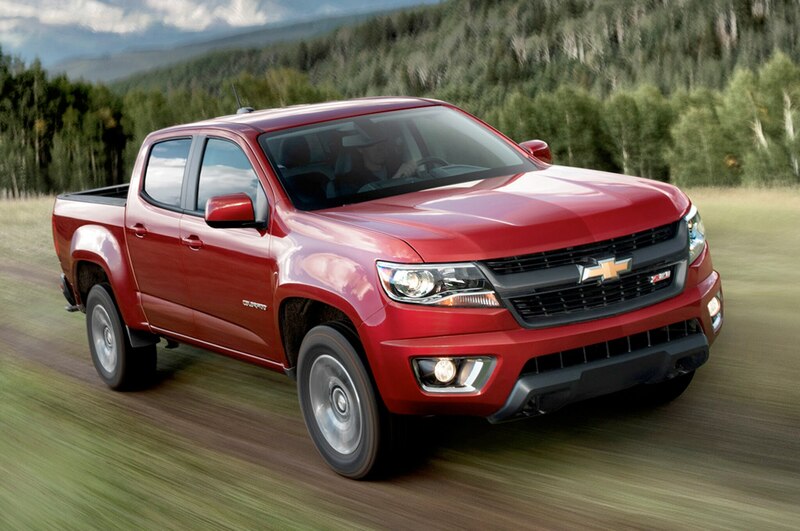 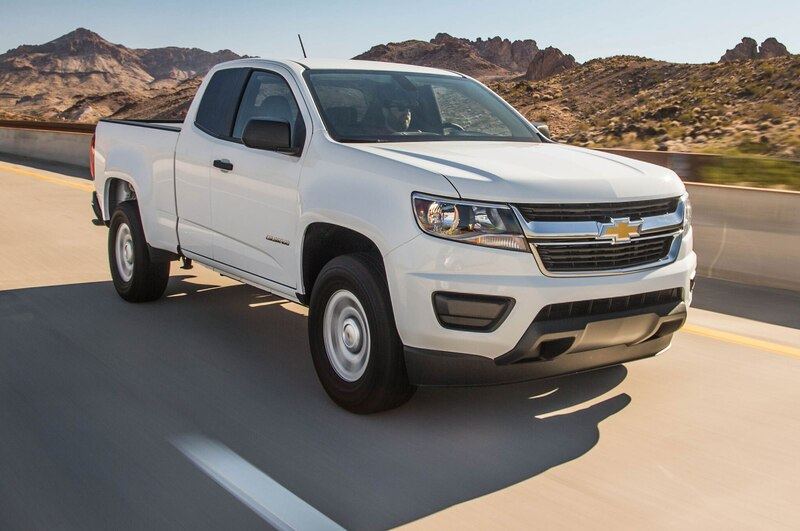 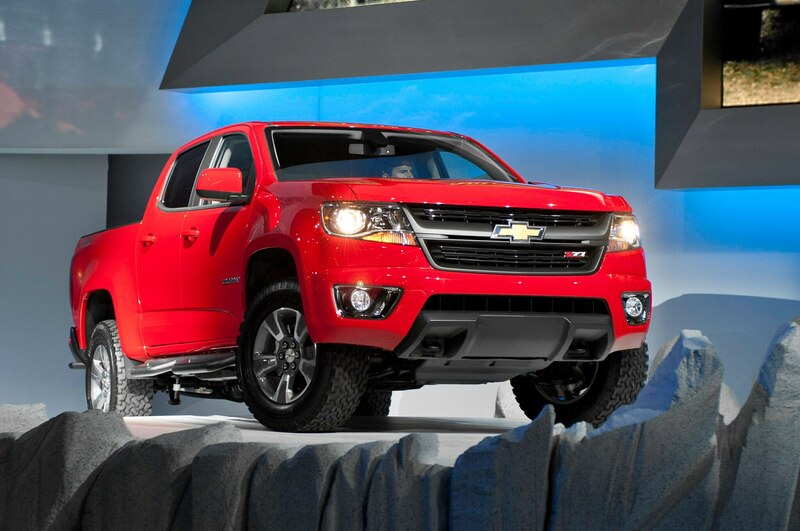 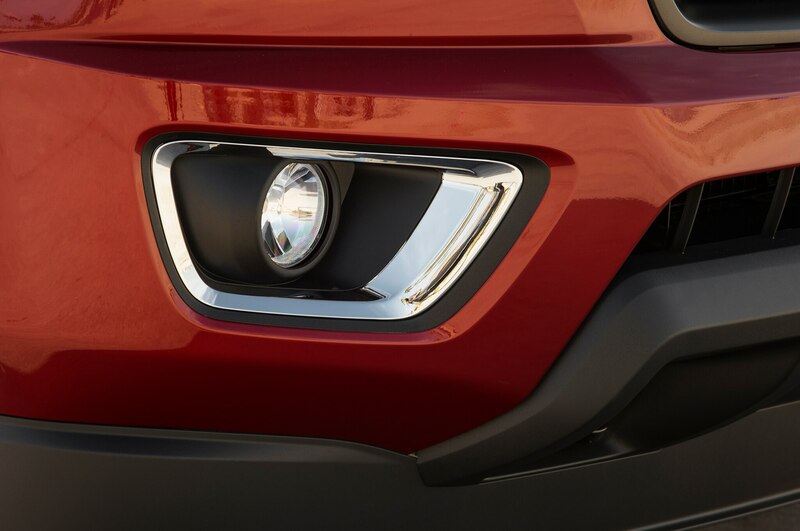 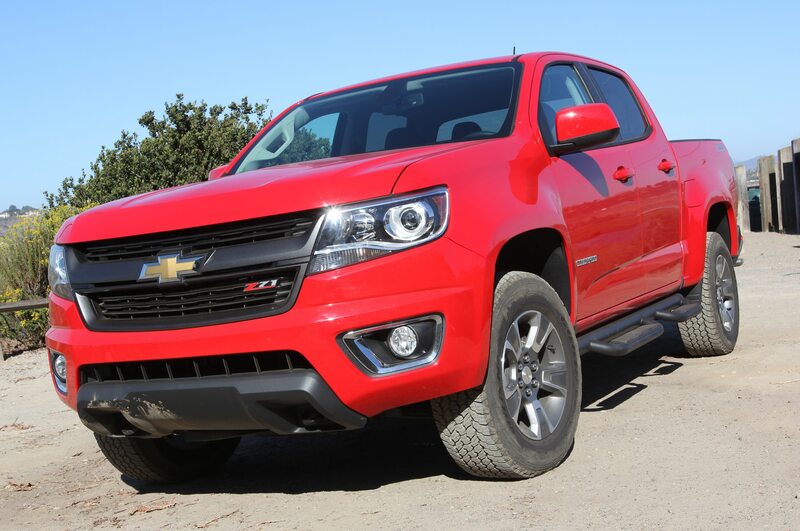 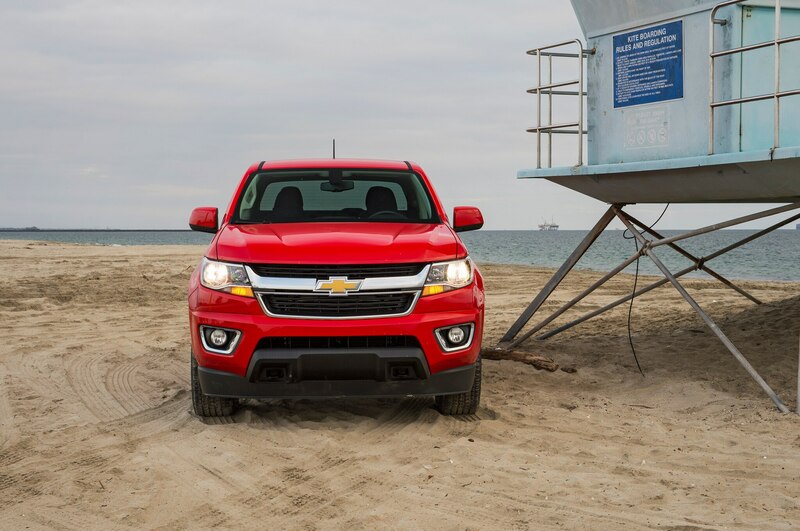 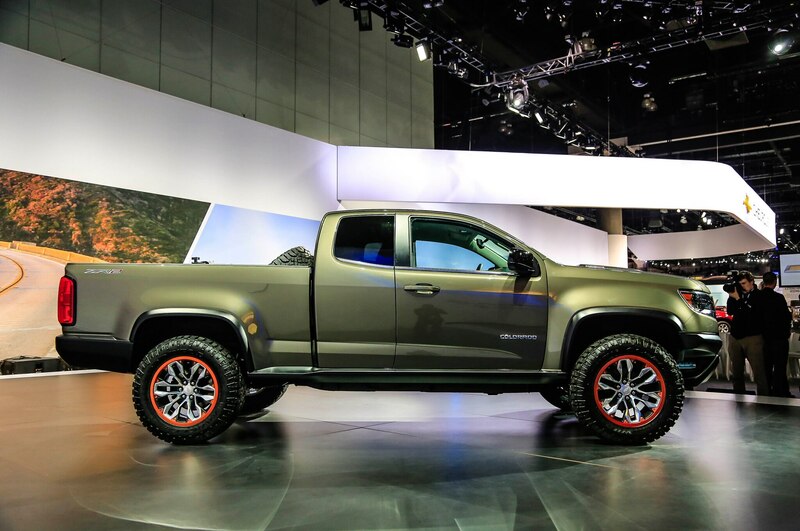 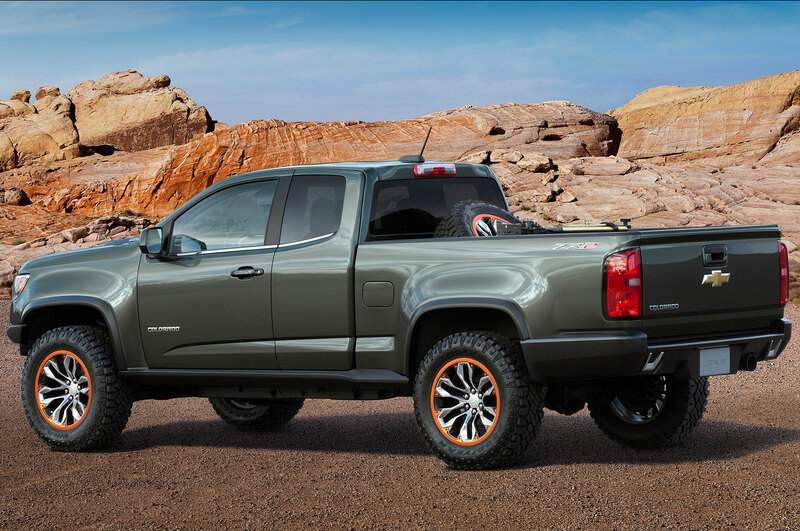 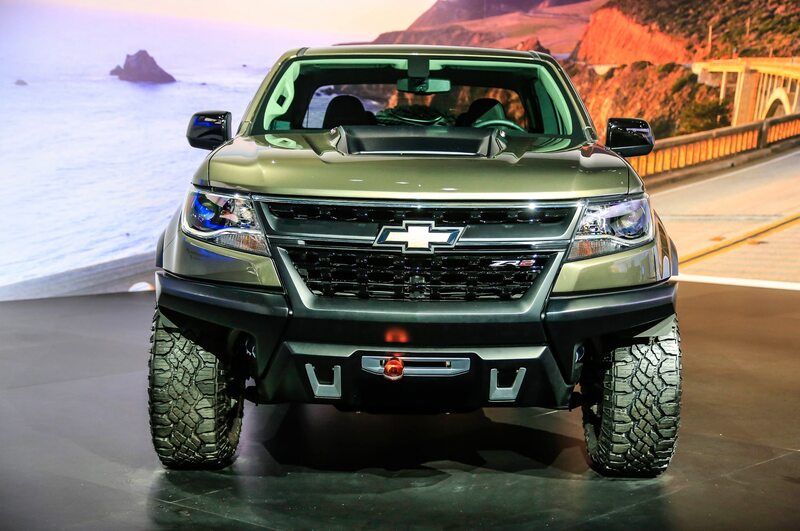 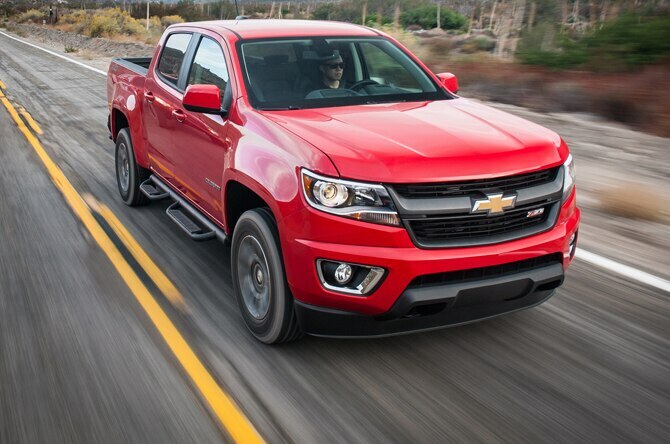 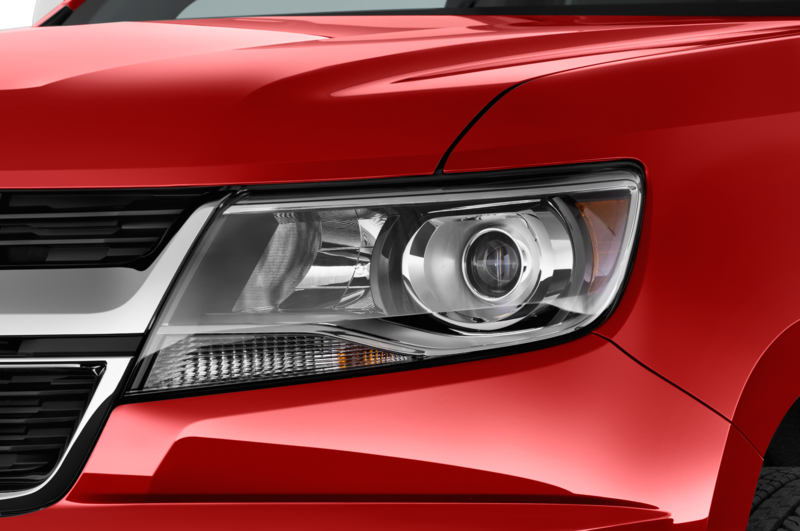 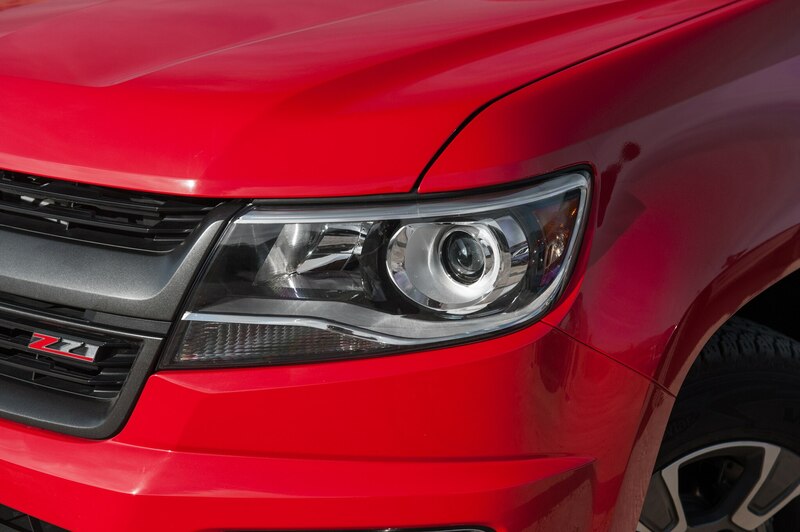 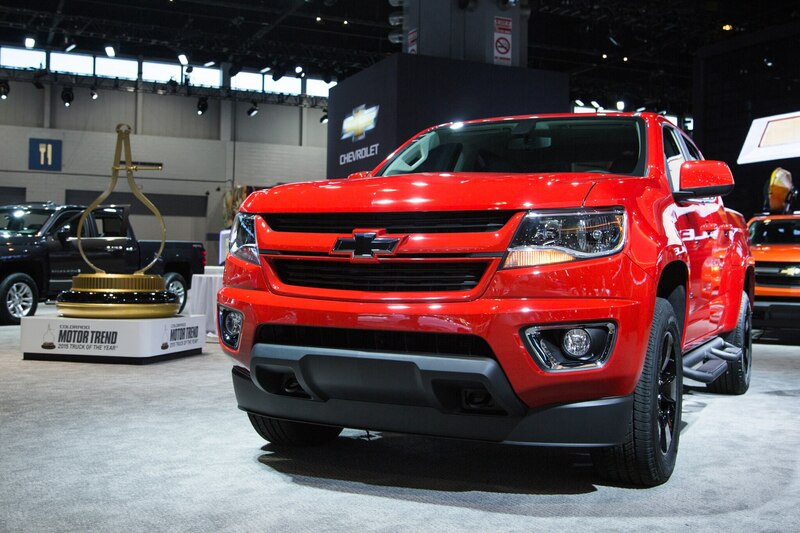 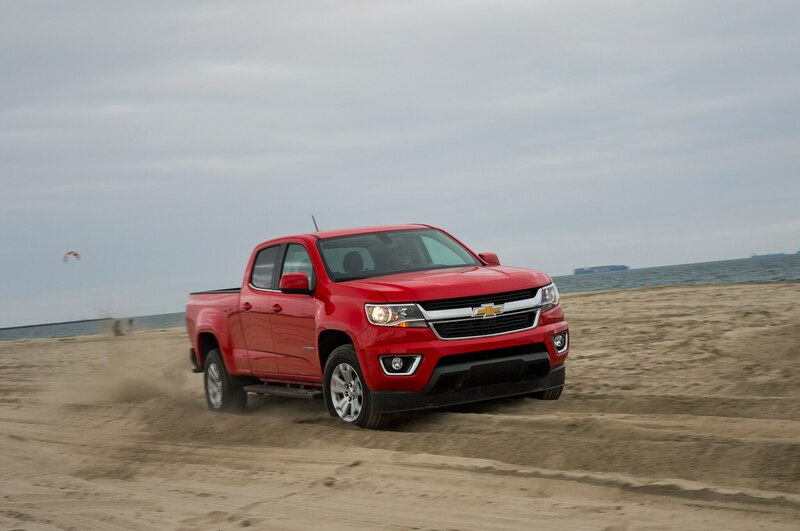 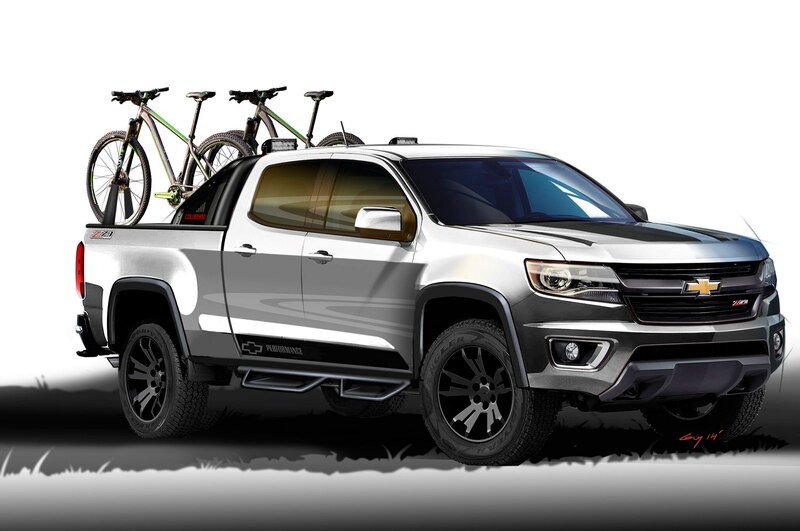 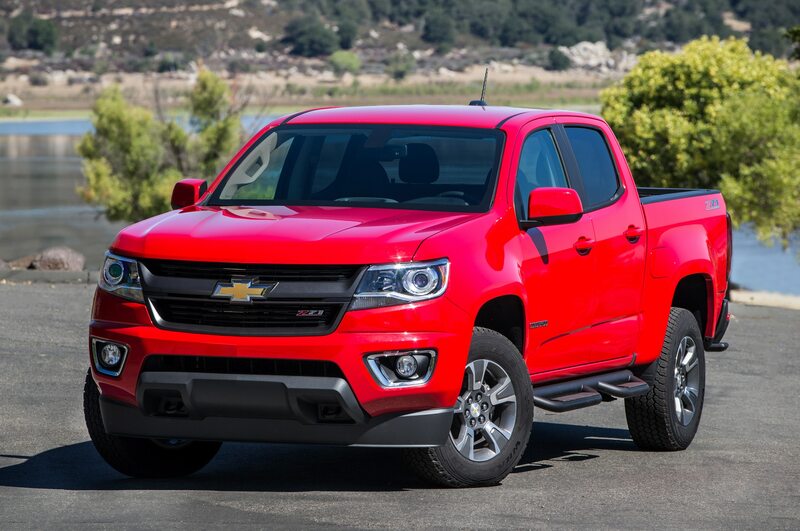 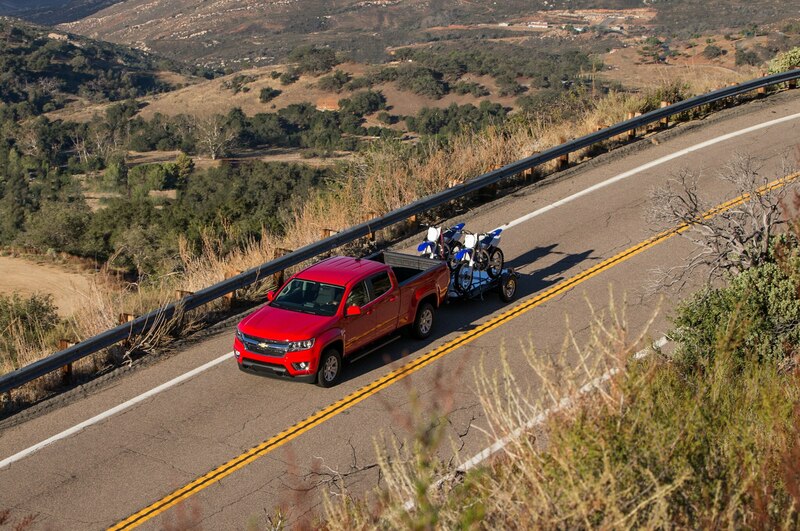 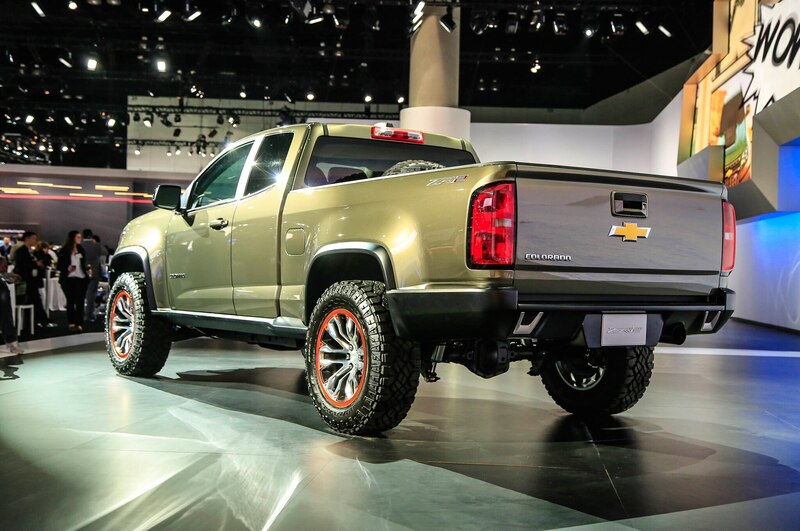 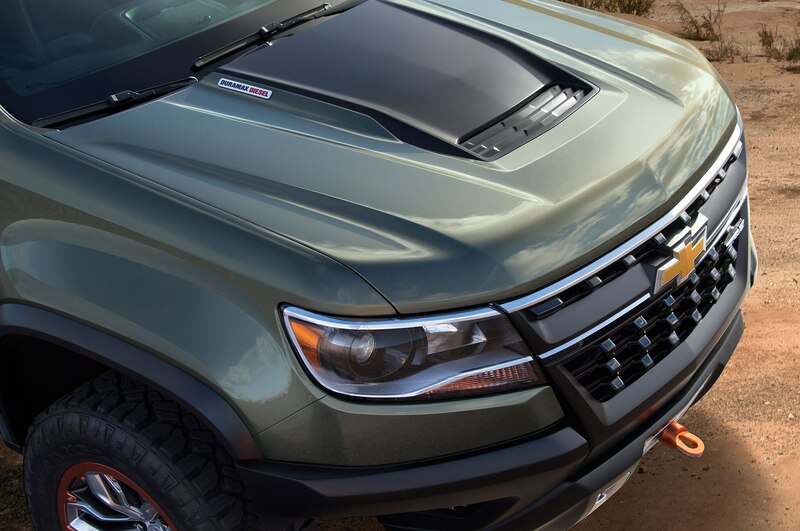 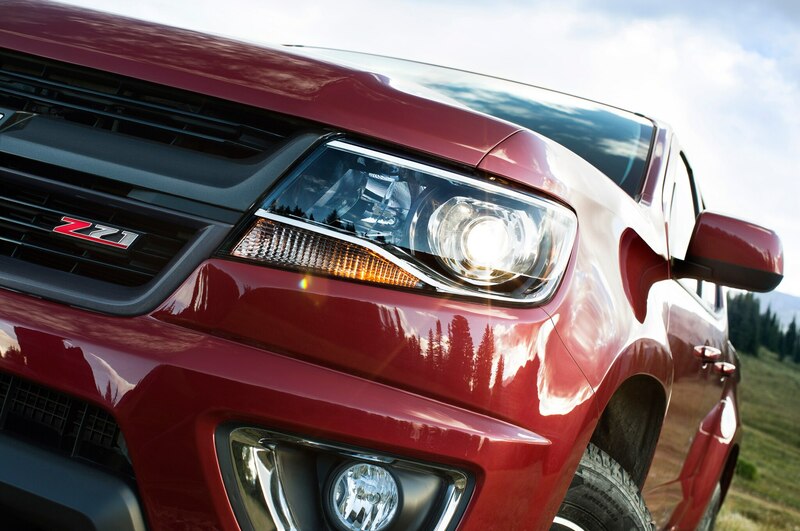 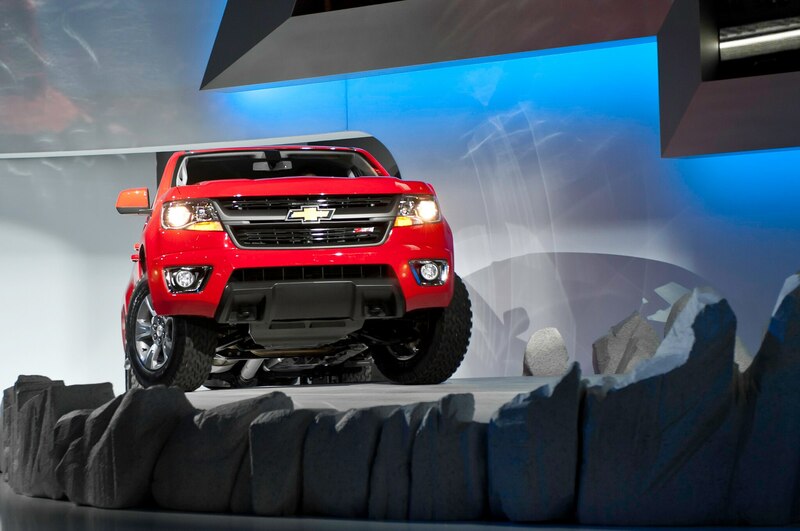 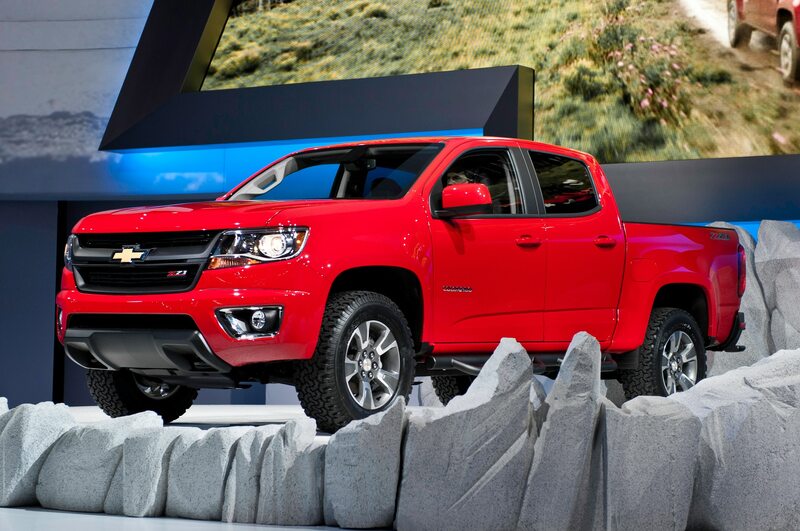 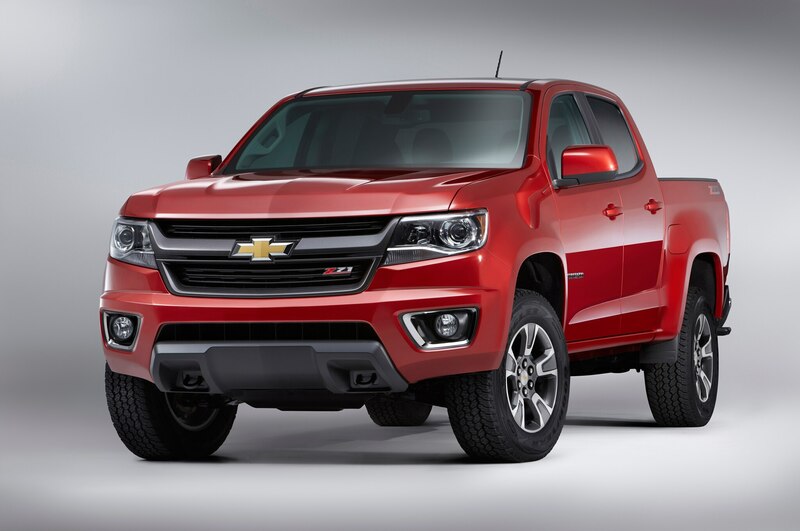 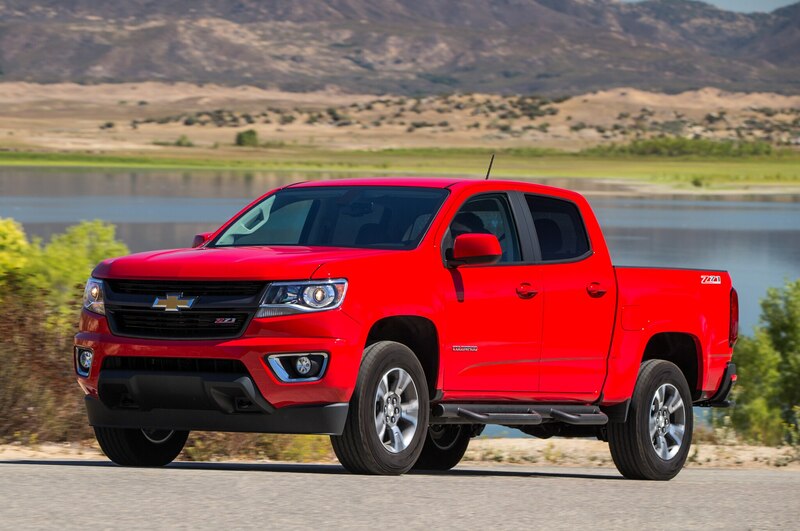 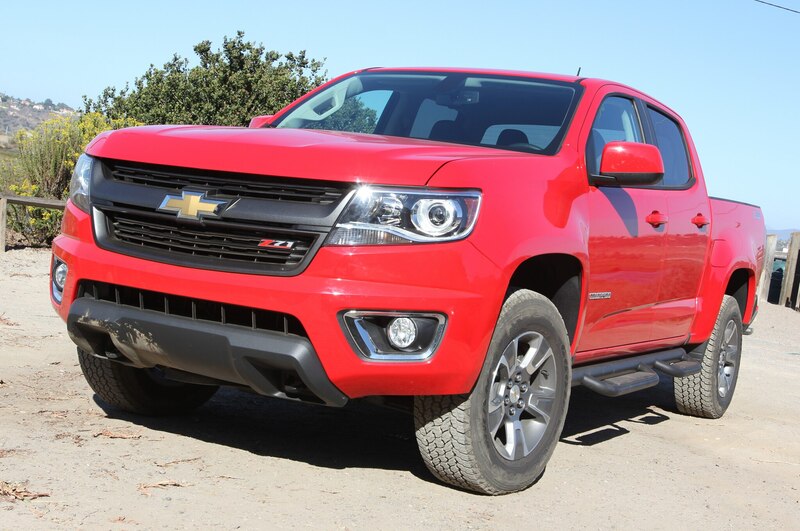 So it’s not a surprise that the Chevy Colorado looks the part and weighs in around two tons. 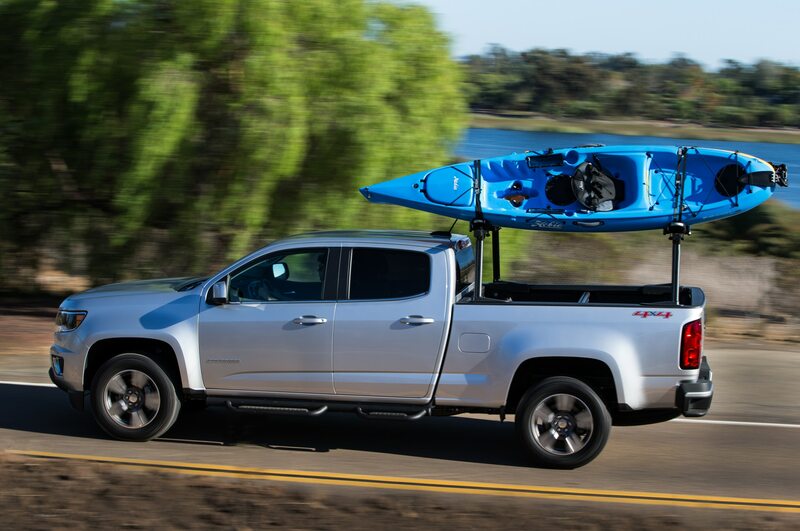 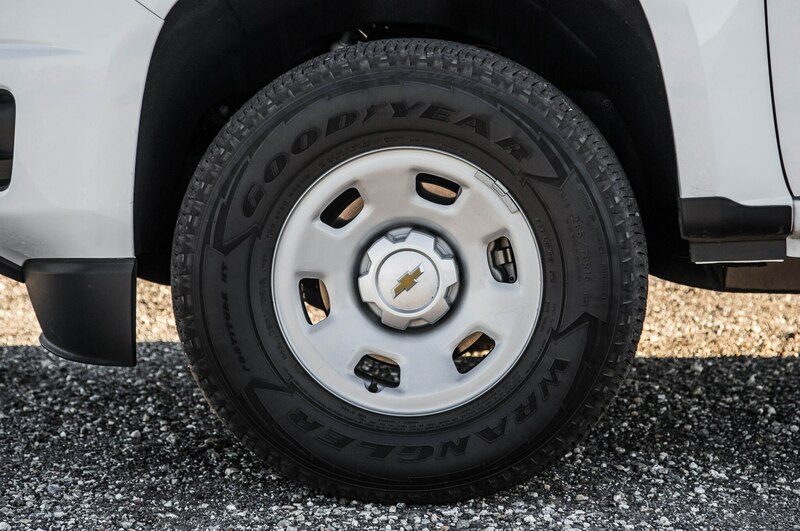 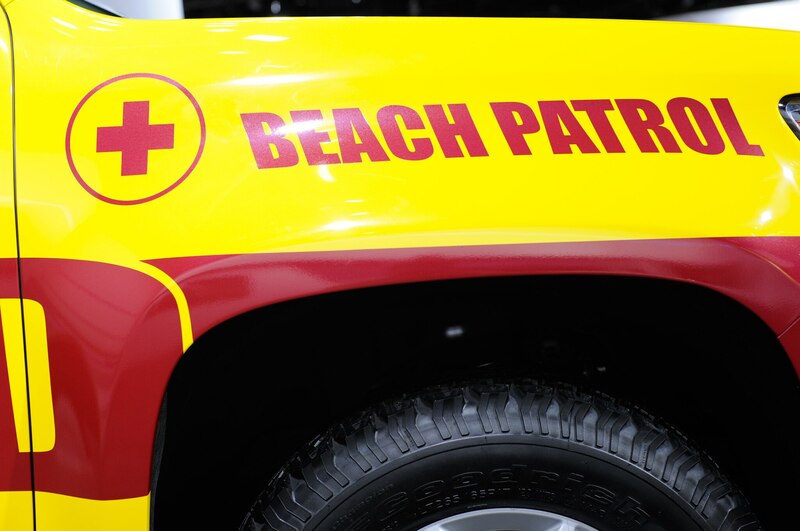 At first glance, a fellow mechanic along for the ride whistled and said, “Does it need to be so big?” The Colorado is 212.7 inches long on a 128.3-inch wheelbase, with a 3,500-pound towing capacity and a payload limit of 1,410 pounds. 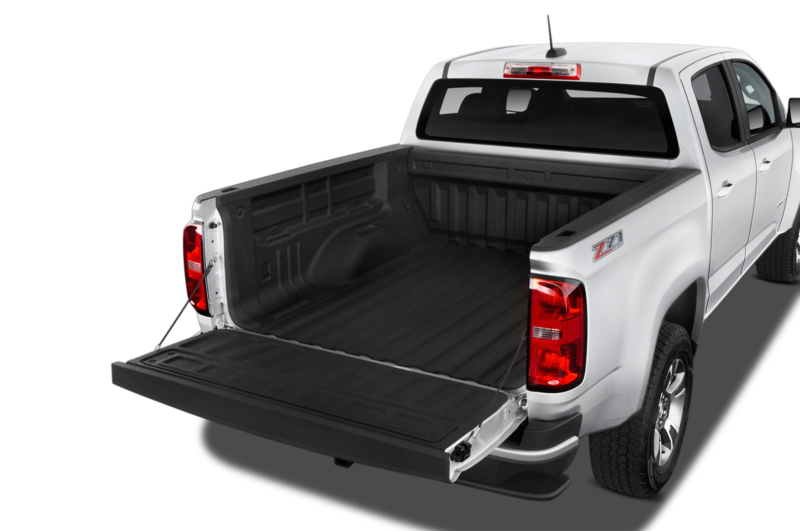 Small truck towing/payload numbers, bigger truck dimensions. 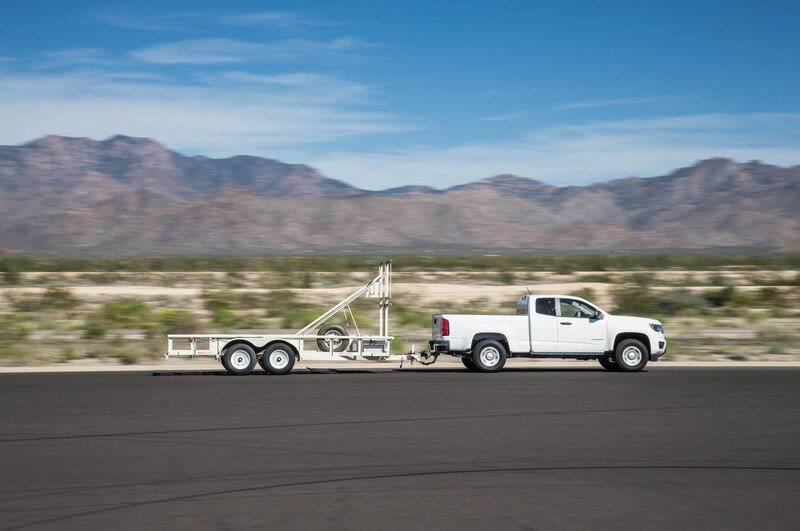 Some towing was required during our test, but it was a lightweight job. 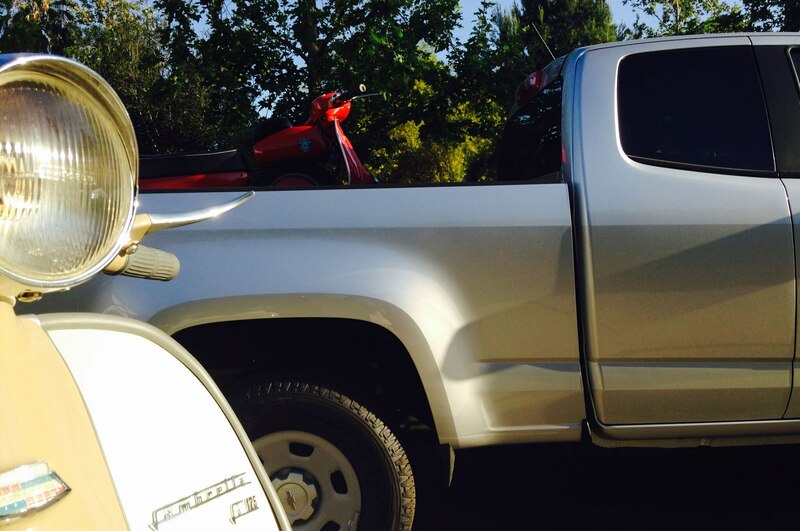 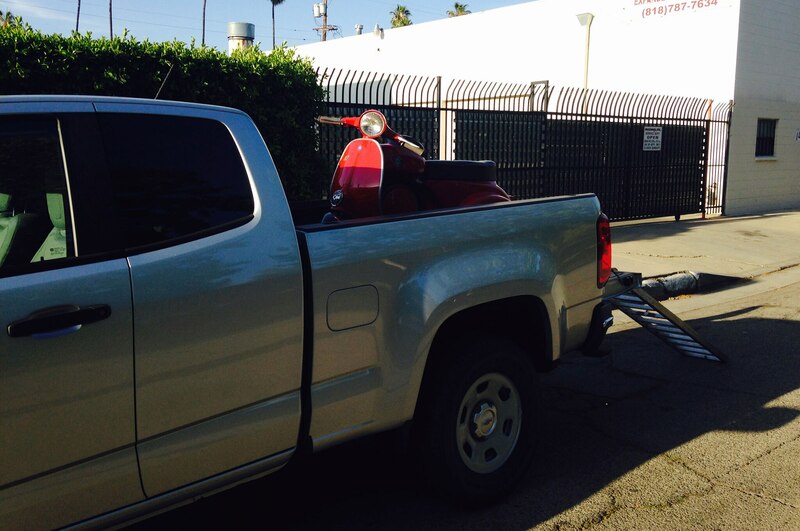 We loaded up a small-frame Vespa, which weighs about 200 pounds. 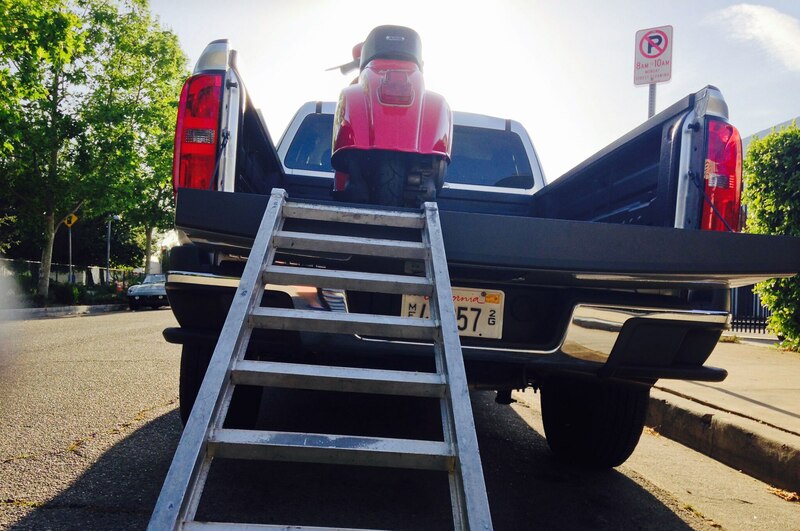 The distance from street to tailgate is 34.2 inches, which made loading a bit of a challenge, especially with a motorcycle ramp. 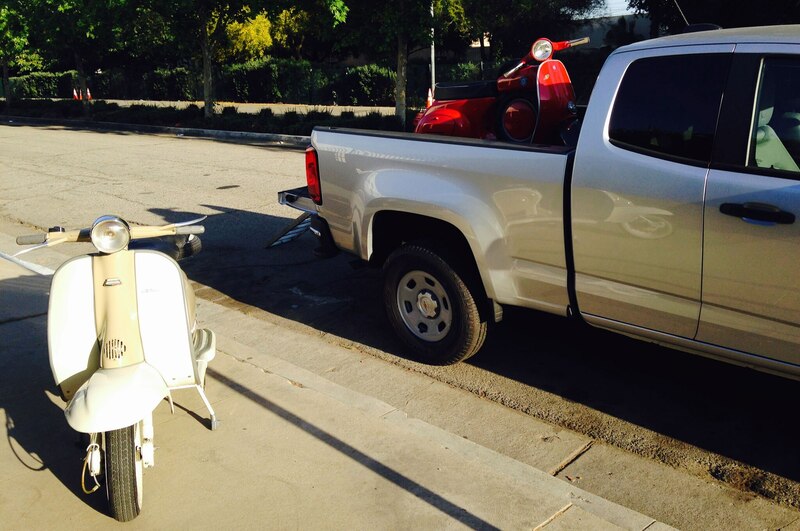 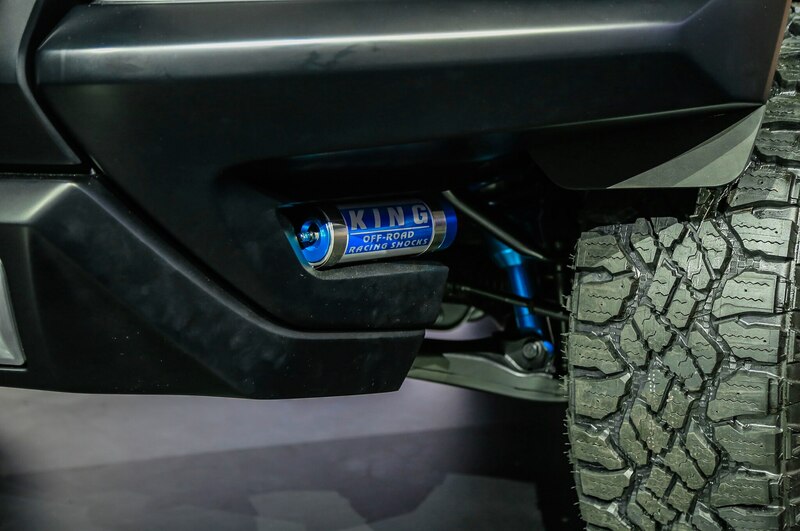 The angle would have likely given us an exhaust pipe clearance issue at the tailgate edge with a bigger bike. 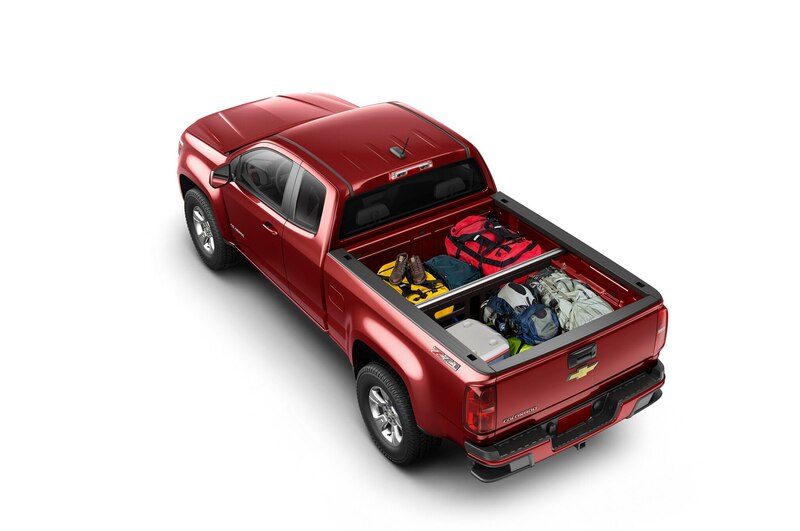 That said, the cargo box is spacious enough for a hefty lumber payload from Home Depot at 49.9 cubic feet. 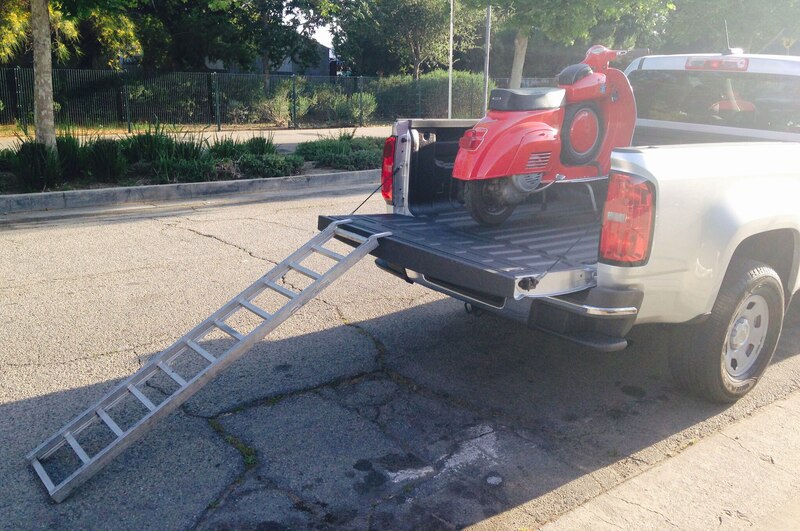 A careful packer might be able to wedge two Kawasaki Ninja 300s in the back with the tailgate down, but it would be a lot easier to put them on a trailer. 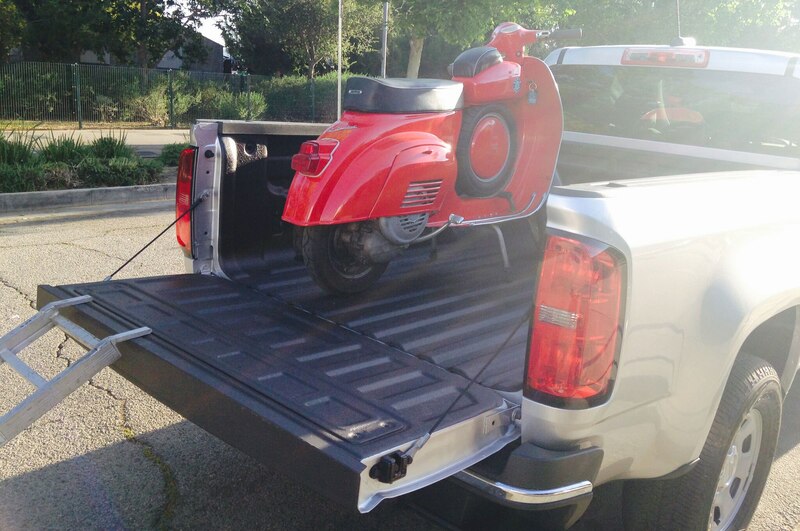 We had no such concerns with the Vespa, and the Colorado had more than enough attachment points in the bed to tie it down. 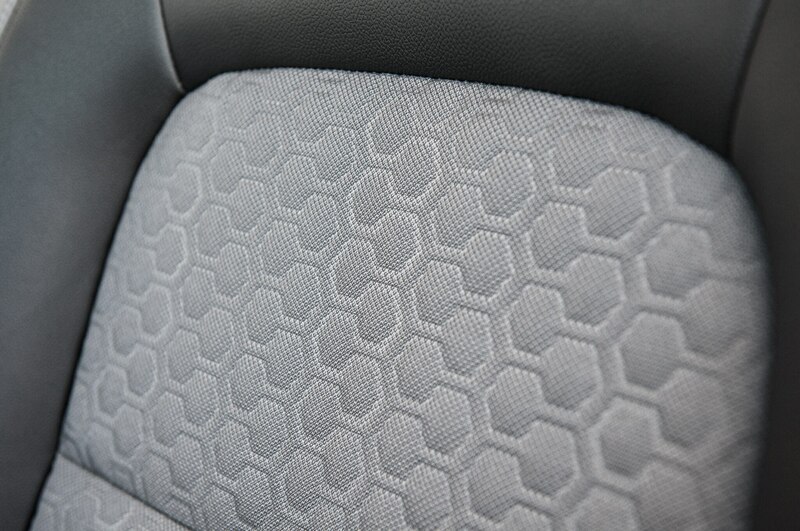 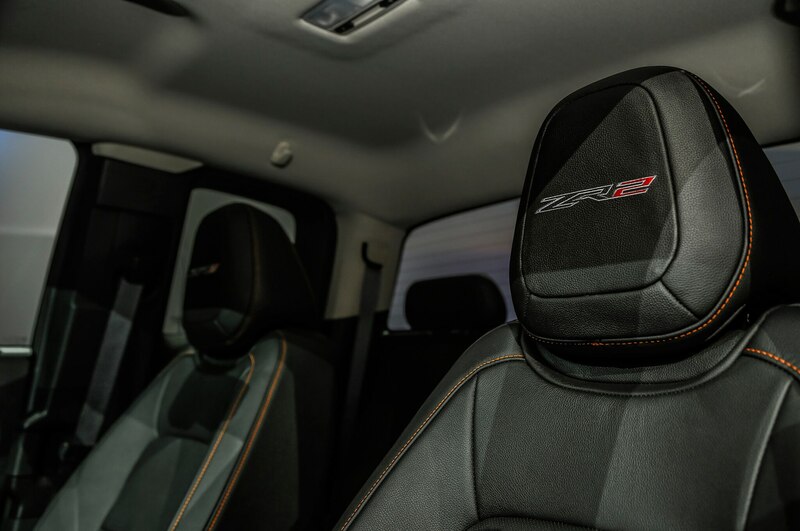 Now, about those rear seats. 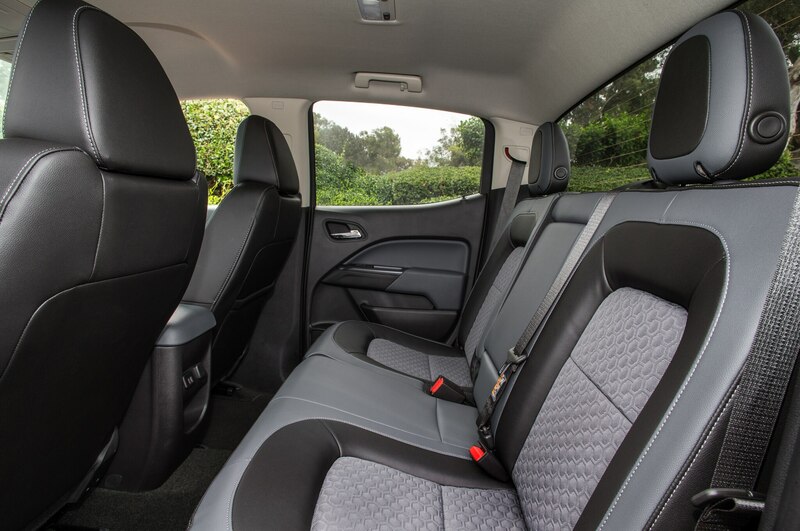 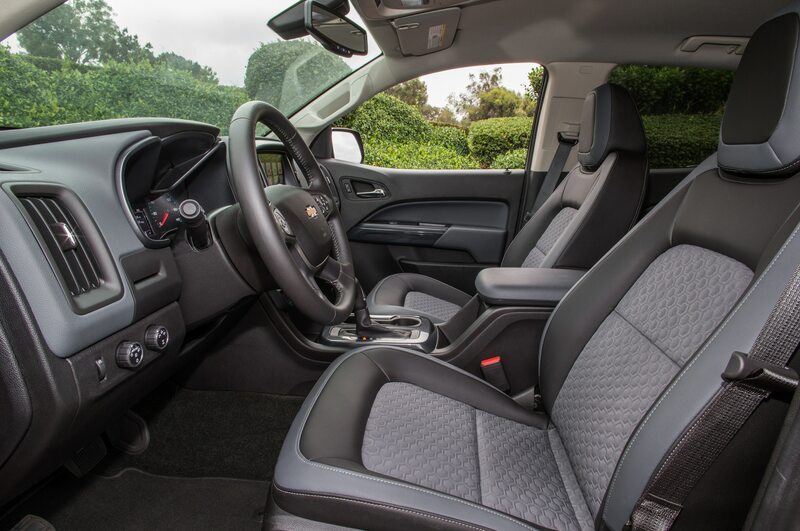 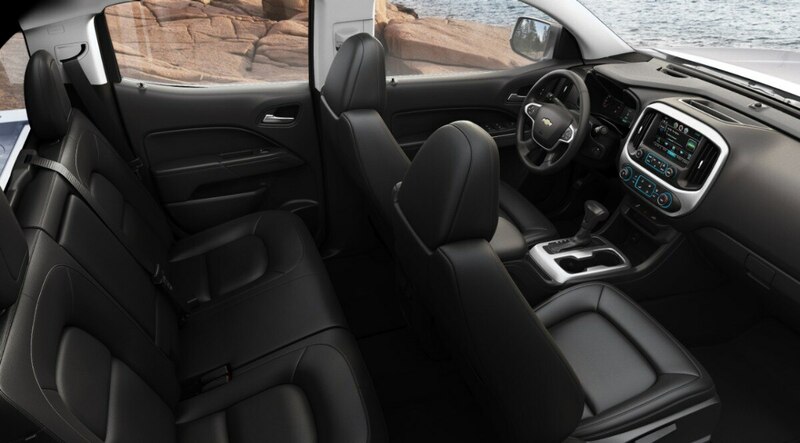 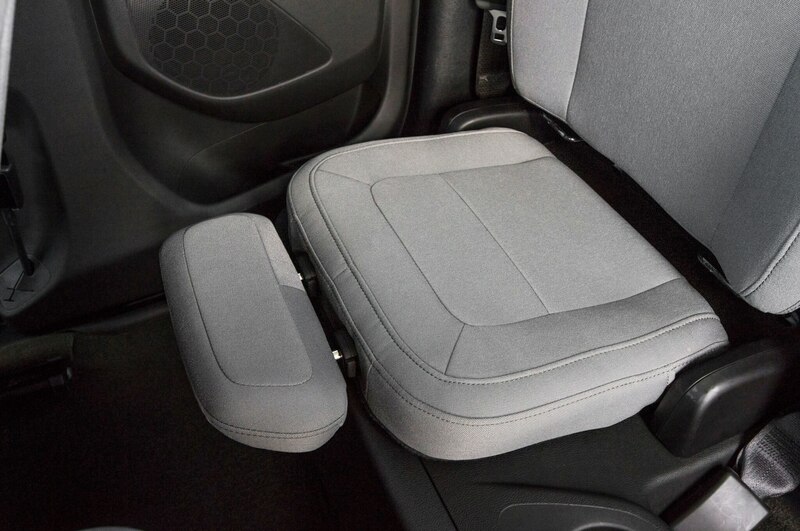 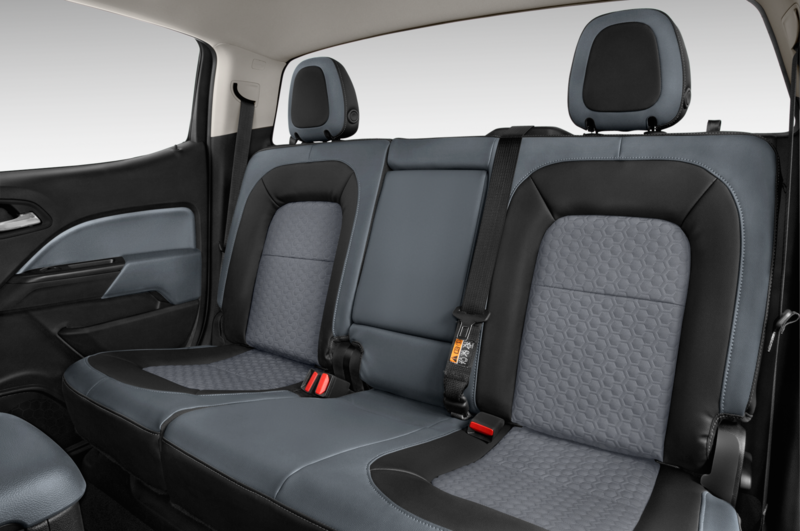 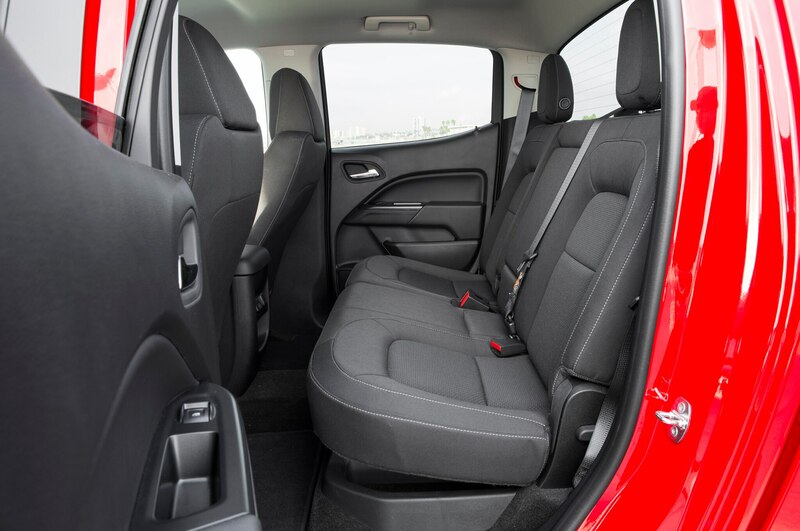 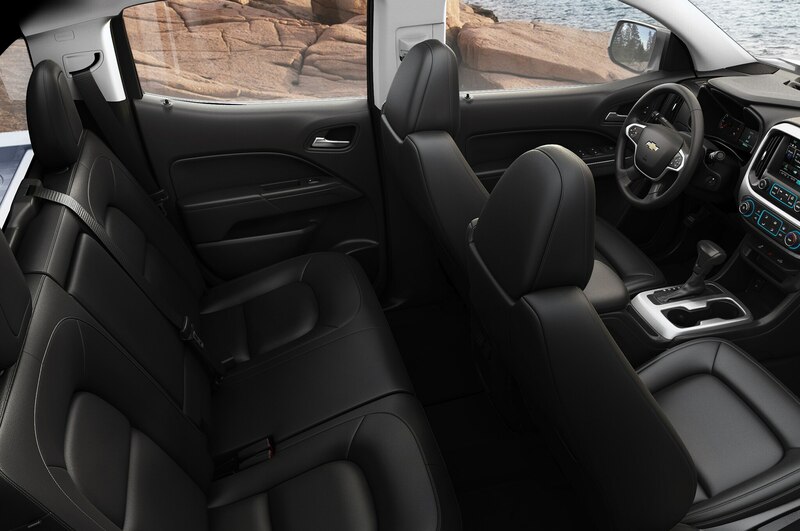 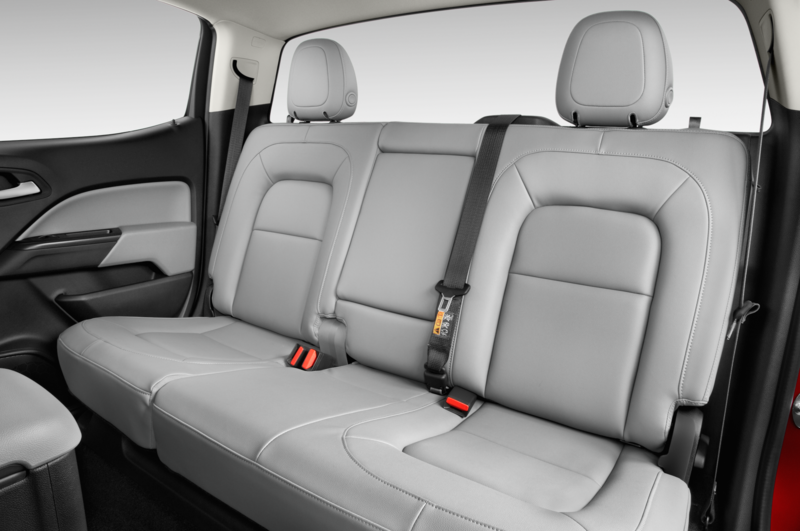 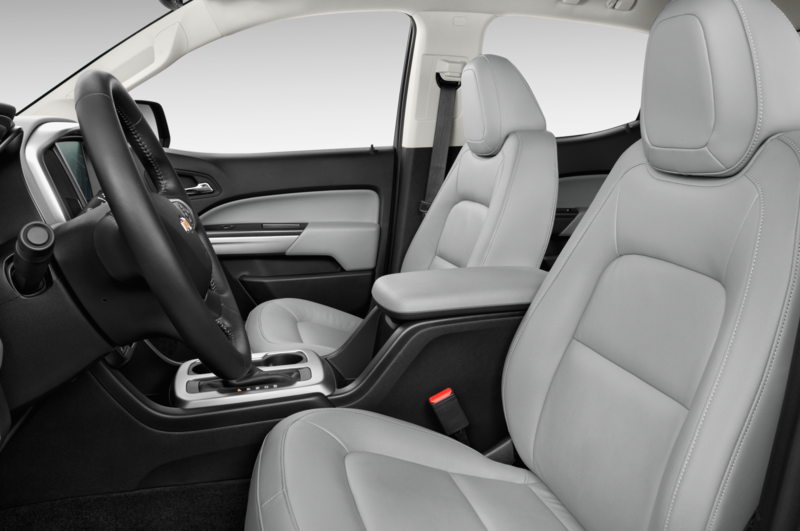 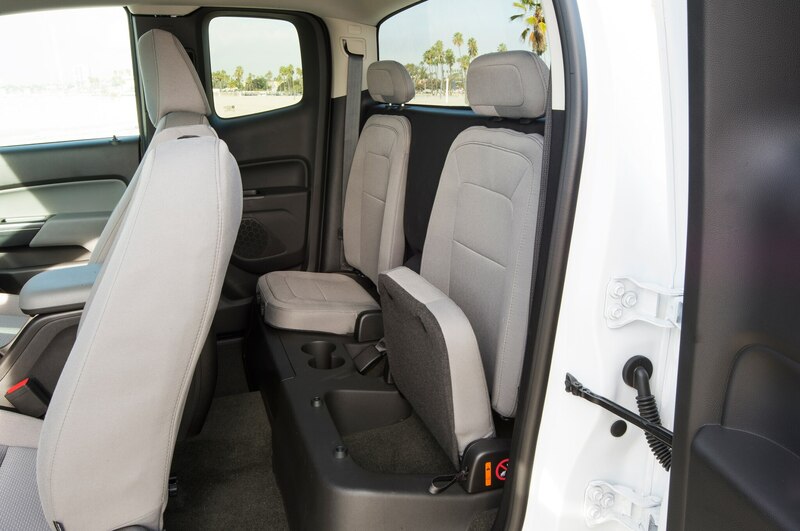 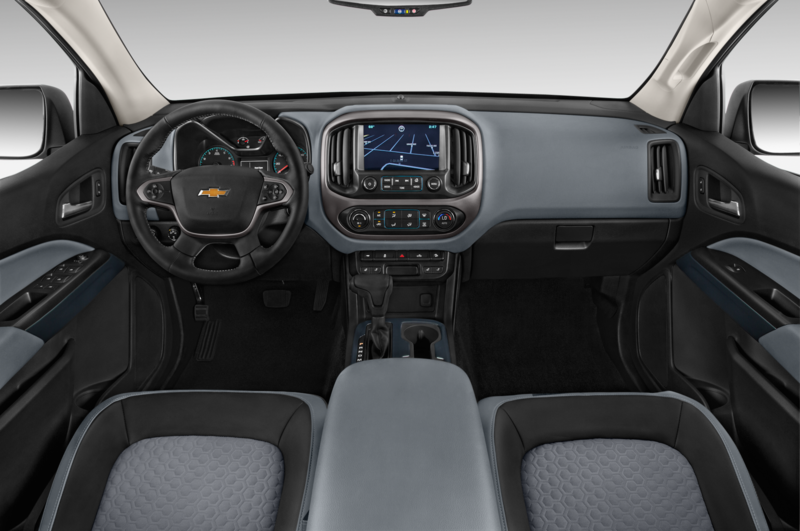 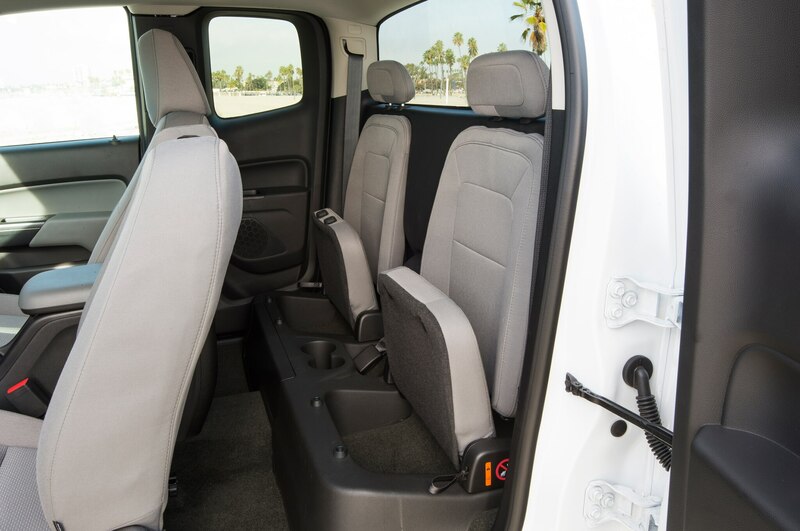 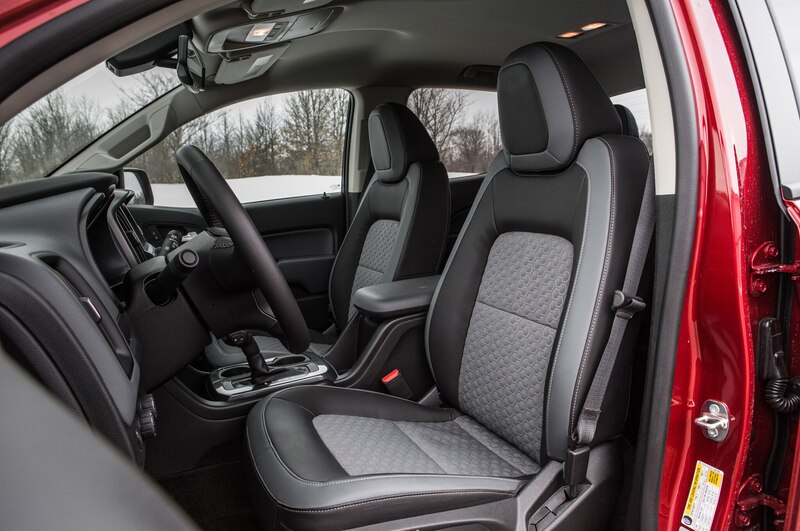 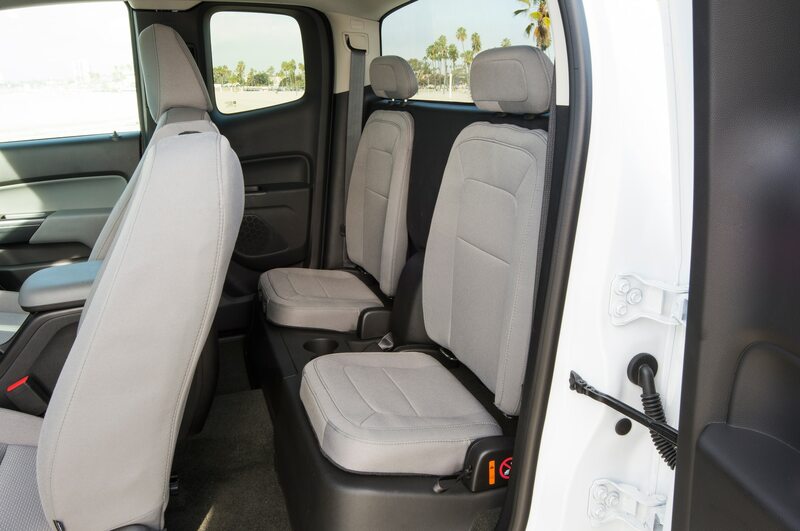 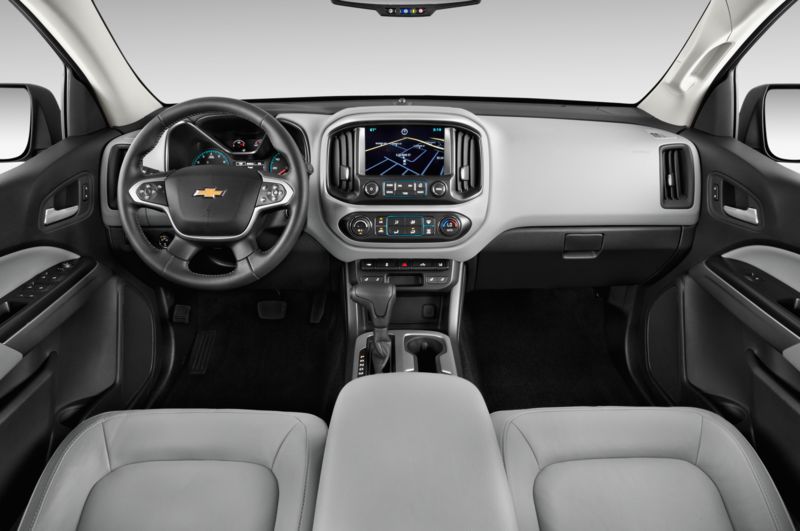 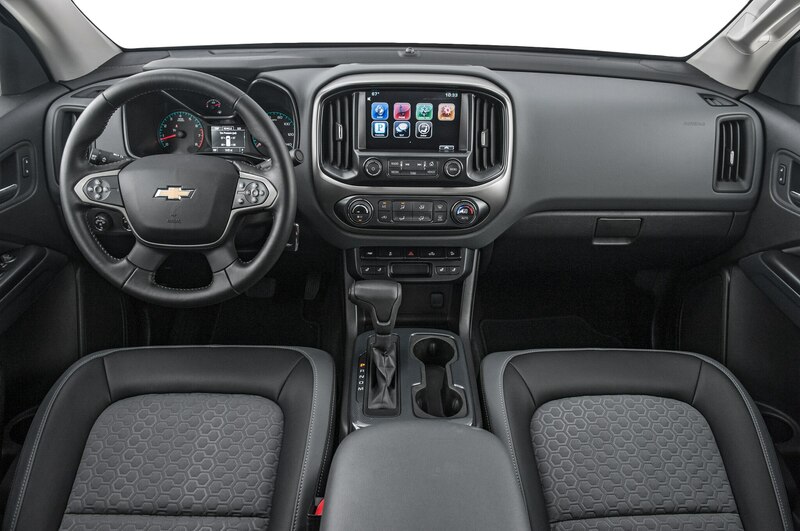 Chevrolet says back-seat passengers enjoy 28.6 inches of legroom. 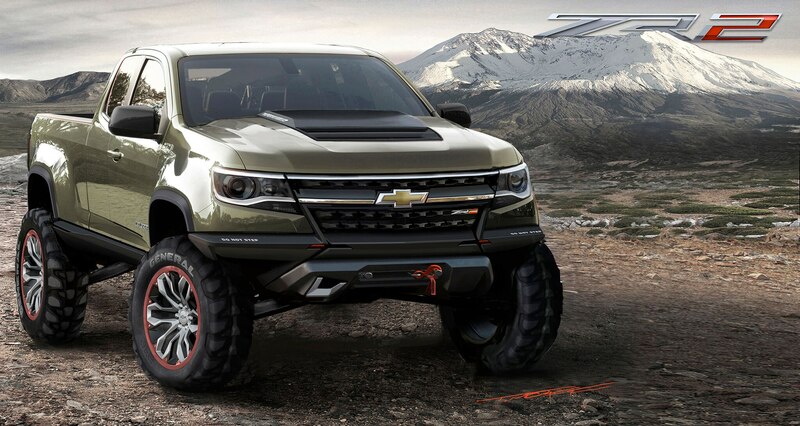 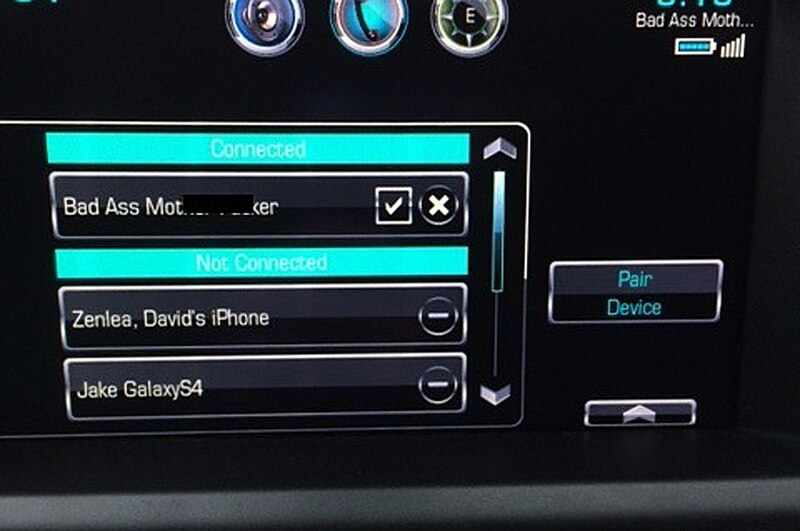 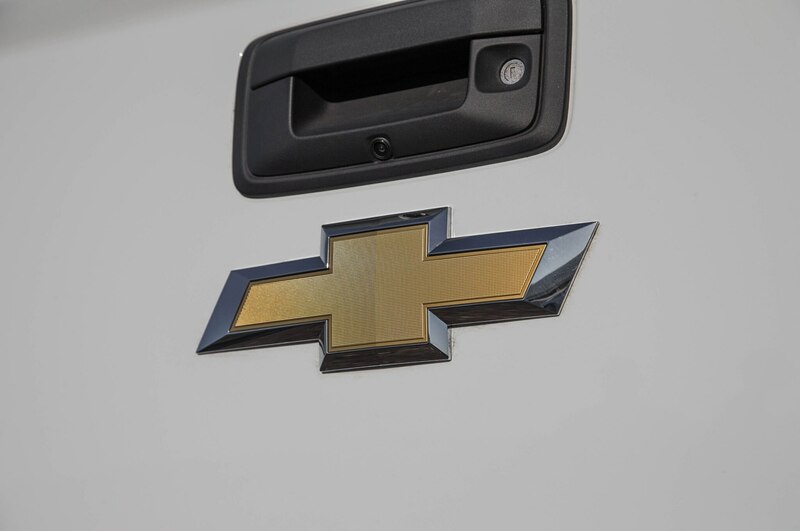 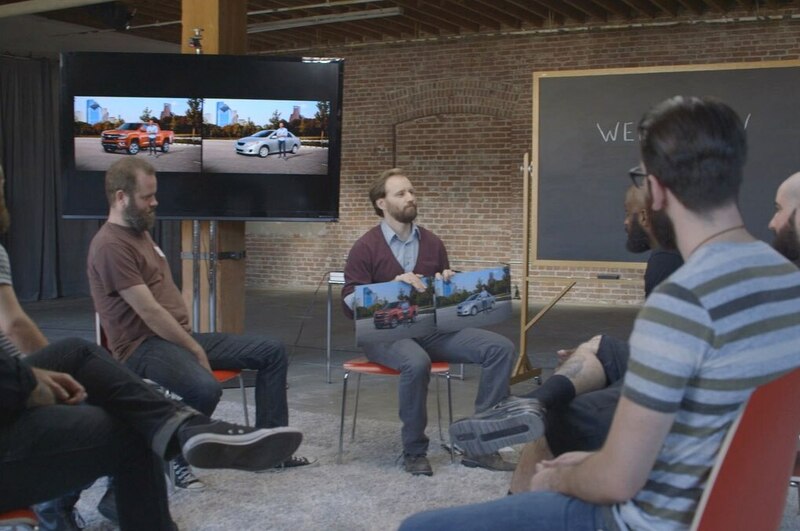 Dear Chevy, in what universe? 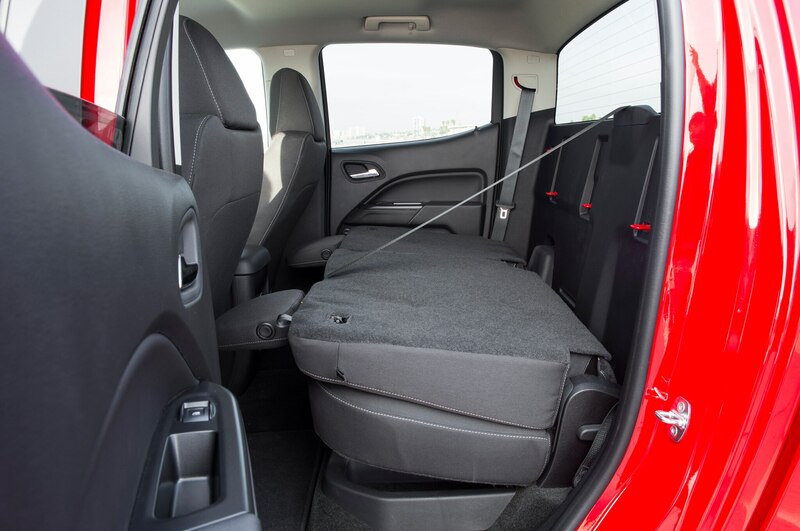 I’ve been in the back of 2+2 sports cars with more space. 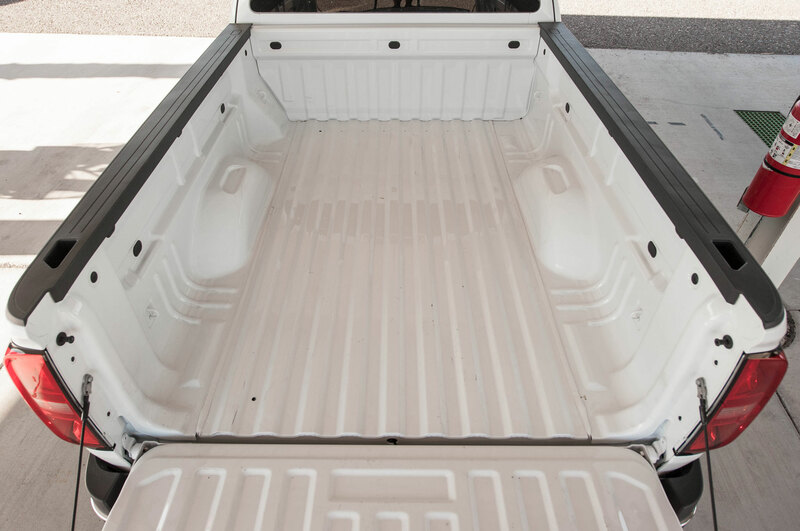 Three of us planned to hop in the truck on Saturday night and head to a nightclub. 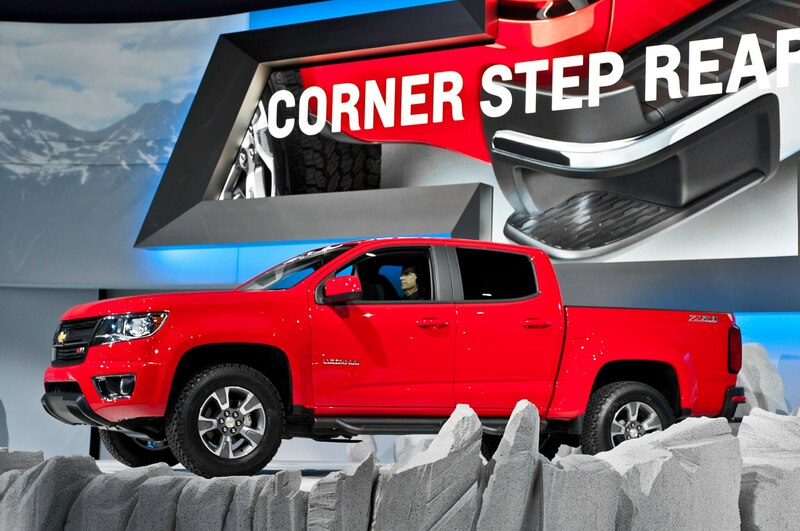 There was no hopping. 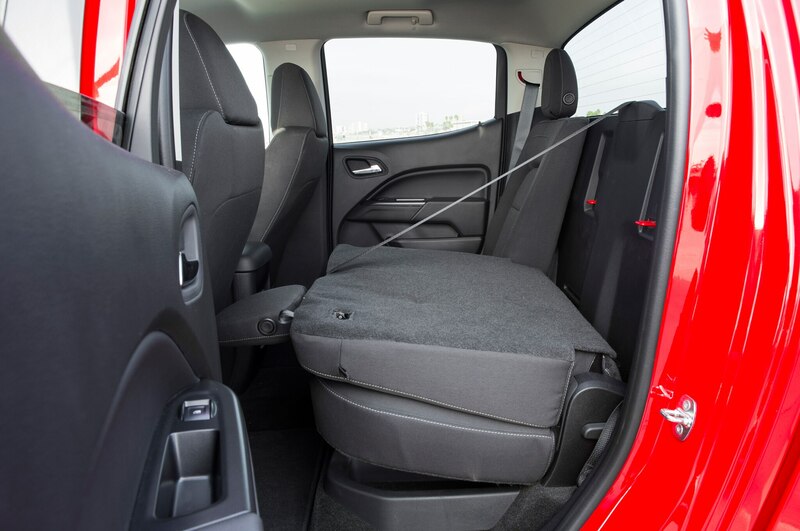 We performed careful human origami on a 6-foot-tall passenger in order to cram him into the back seat. 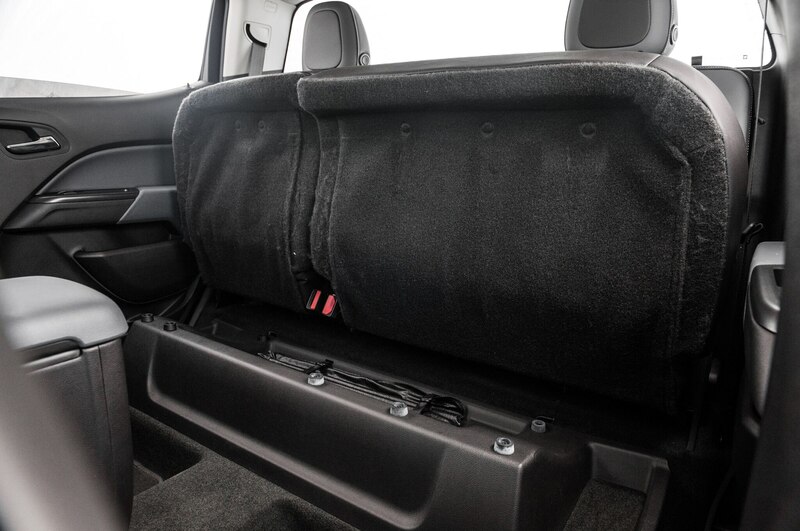 Another 6-foot-tall front seat passenger folded himself in after moving the seat up, becoming dangerously intimate with the dashboard over our 30-minute trip. 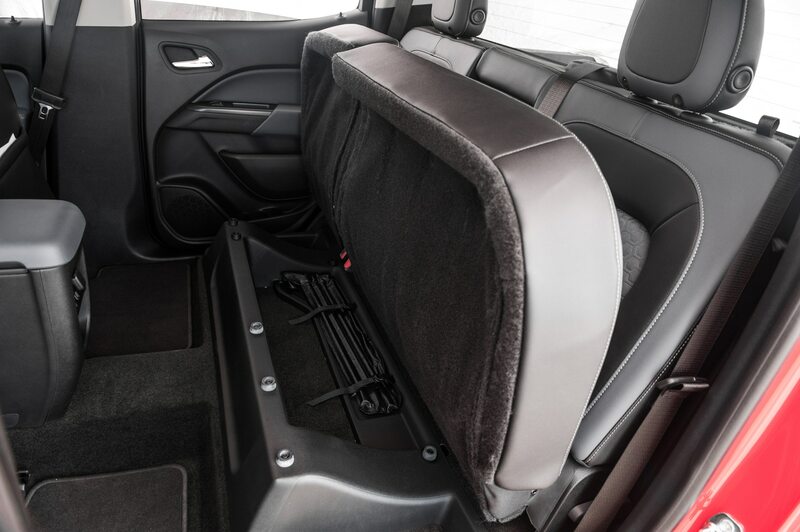 Two bucket seats with backs that can’t be adjusted out of an awkward near-90-degree angle and that don’t fold down are separated by a large, inexplicably placed center console good only for holding half-empty Big Gulps that migrated from the front cupholders. 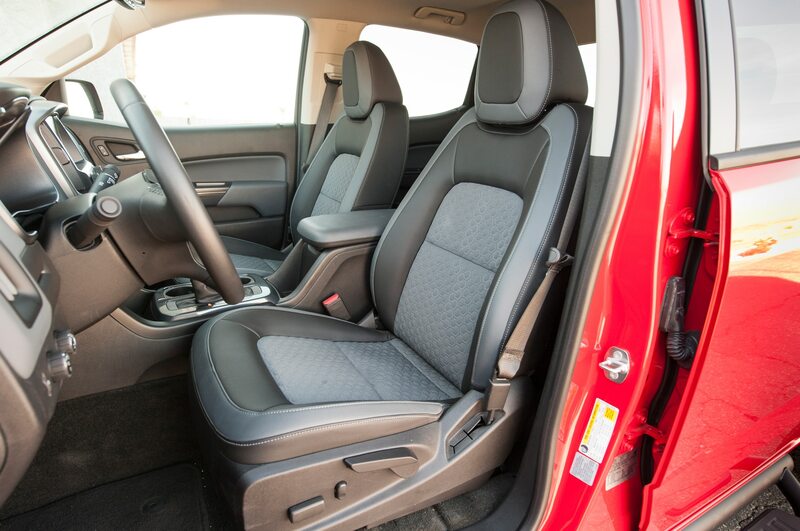 The space would have been better utilized with one inward-facing seat behind the passenger. 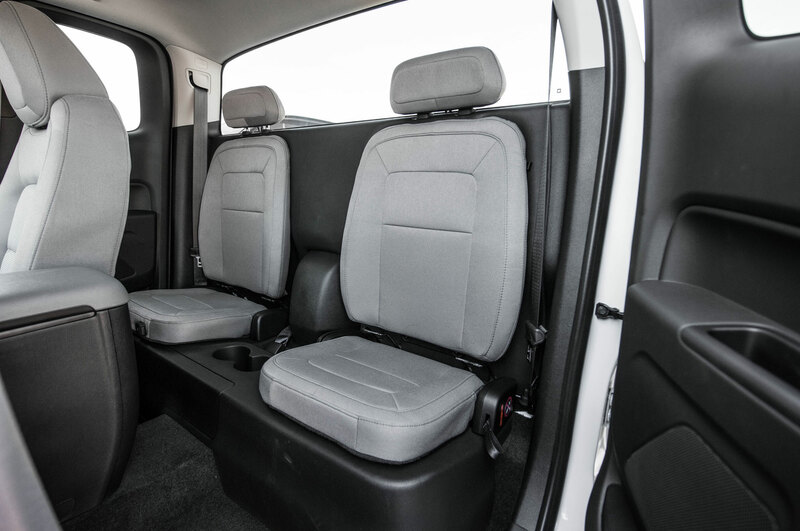 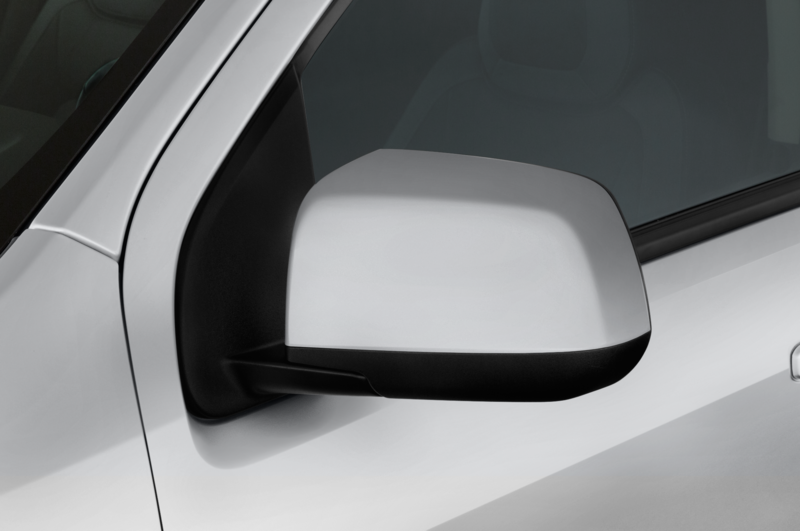 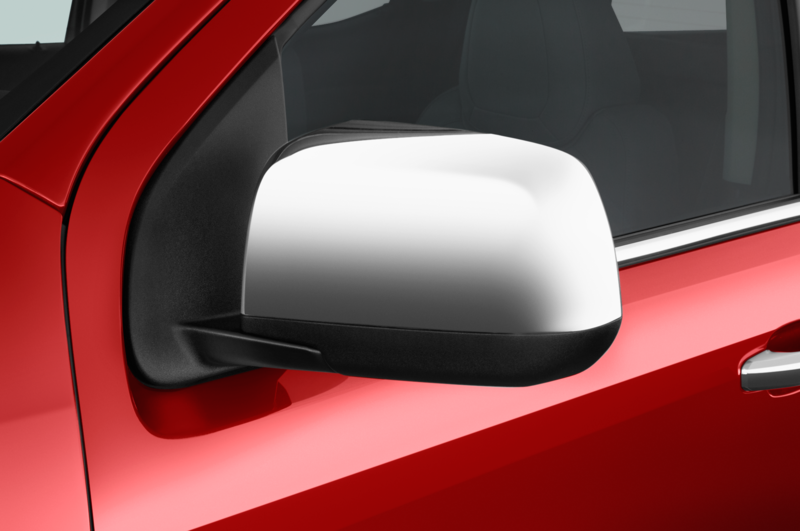 The only thing the extended cab was really good for with a passenger stuffed in back was increasing the driver’s blind spots. 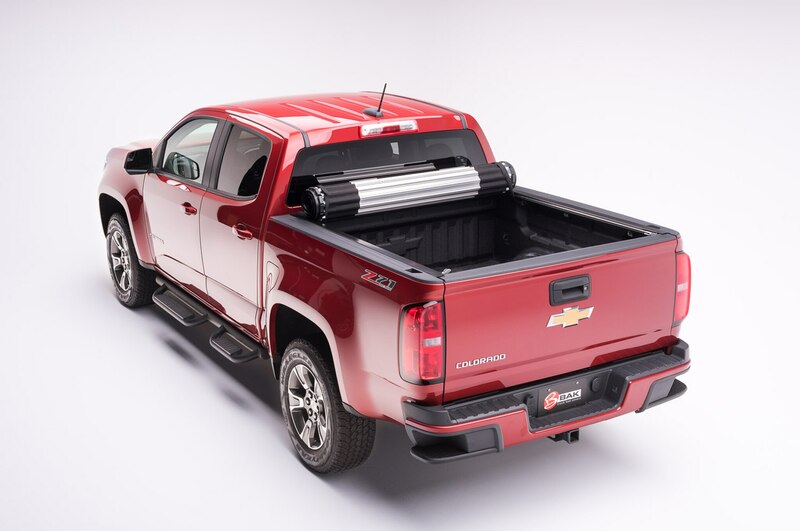 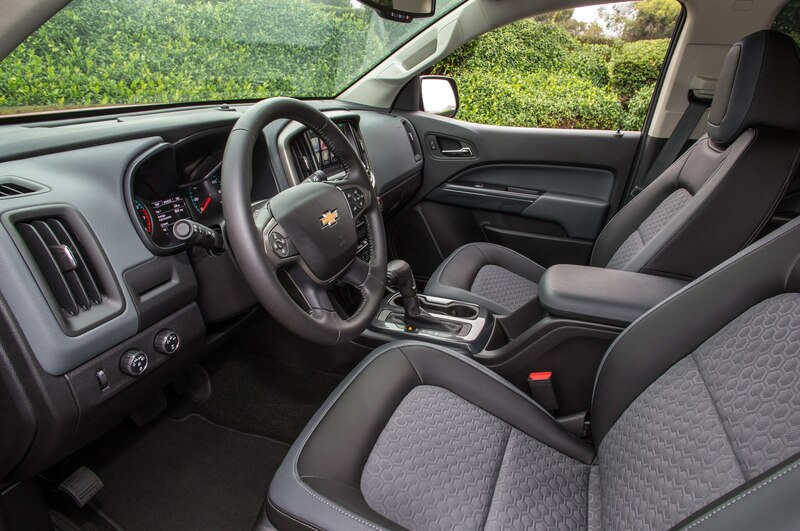 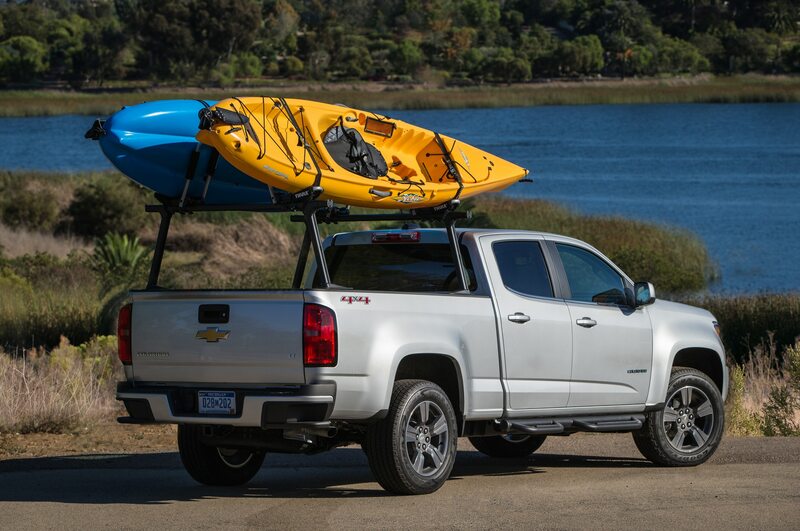 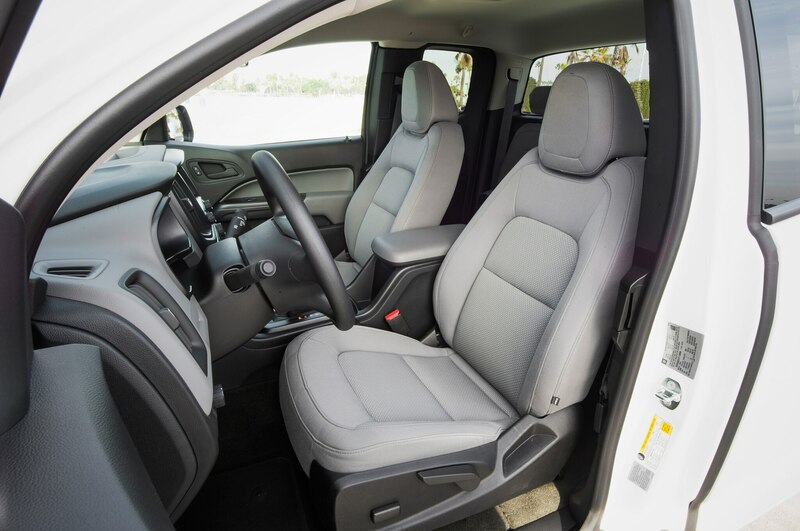 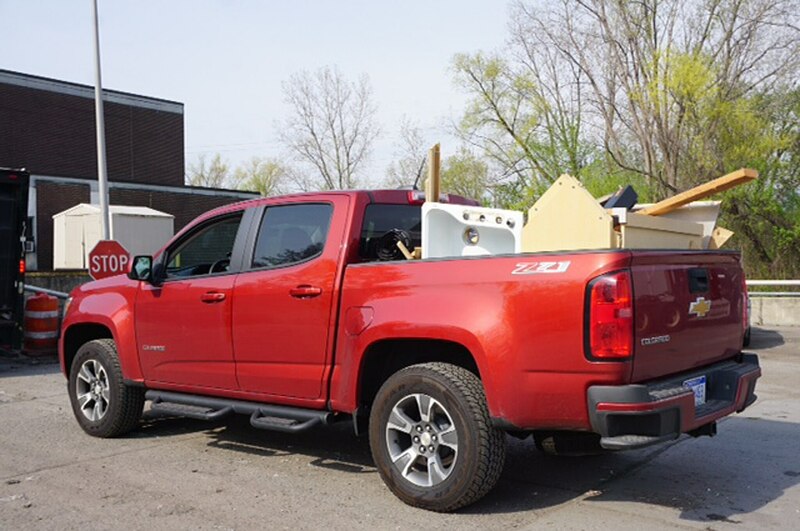 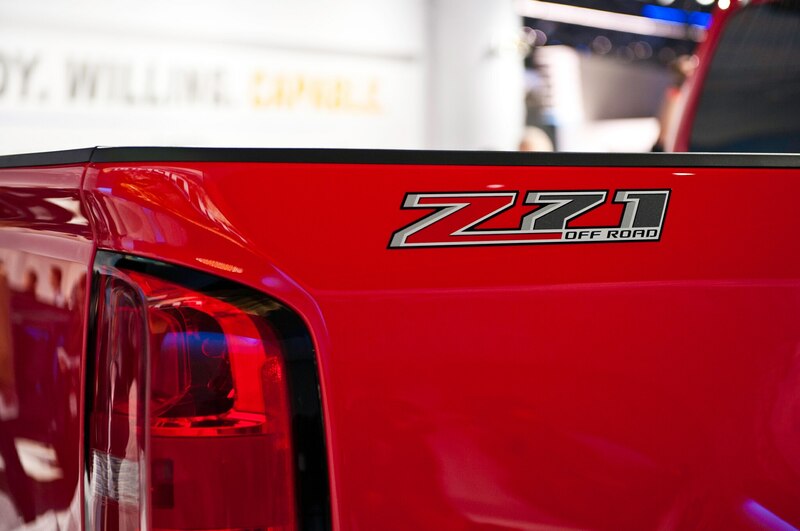 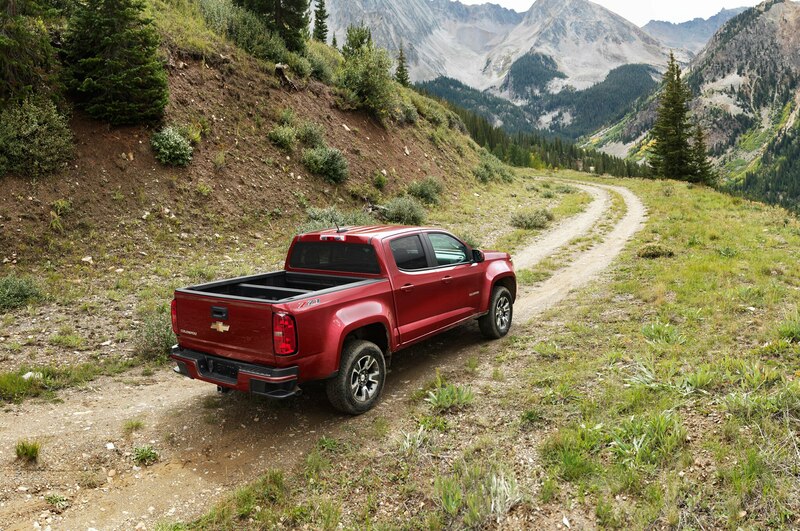 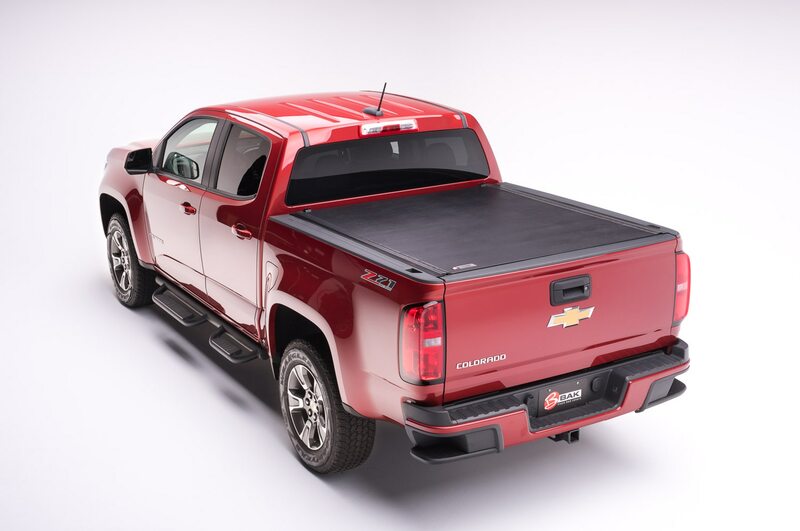 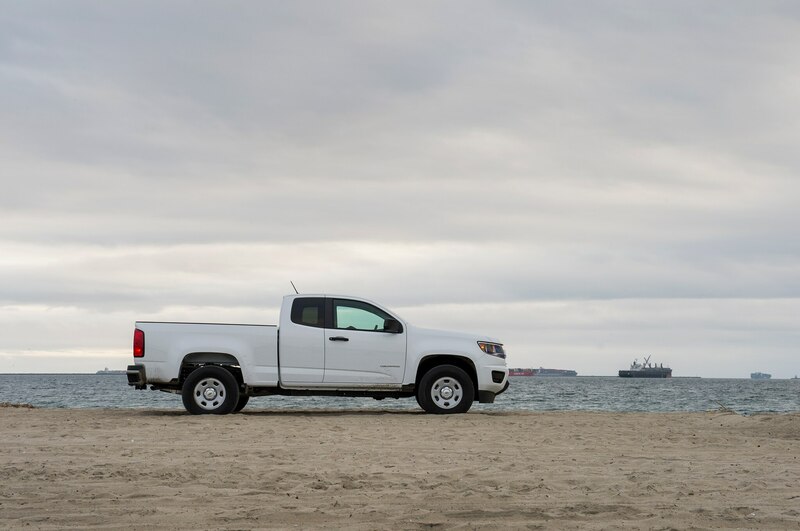 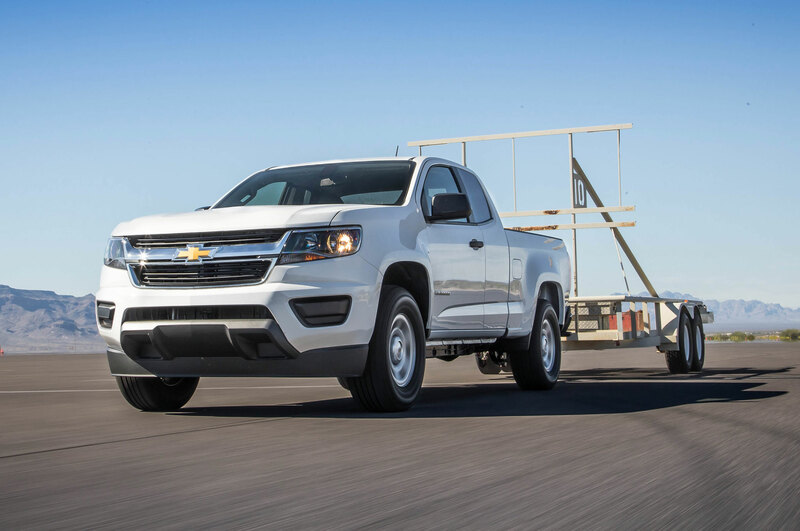 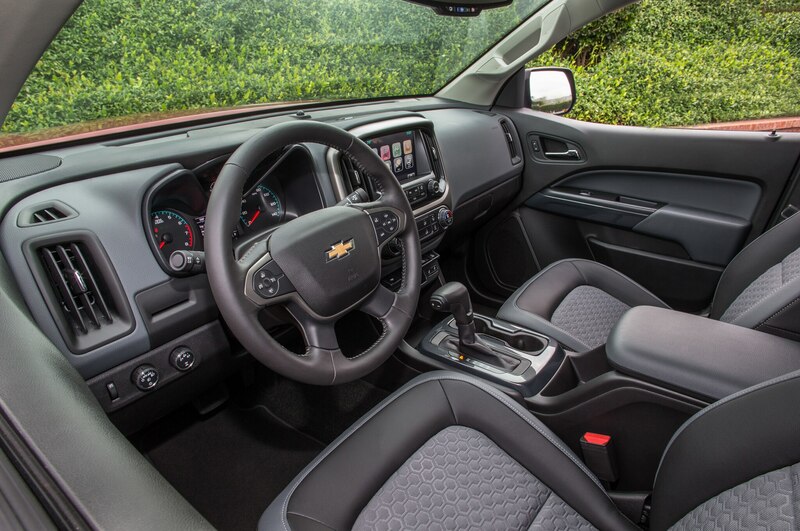 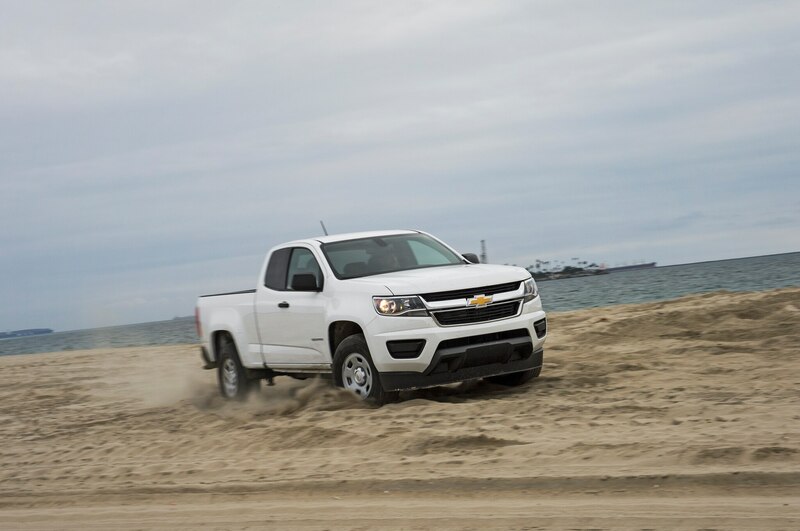 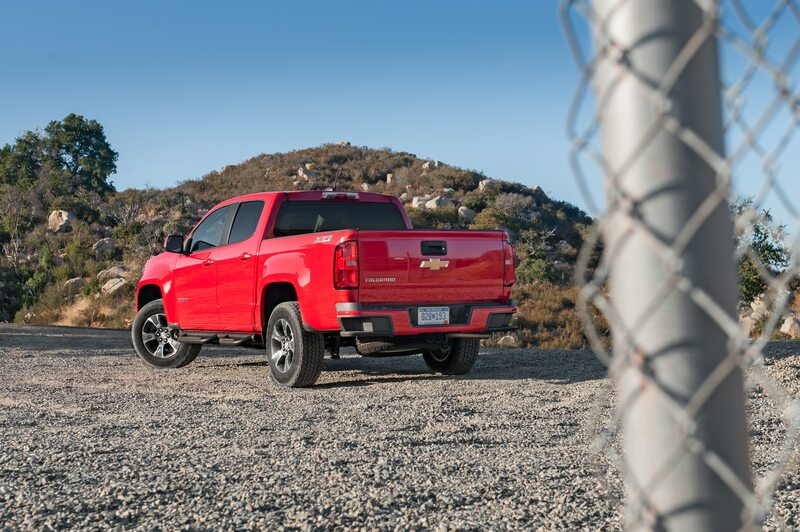 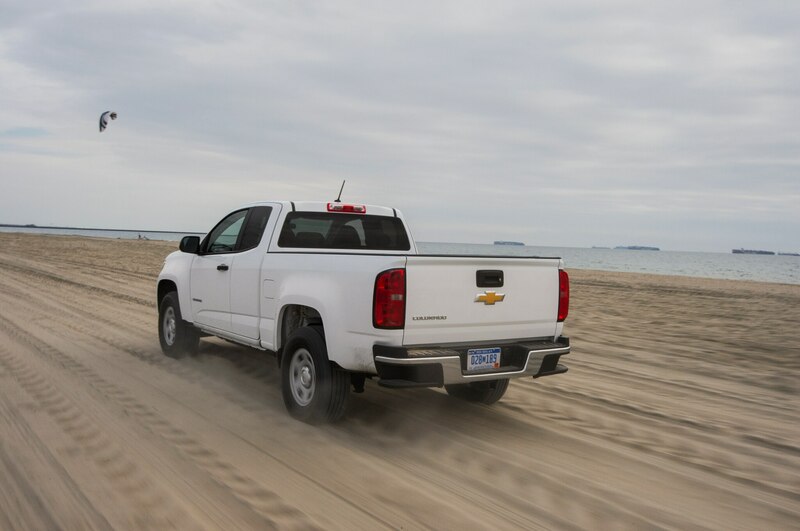 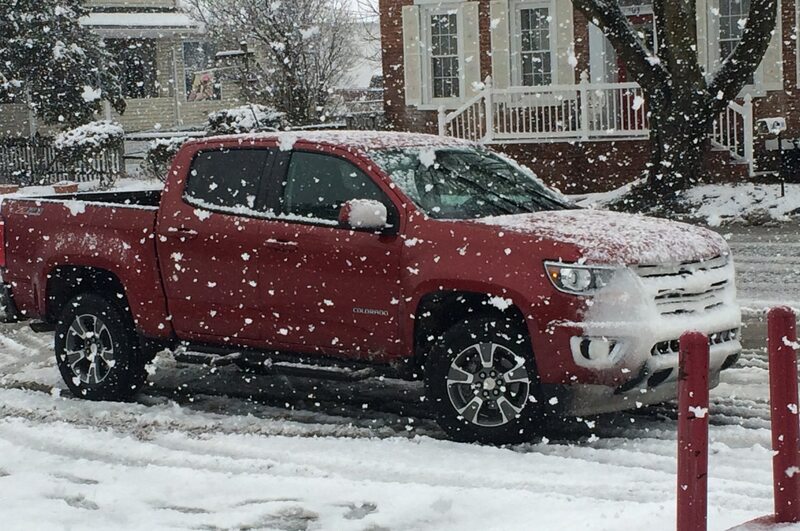 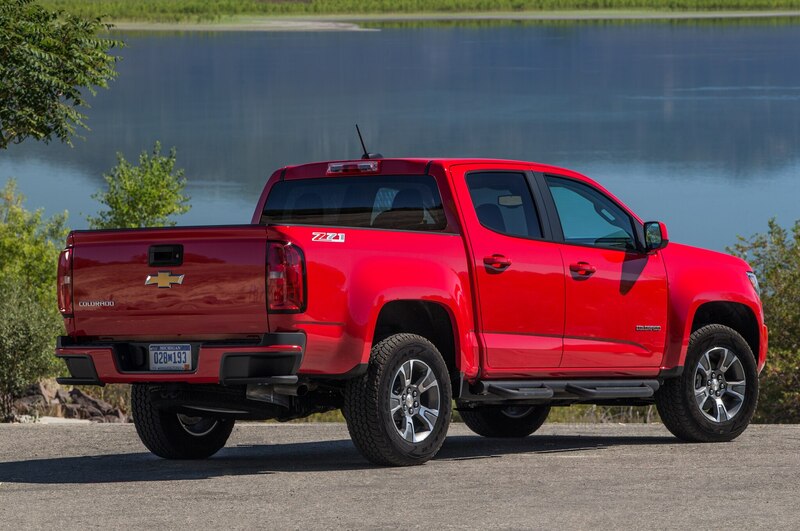 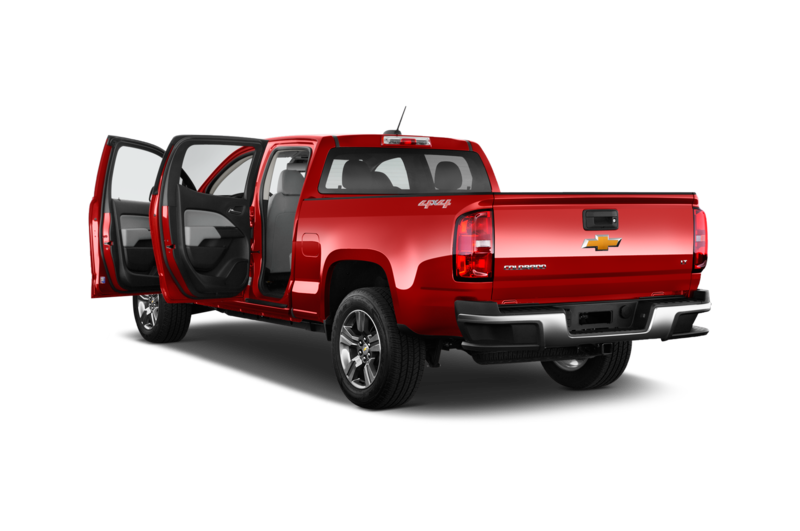 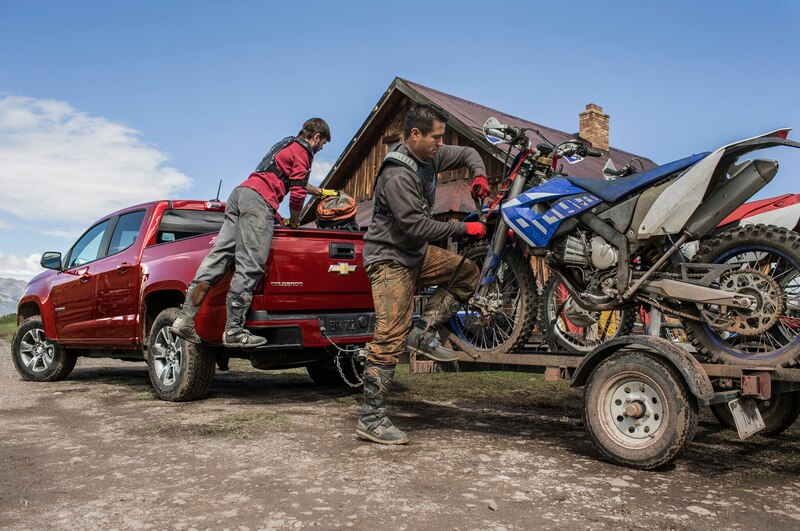 Despite its small pickup, large truck drawbacks, the 2015 Chevrolet Colorado 2WD Extended Cab Work Truck with extended cab proves itself a worthy option. 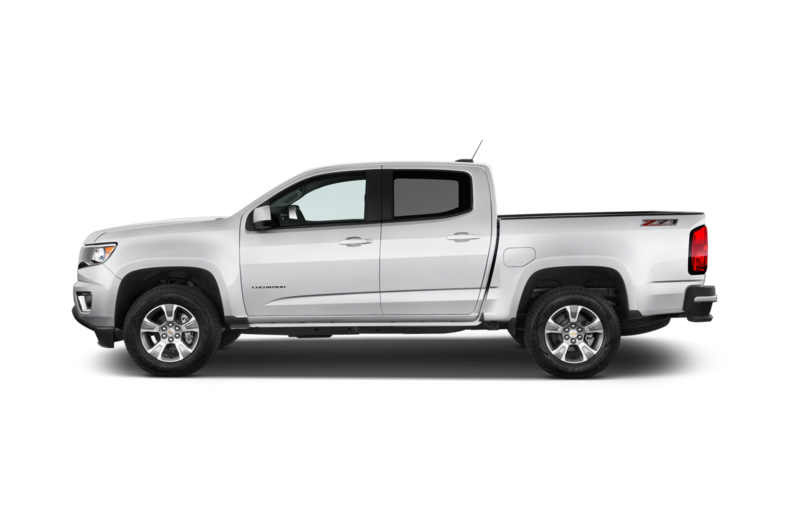 It’s a solidly built, reasonably priced, smooth-driving truck with good gas mileage that we’d recommend to the home improvement-inclined as well as those in labor-related trades like plumbers and painters.